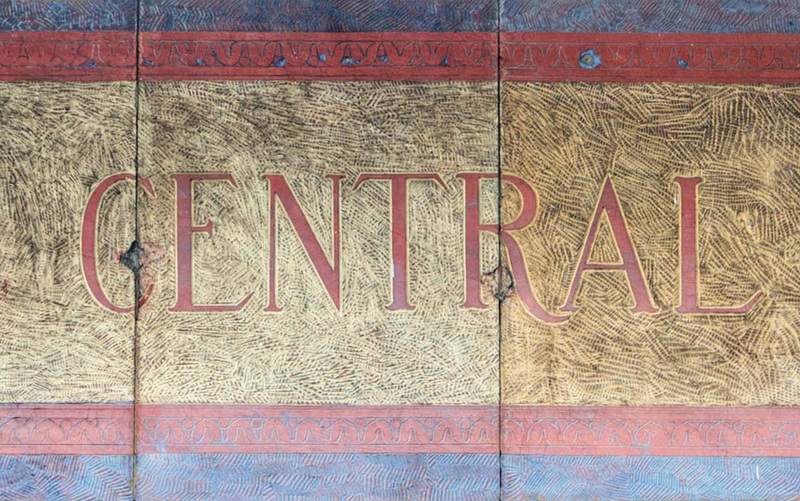 At the heart of the Grand Central Project was not just a station, but an entire set of buildings – A Terminal City. 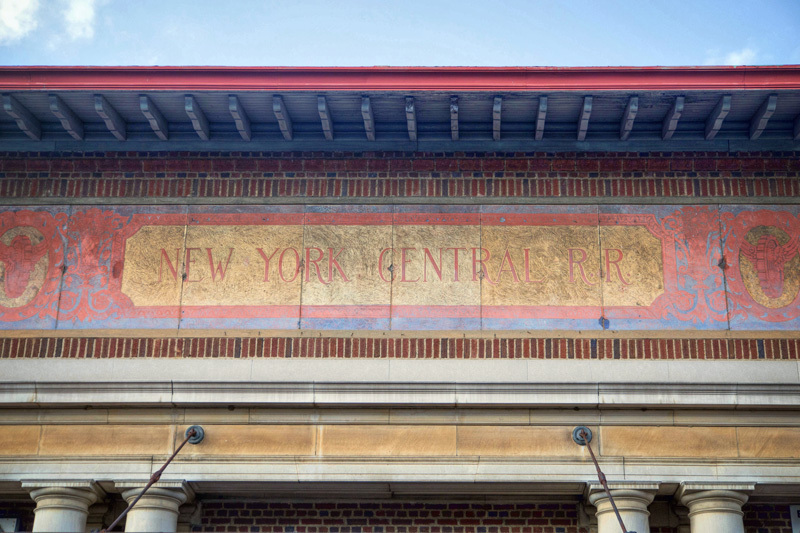 Minnesota architects Charles Reed and Allen Stem won the New York Central’s commission for designing the new Grand Central Terminal, with the assistance of Reed’s brother-in-law, William Wilgus. 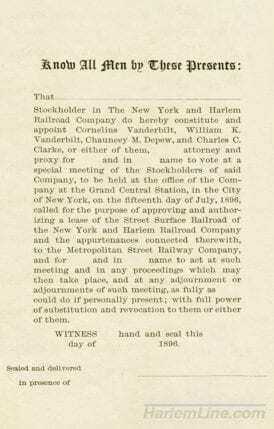 Later added to the project by the Vanderbilt family were cousin Whitney Warren and his partner Charles Wetmore. 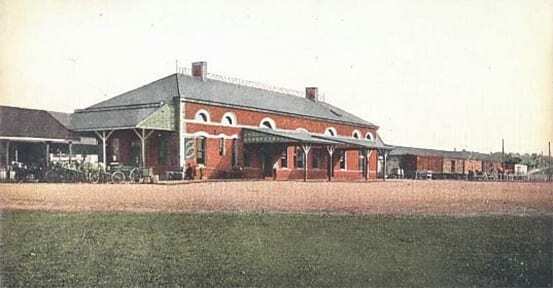 The four collaborated on the Terminal itself, as well as the redesigned Grand Central Palace. 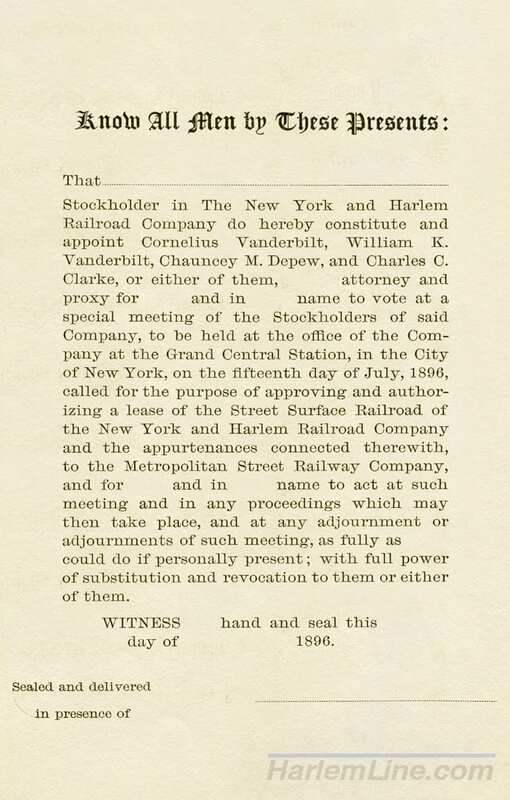 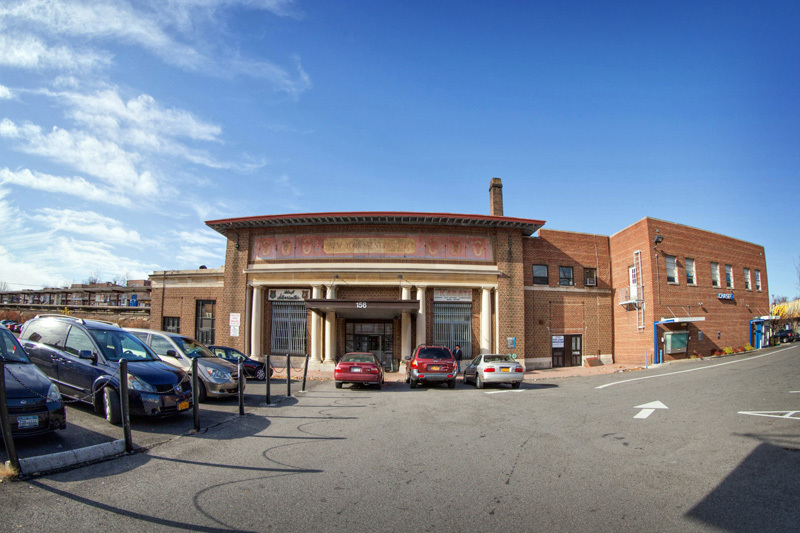 Other buildings associated with the project were divided between the two firms – the hotels and New York Central Building went to Warren and Wetmore. 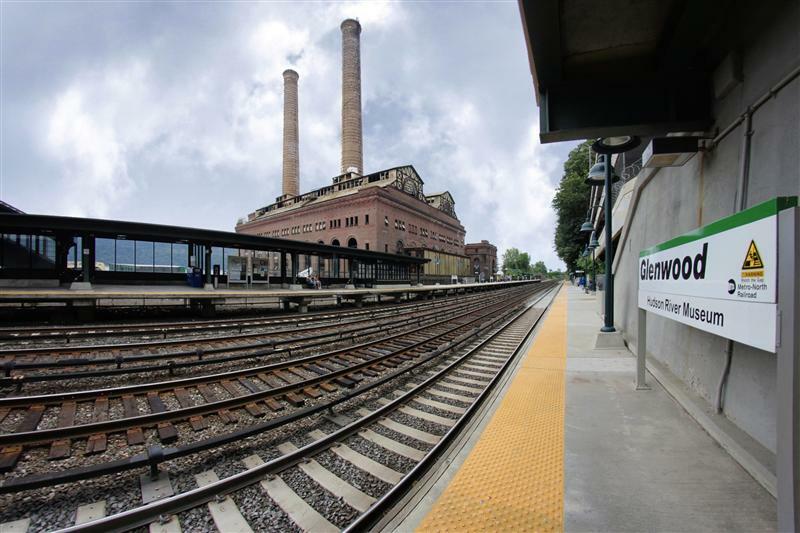 Though not the most important architecturally, the two most important buildings of all were designed by Reed & Stem – the power stations that powered these new electric trains. 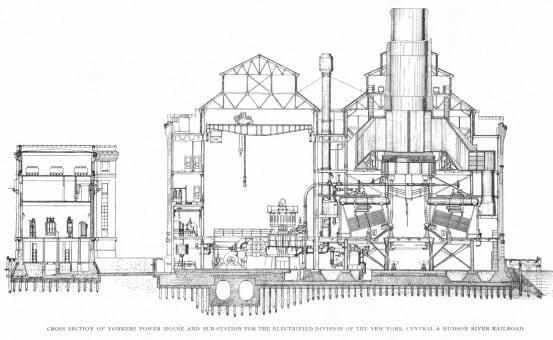 1905 sketches of the Yonkers (Glenwood) Power station (left) and Port Morris power station (right). 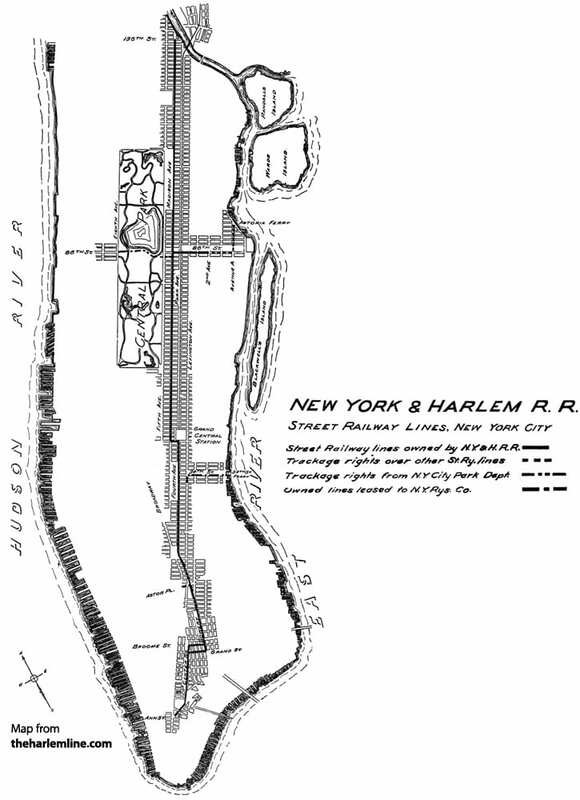 Two power stations were constructed by the New York Central in 1906 – one on the Harlem Division at Port Morris (the Harlem had a short branch to Port Morris at the time), and another in the Glenwood section of Yonkers on the Hudson Division. 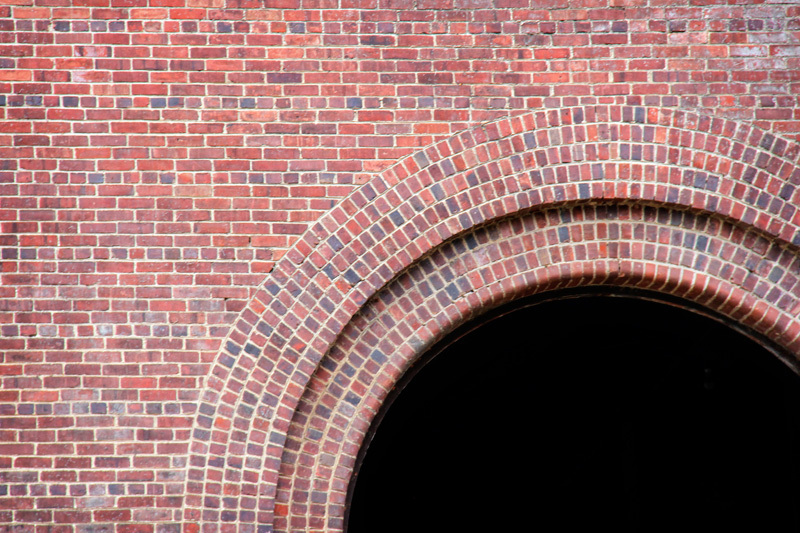 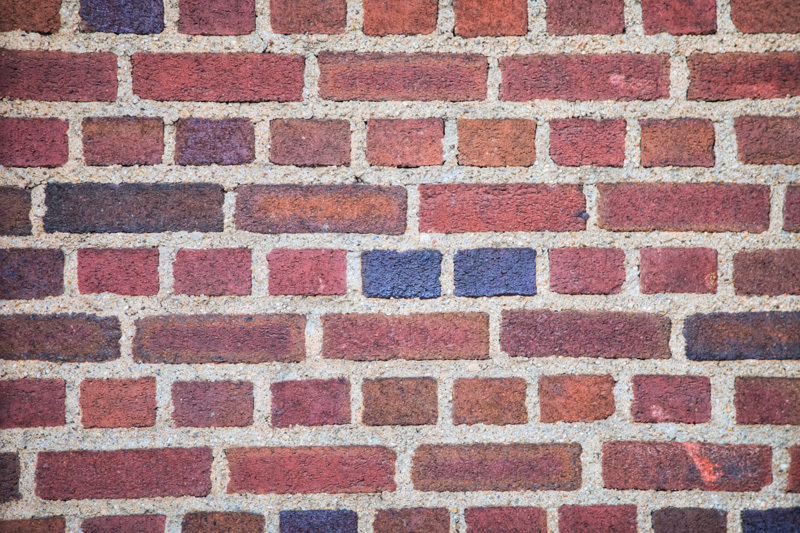 The architecture of both, as designed by Reed and Stem, was relatively simple with brick and terra cotta on the outside. 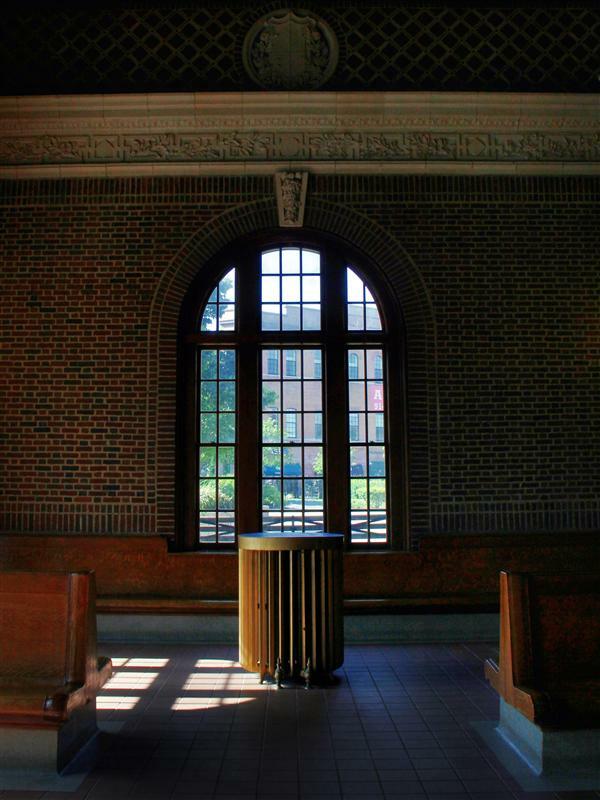 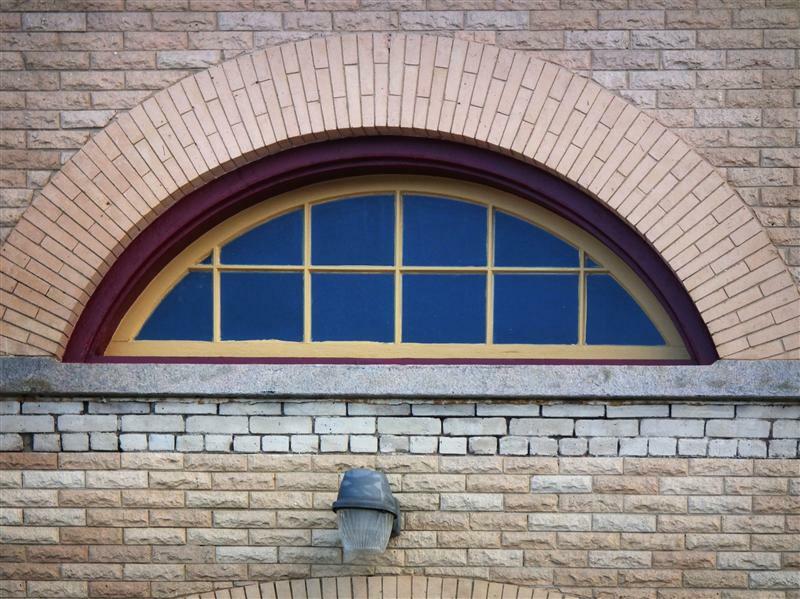 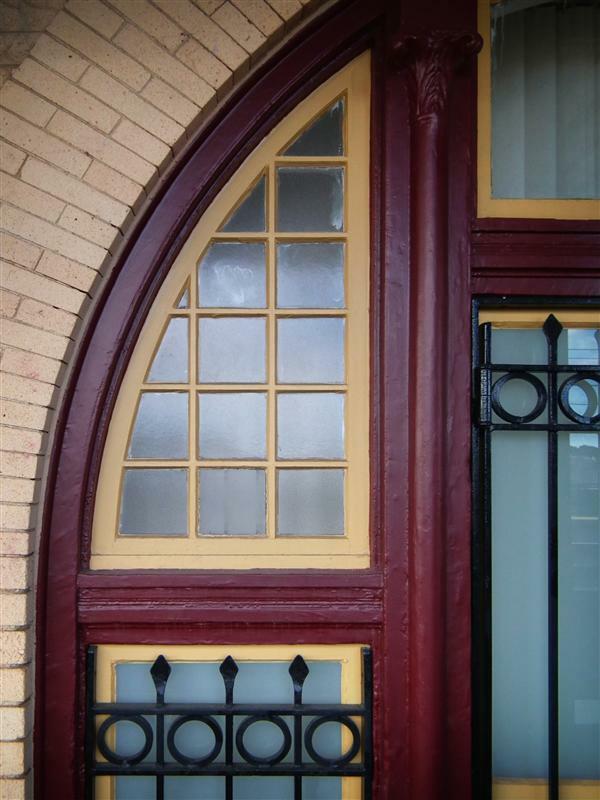 Long, arched windows provided natural light during the day, and an attractive glow along the water at night. 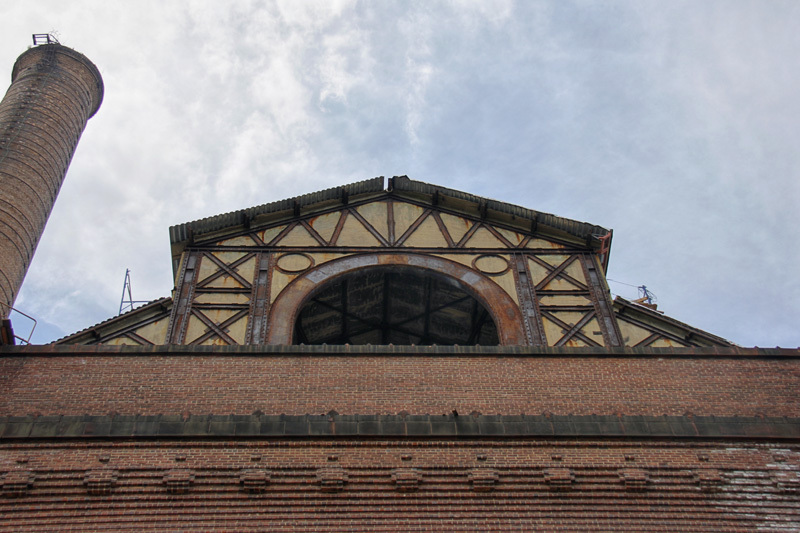 Under that simple exterior lay an extensive framework of steel (2800 tons of steel in total), with concrete flooring, brick and tile walls, and concrete roofing slabs covered with copper. 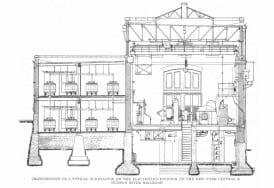 Each plant consisted of two buildings – a main building that enclosed a boiler room, coal bunker, and generating room which was 167′ wide, 237′ long, and 105′ high, and a separate swich house located about 40′ away from the main building. 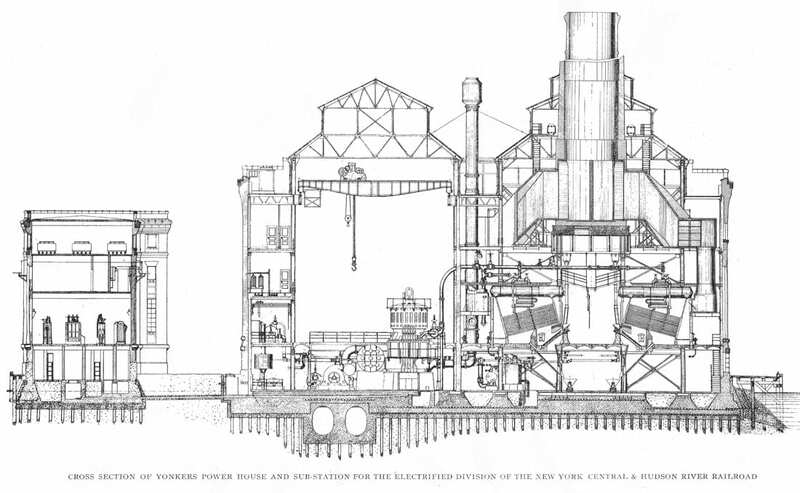 1905 plans for the Yonkers and Port Morris power stations, as well as a typical substation. Both power stations were cross-connected, and each had an ultimate capacity of 30,000 kw. 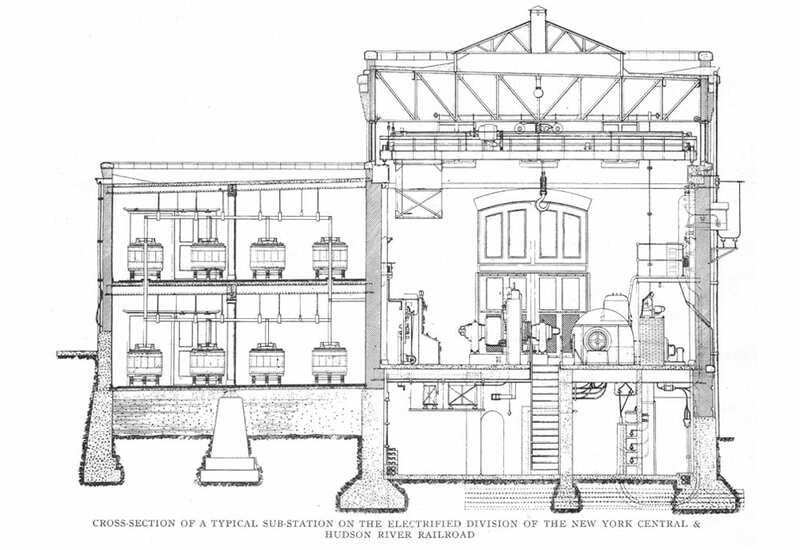 Just as Grand Central was designed to handle more traffic than the railroad was currently operating, the power stations were designed to carry train service much greater than what was being operated at the time with steam locomotives. 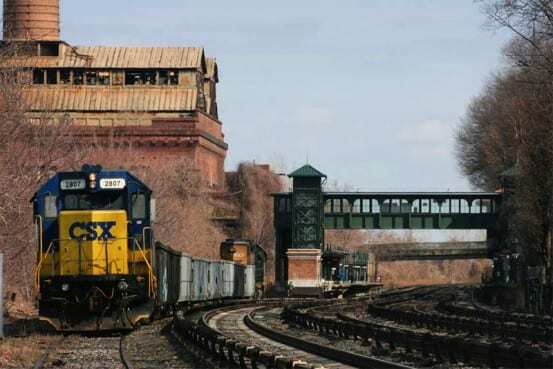 Powered by coal, the plants were both designed to receive coal by rail or by boat, which was then delivered by conveyors to a crusher. 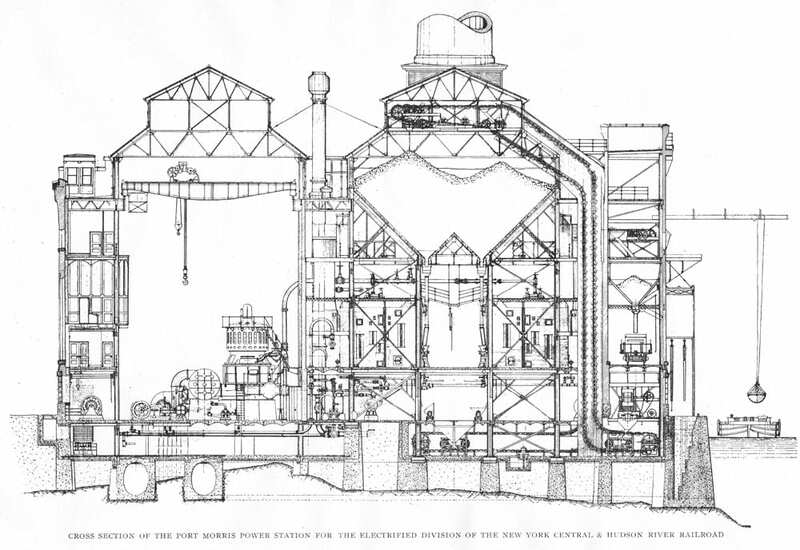 After the coal was crushed to the necessary size, it was delivered by another conveyor to a coal bunker with a 3500 ton capacity at the top of the building. 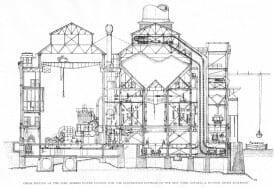 Each plant had 24 Babcock and Wilcox water tube boilers, and was designed to accommodate 6 5000kw Curtis vertical turbo-generators. 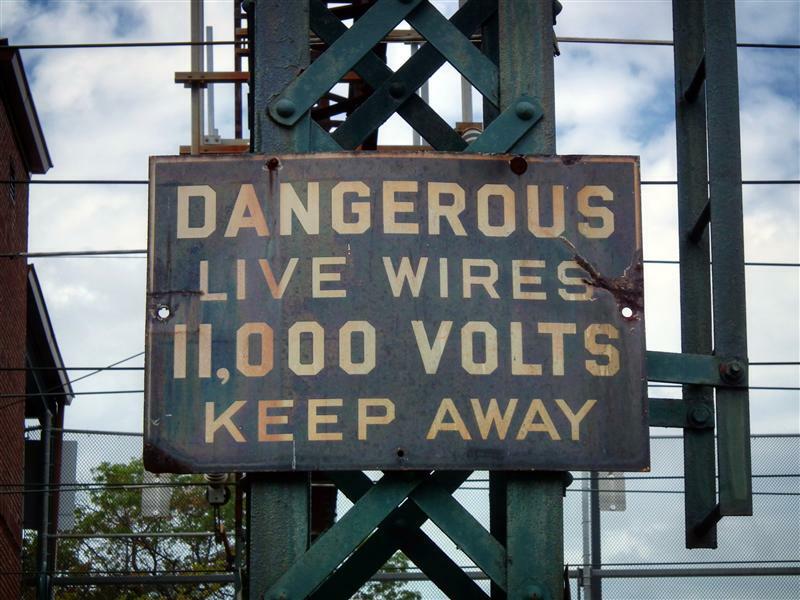 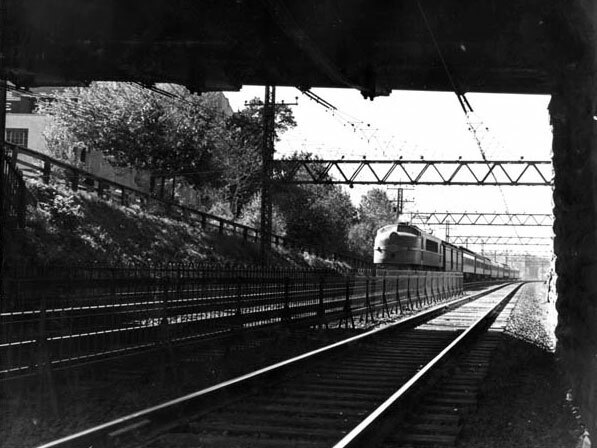 The high voltage AC electricity provided by these power plants was delivered to various substations along the Harlem and Hudson Divisions through insulated cables, where it was then converted to lower voltage DC power for the third rail to power trains. 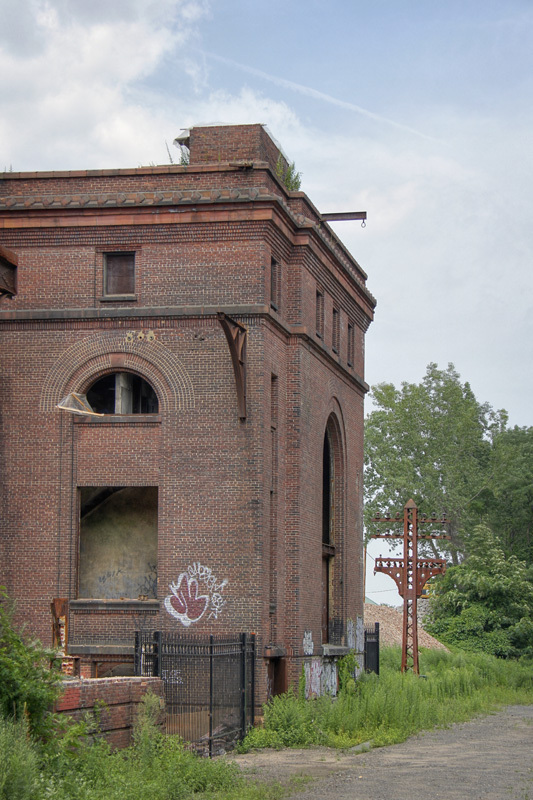 The power station today, after being abandoned for decades. 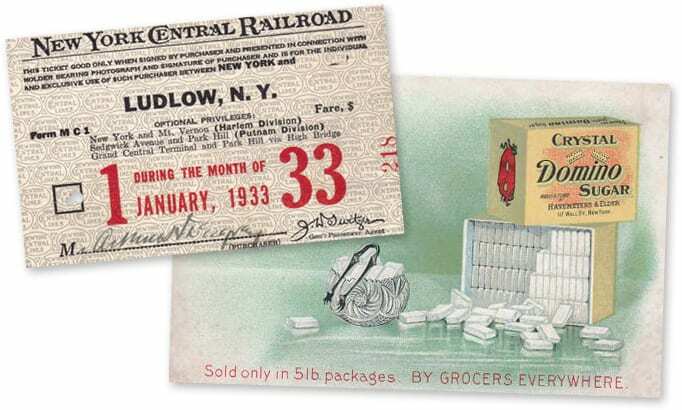 Though integral to the initial operations of Grand Central Terminal, the New York Central eventually realized that it would be cheaper to purchase energy as opposed to generating its own, and the Glenwood plant was sold to Con Edison in 1936. 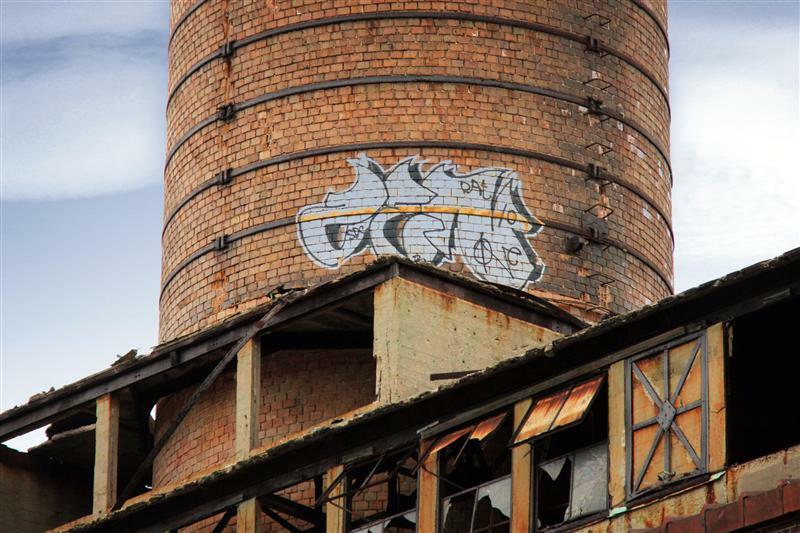 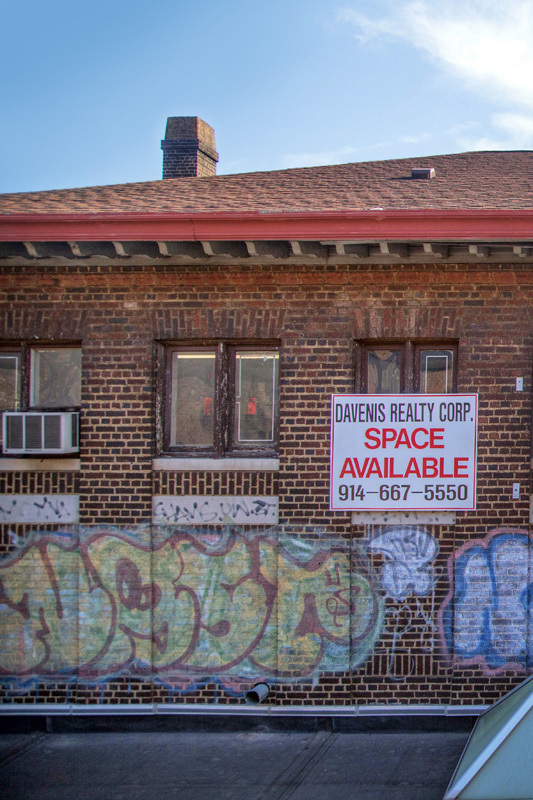 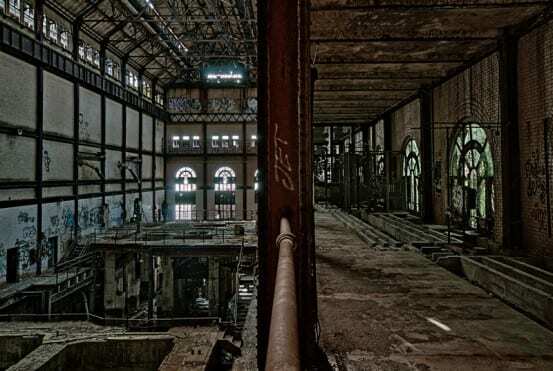 By the late ’60s the obsolete plant was shuttered and remained abandoned for decades… until fairly recently. 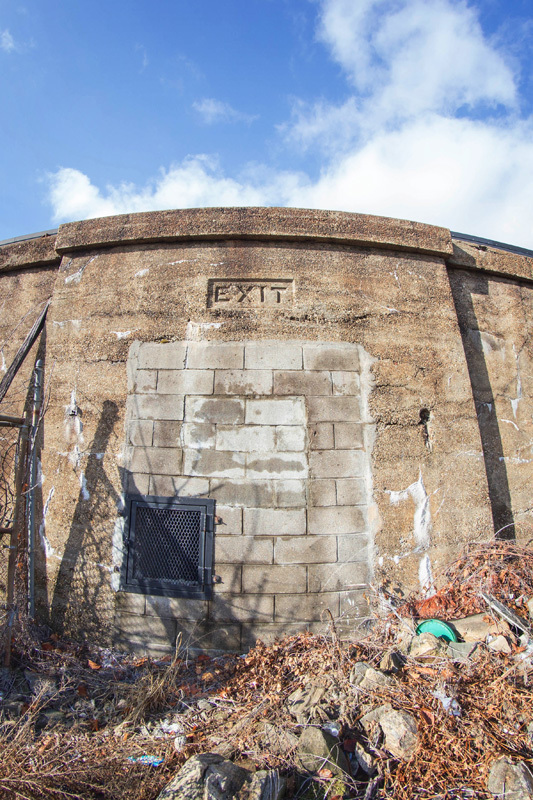 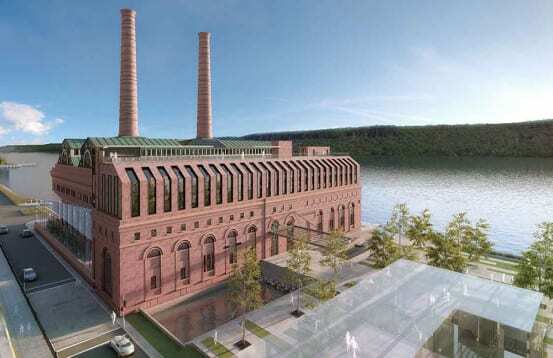 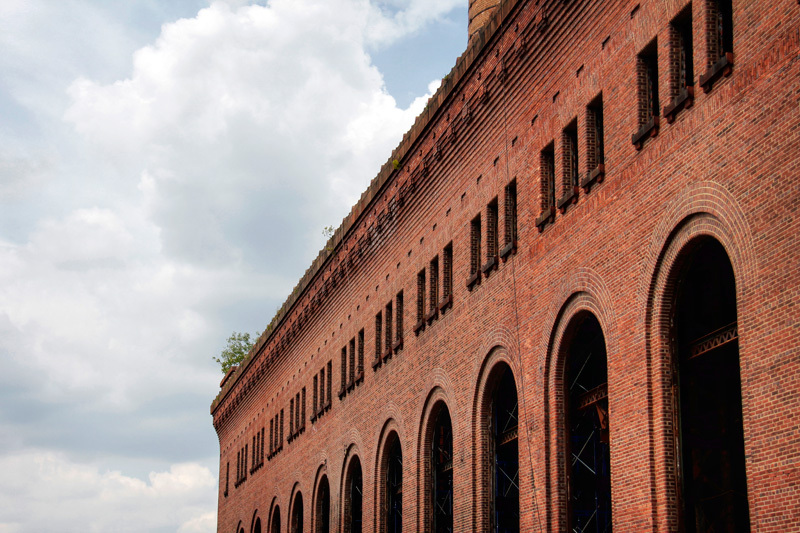 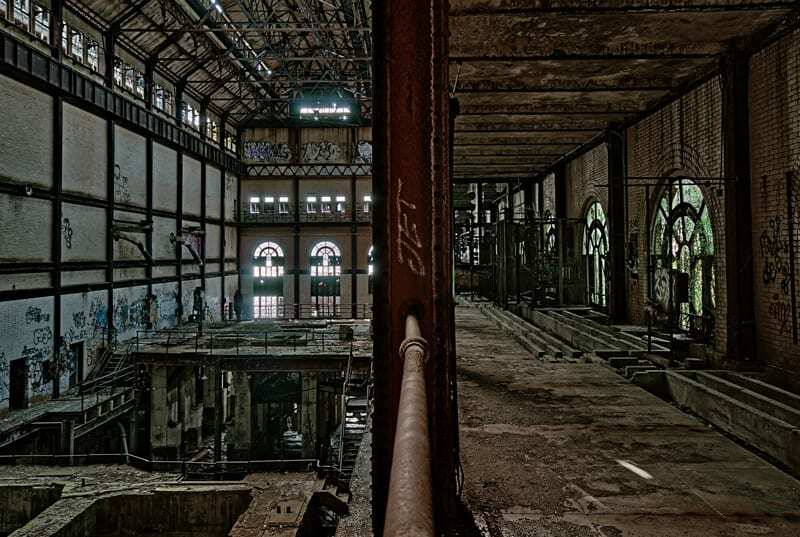 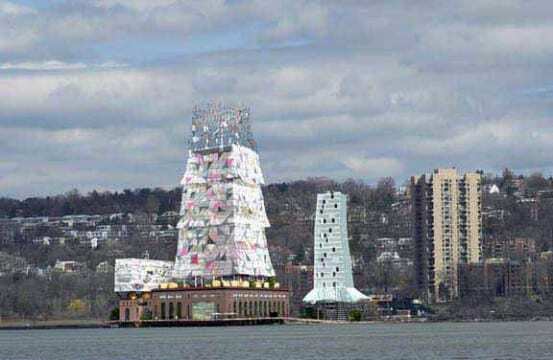 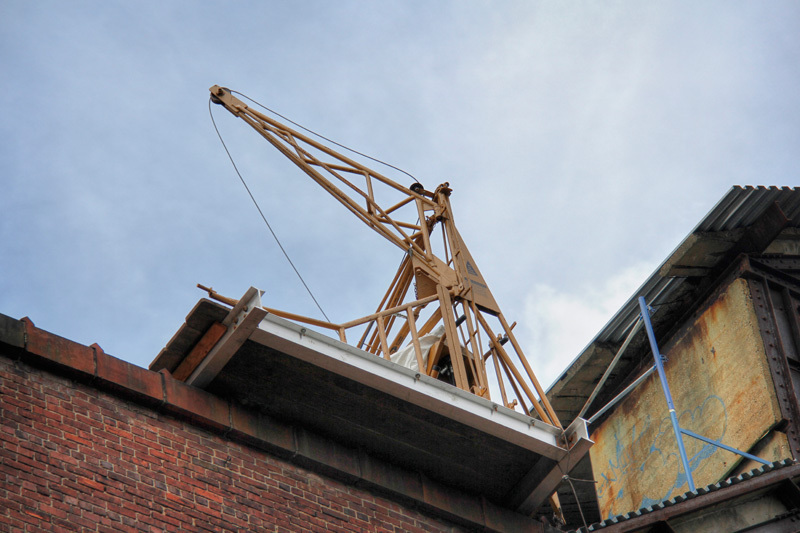 A bold plan to restore and repurpose the old power station has been on the table for a few years, but seems to be moving forward thanks to the assistance of New York politicians. Rendering of how the redeveloped power station would look. 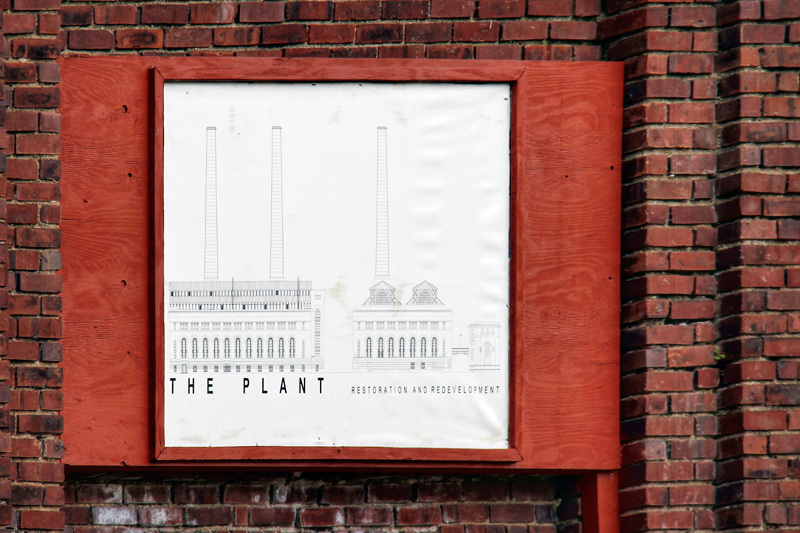 “The Plant” project looks to turn the crumbling power station into a hotel and a convention center, with a capacity of 1600 and 3500 people, respectively. The space is separated into four distinct parts – the Smokestack Building, the Great Turbine Hall, a courtyard, and the Switch House Building – all of which will be connected internally with a new corridor. 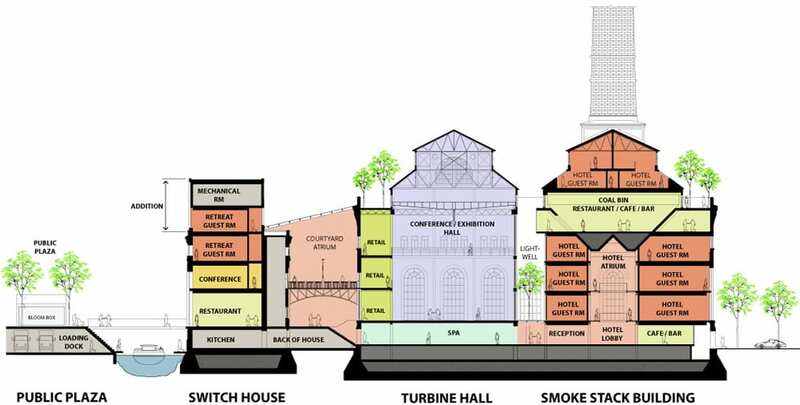 The smokestack building would contain a reception area, and cafe on the ground floor, and a hotel on the upper floors. 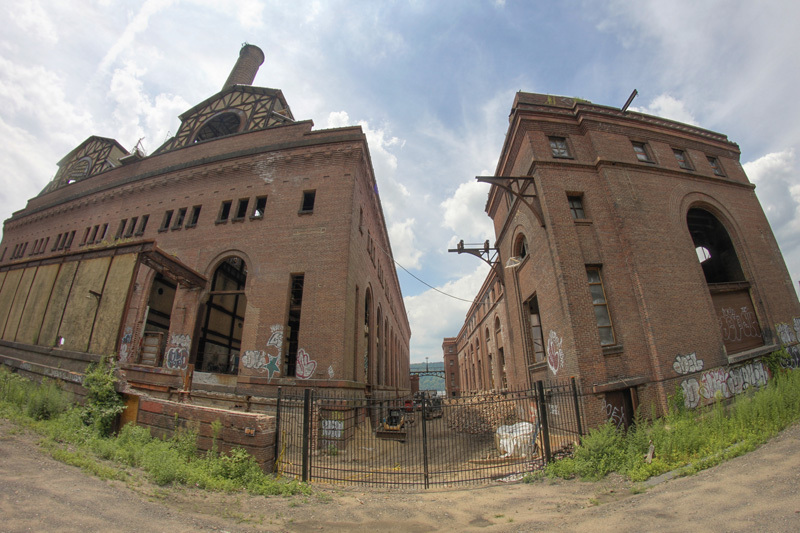 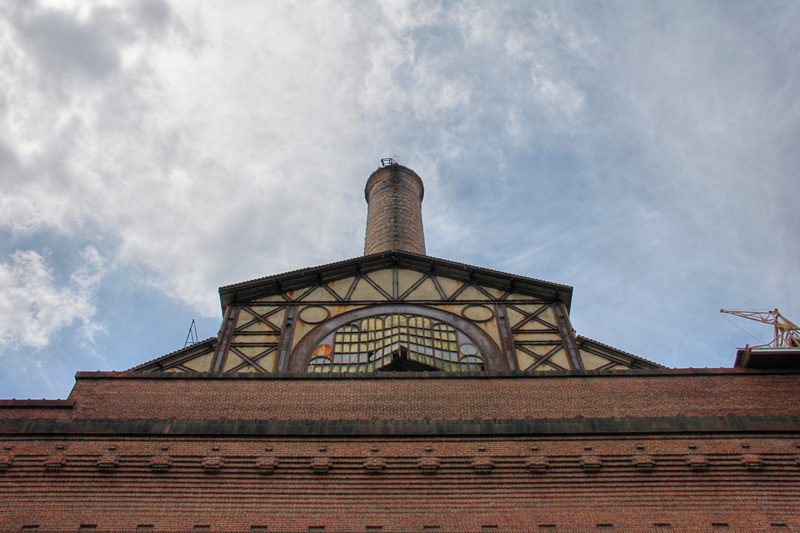 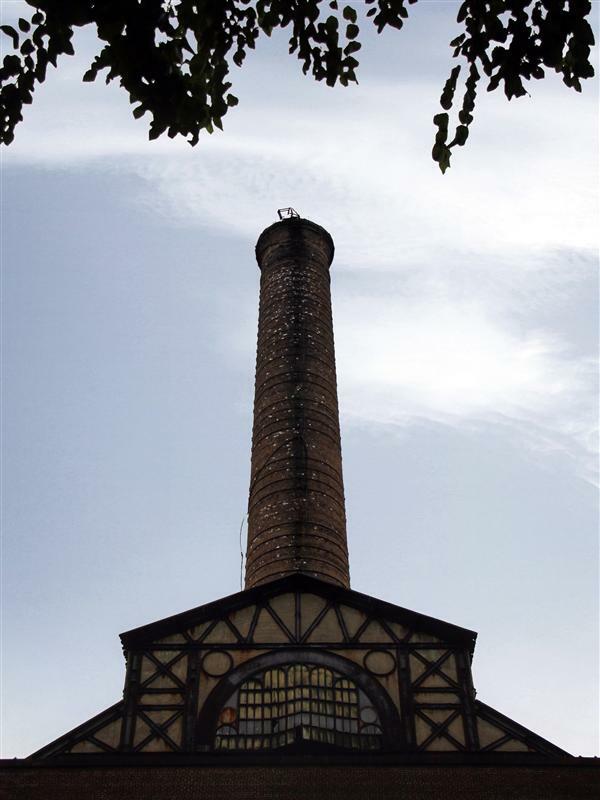 Not only will the smokestacks be preserved, plans call for meeting rooms to be constructed inside the 15’6″-diameter stacks. 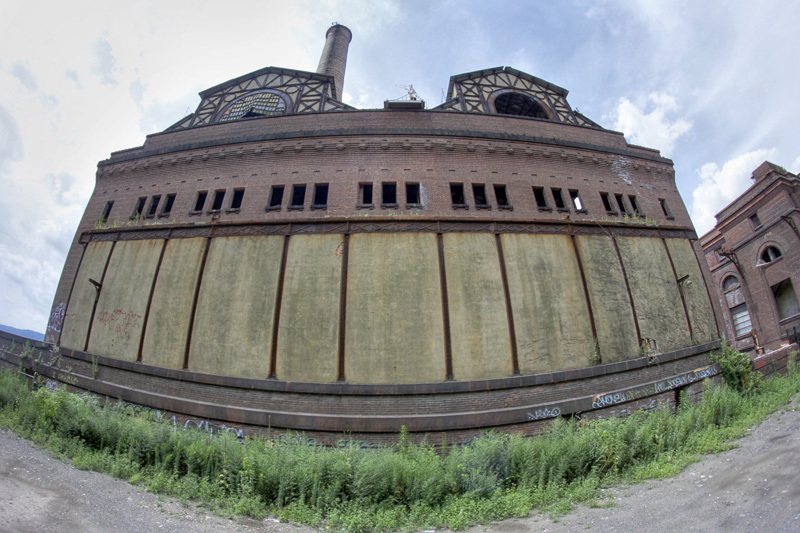 A large convention center and exhibition space is planned for the Great Turbine Hall, upper floors may contain retail shops, and the building may also include a spa. 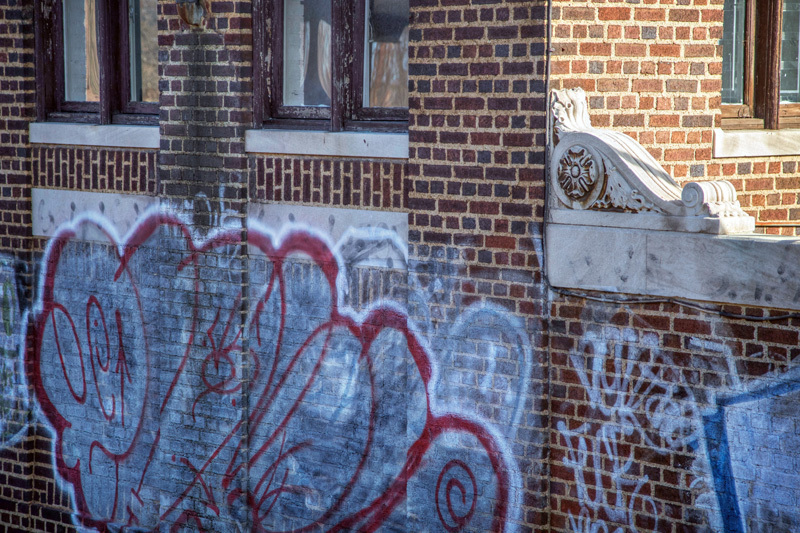 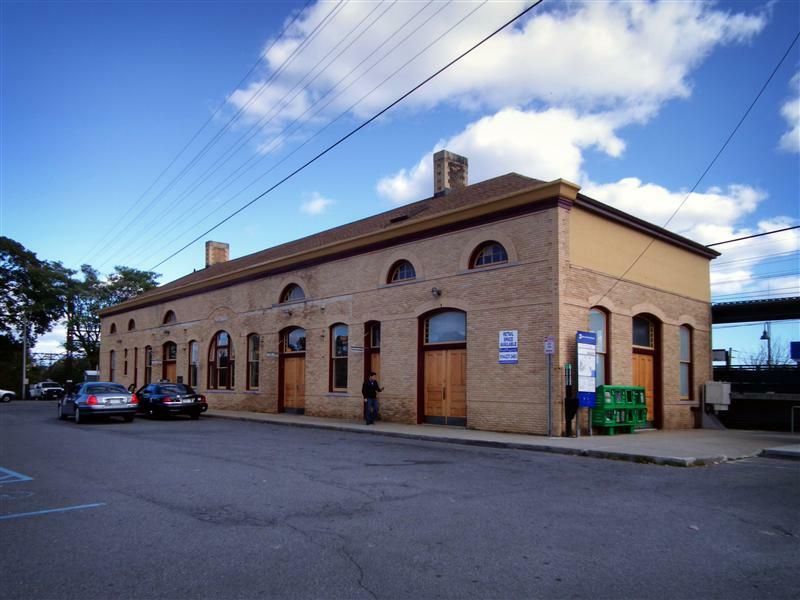 The last building to be converted, the Switch House Building, will be converted into a corporate retreat with a hotel, ballroom, restaurant and cafe. 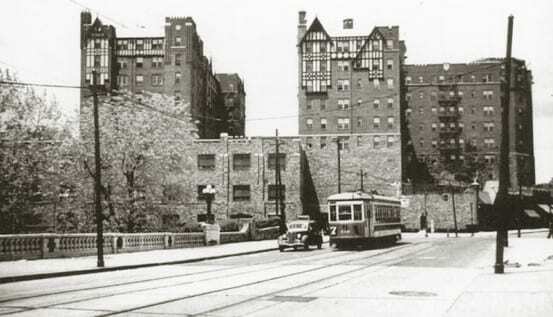 This building would see the most changes from the original, as two stories would be added to the building for additional hotel space. 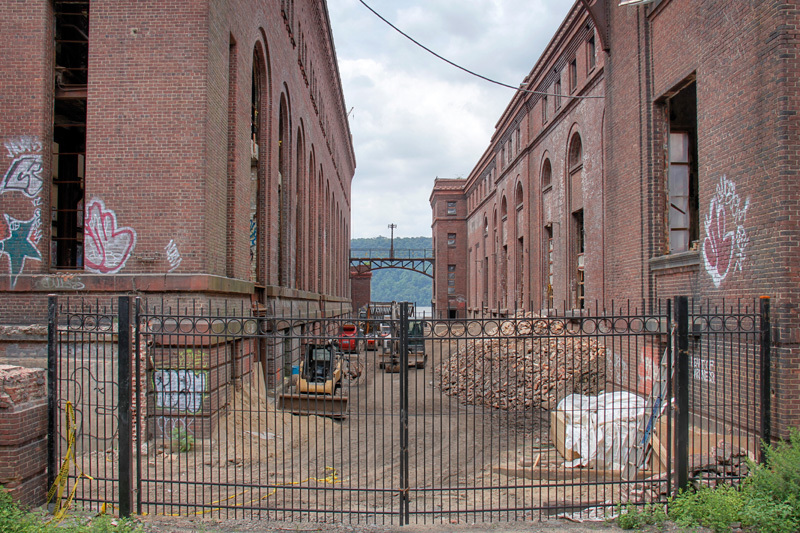 The last section of the project would be the Courtyard, currently an open space between the buildings. 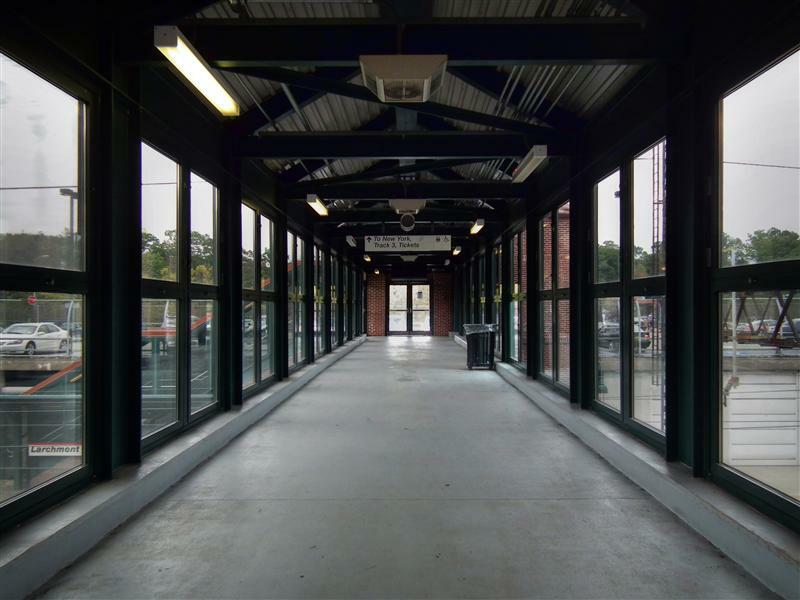 This open air area would be enclosed with a glass roof and would contain a restaurant or cafe, and a seasonal garden. 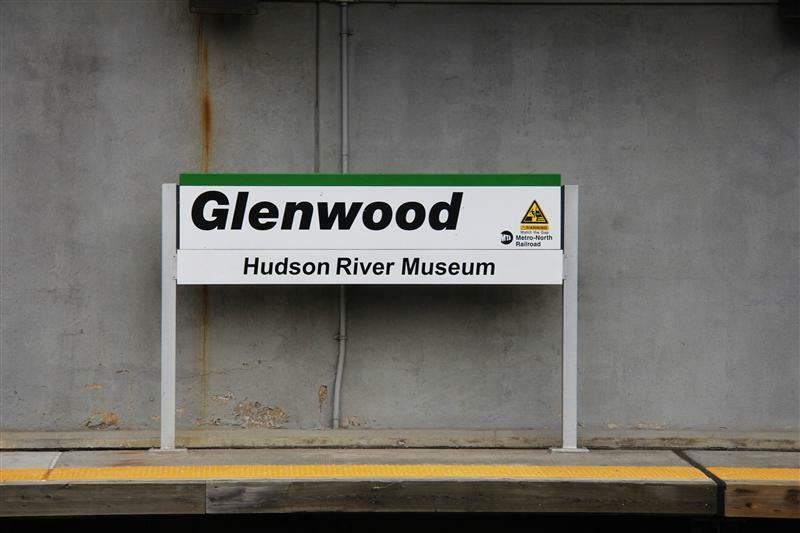 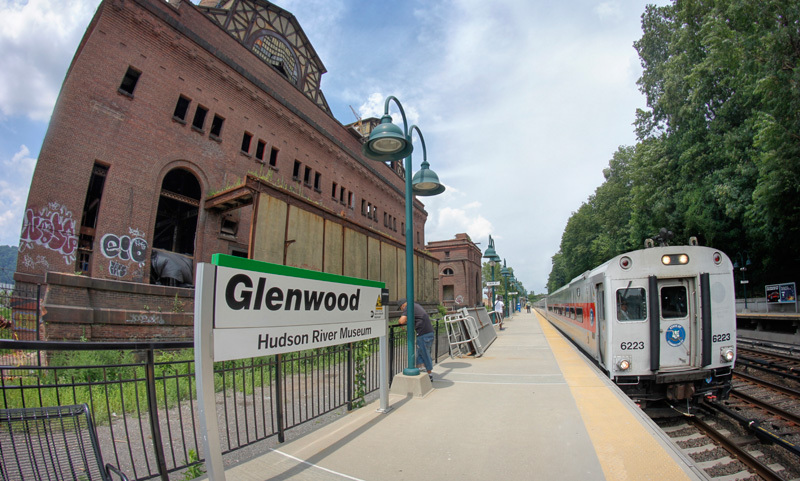 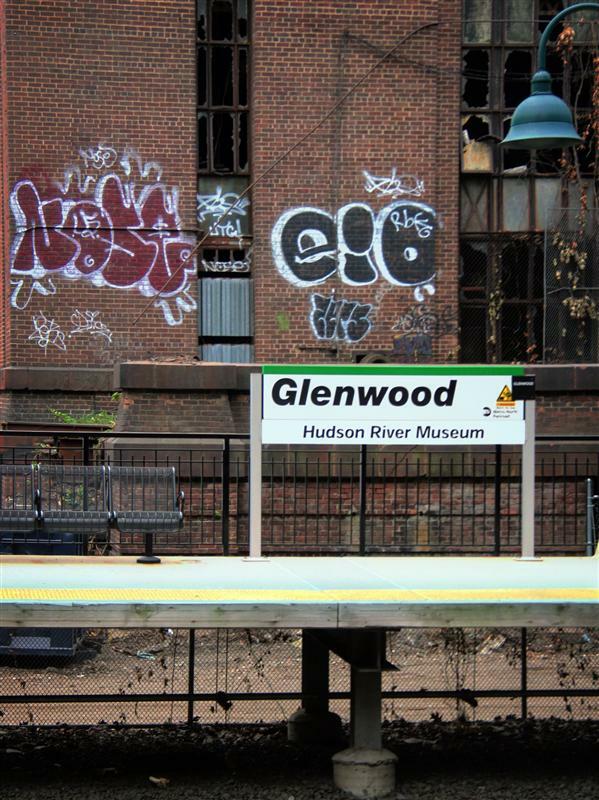 All of the aforementioned buildings would be connected to the Metro-North station at Glenwood via a new pedestrian bridge over the railroad tracks. 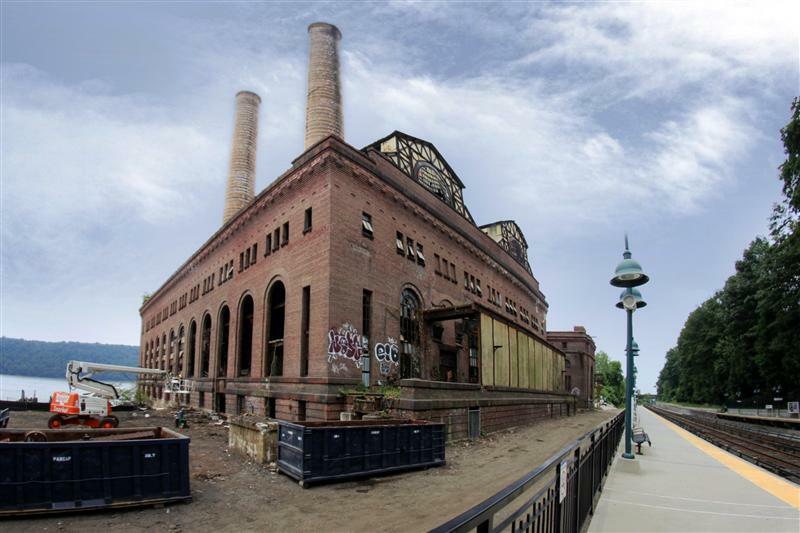 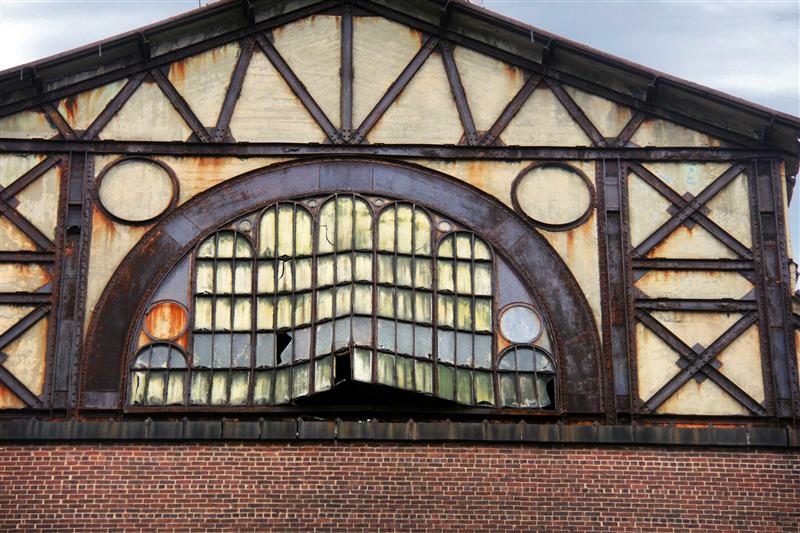 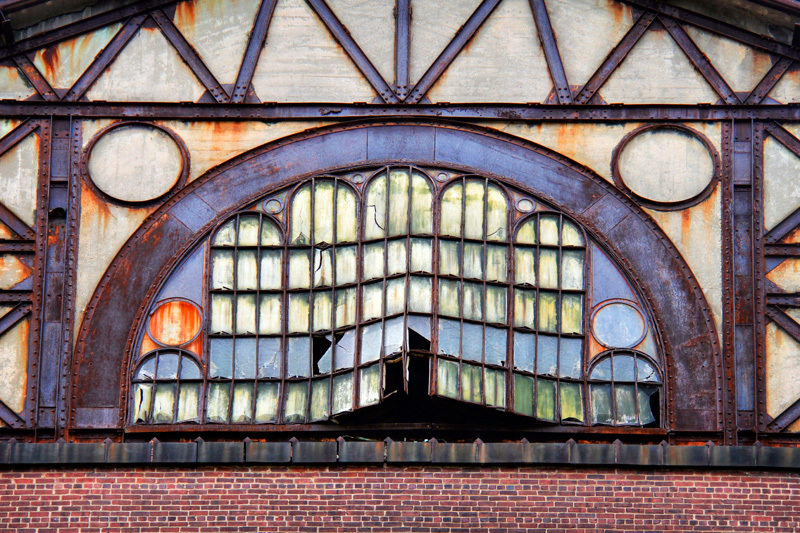 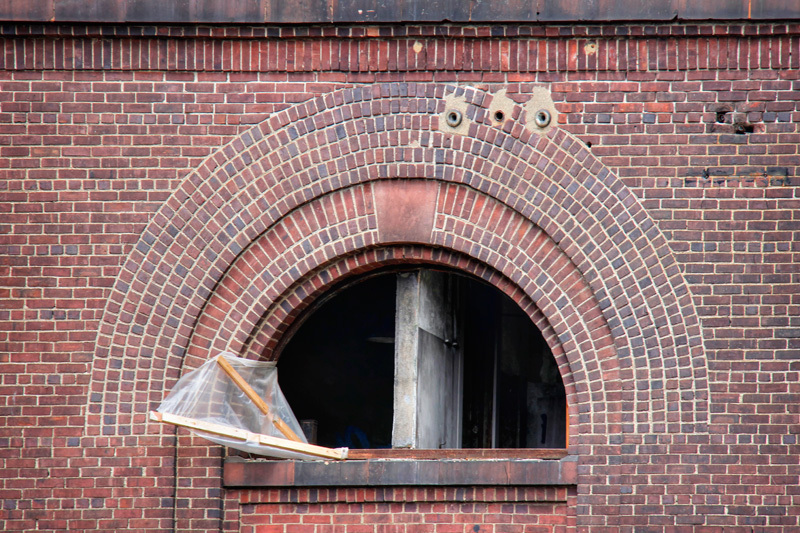 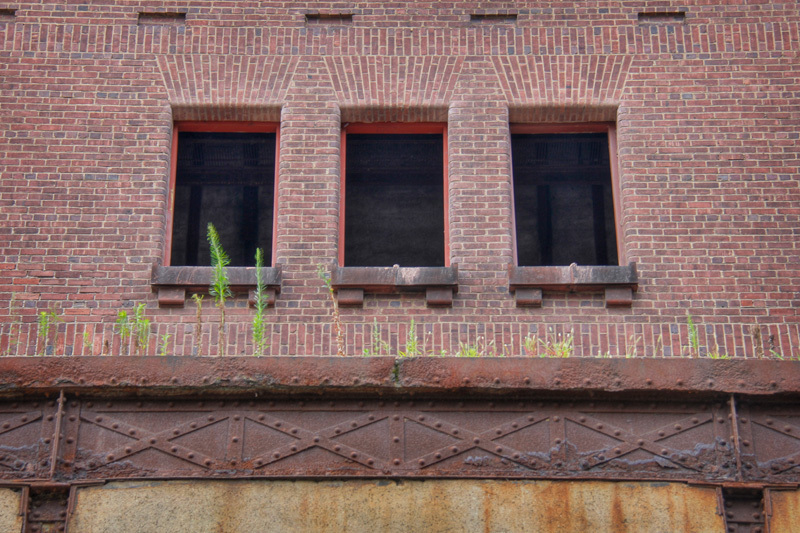 While there will always be people opposed to development in their neighborhood, the plans for restoring and repurposing the old power station were generally well received. 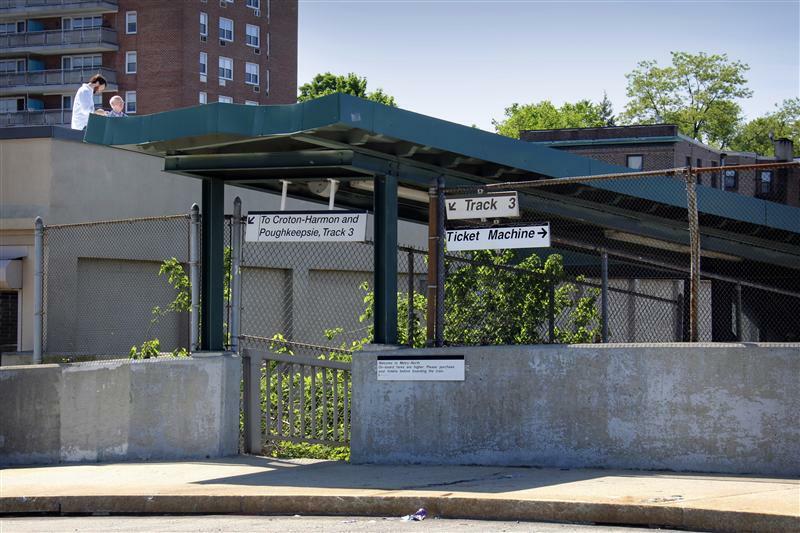 Unfortunately, the area surrounding the site contains no space for parking, and project planners had their eyes on portions of nearby Trevor Park to fit that need, which was not well received by locals. 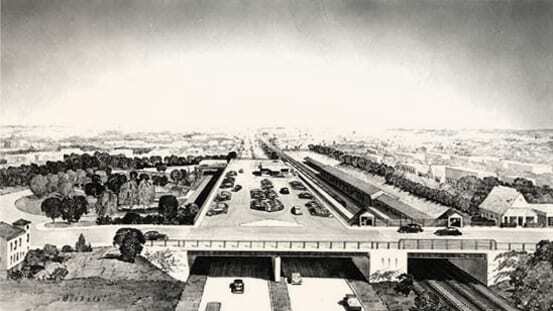 Original plans called for a partially underground parking structure under the current Trevor Park, with artificial turf ball fields to be constructed above. 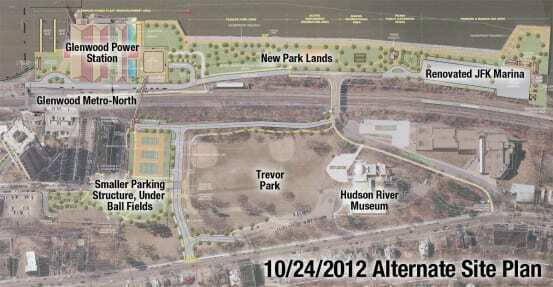 After comments from the public, alternate possibilities have been suggested. Either way, the city council unanimously decided at the end of April to request the New York State Legislature to authorize construction on former park lands for the project to move forward. 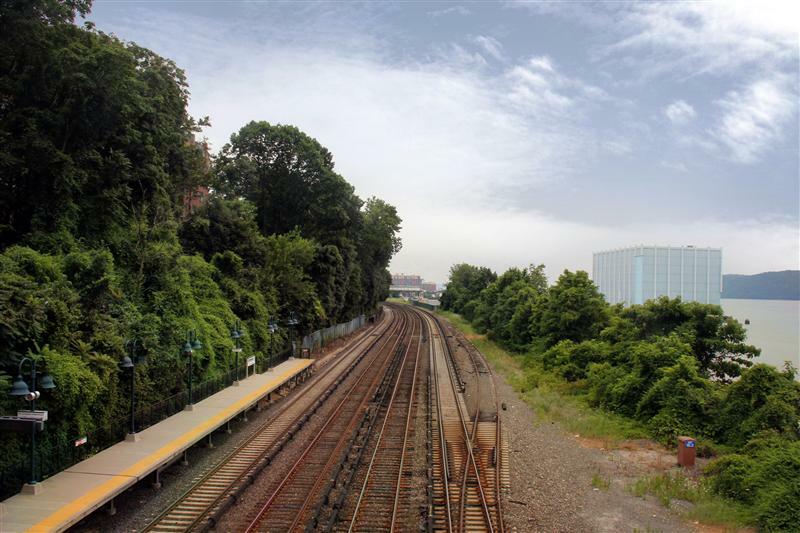 The one caveat being that all parkland being used by the project must be replaced and improved in equal or greater acreage in alternate spots. 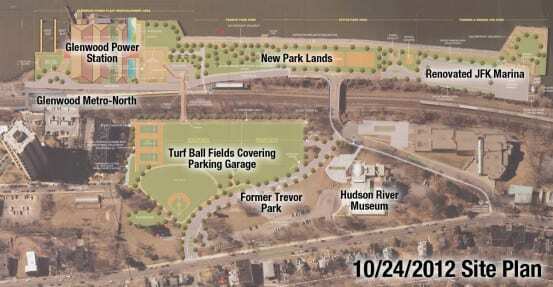 This alternate parkland would be closer to the waterfront, and the development plans calls for sand volleyball courts, a bocce court, and a picnic and grilling area. This area would be in addition to the previously mentioned park above the parking garage, which is planned to have three ball fields and a playground. 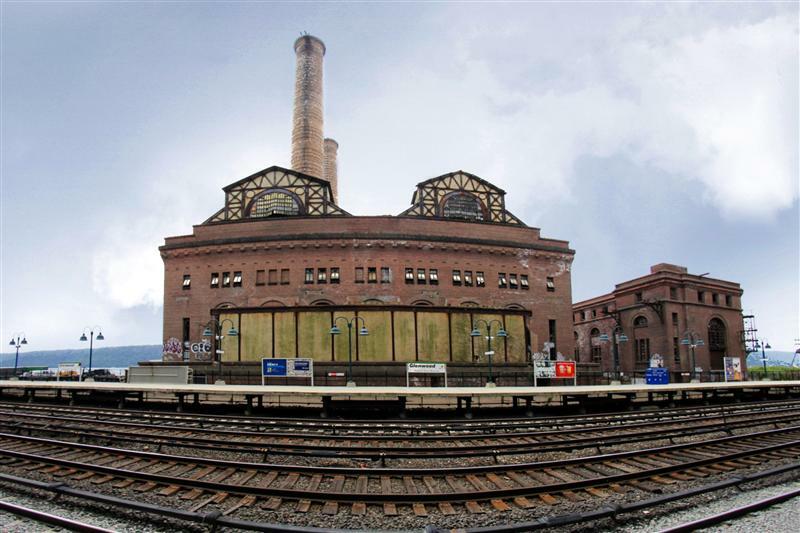 Video highlighting the restoration and repurposing of the Glenwood Power Station. 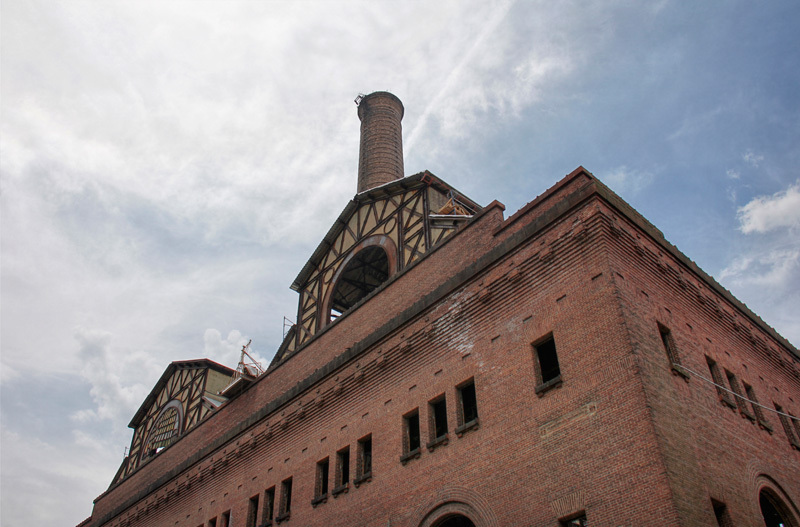 I, for one, am very eager to see this beautiful old structure again restored to greatness. 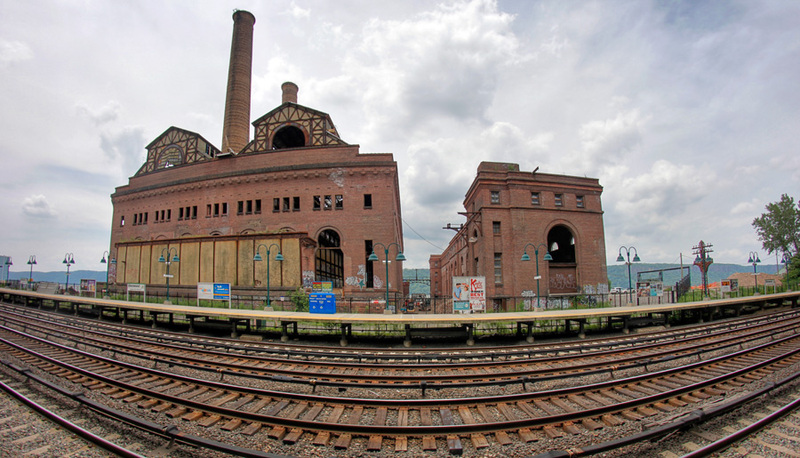 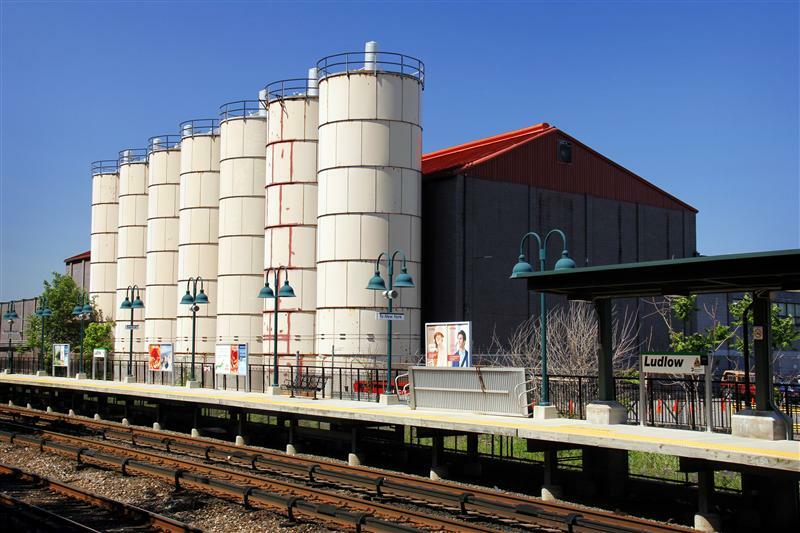 Though frequently overlooked, the old power plant played an integral role not only in local rail history, but also in the growth of New York City and its suburbs in Westchester and beyond. 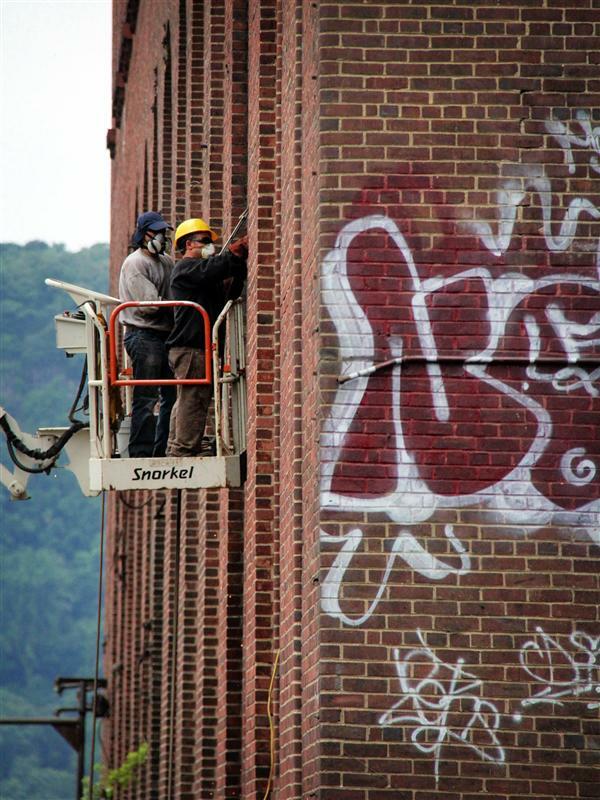 It will certainly be interesting watch how this project progresses! 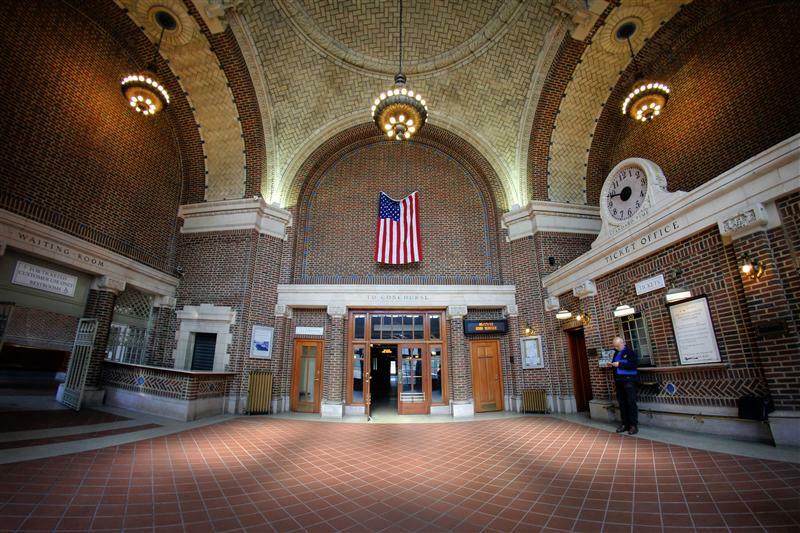 Although Grand Central Terminal may be the obvious gem of the Metro-North system, interspersed along all three of the main lines are many other beautiful stations. 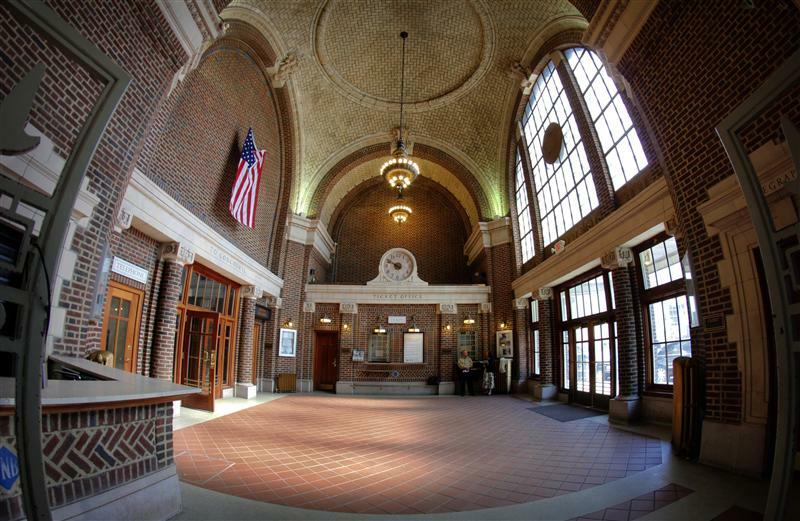 On the New Haven Line, I can’t help but think of New Haven Union Station, and of course Mamaroneck. 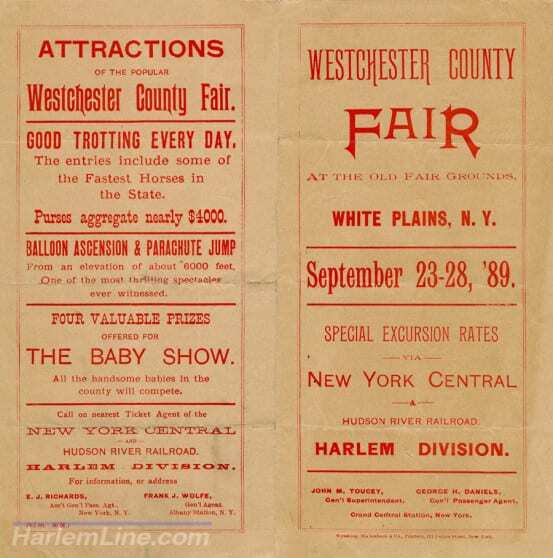 On the Harlem, I’ve always loved both Brewster and Chappaqua. 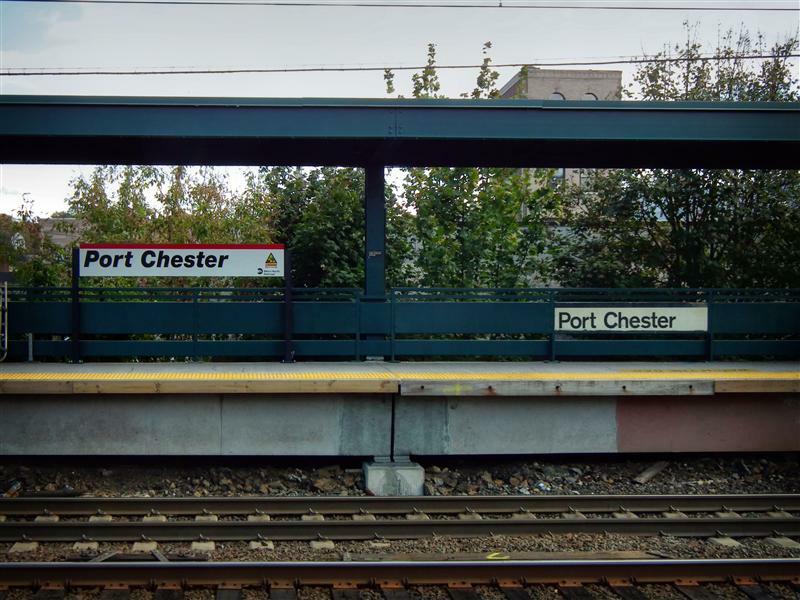 By now I’ve explored much of the Hudson Line, and it seems that the standout stations there are definitely Poughkeepsie and Yonkers. 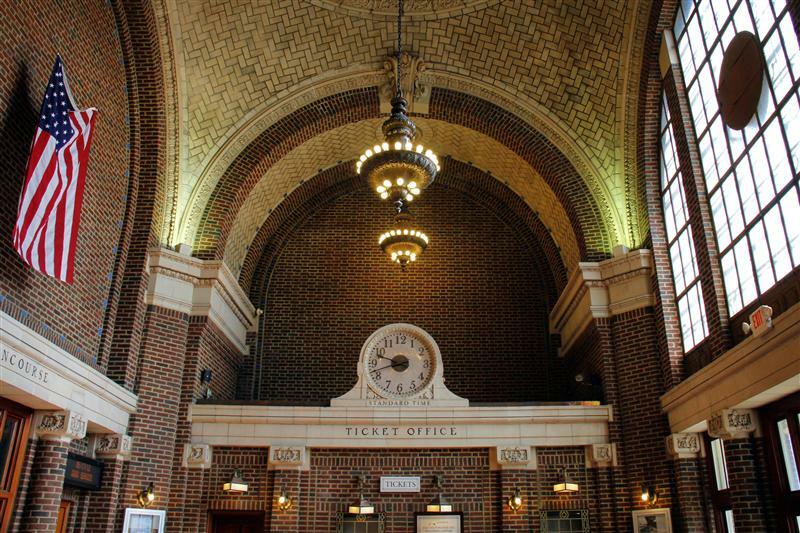 Both are well-restored examples of brick stations built by the New York Central in the early 1900’s. 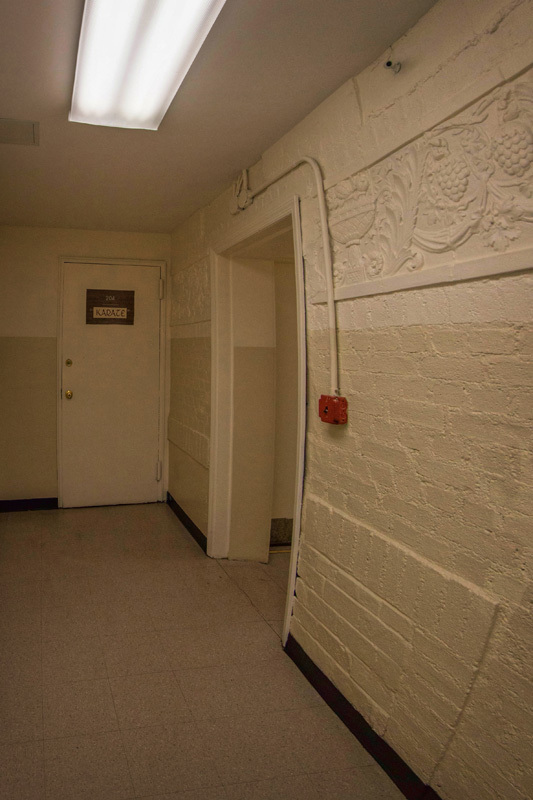 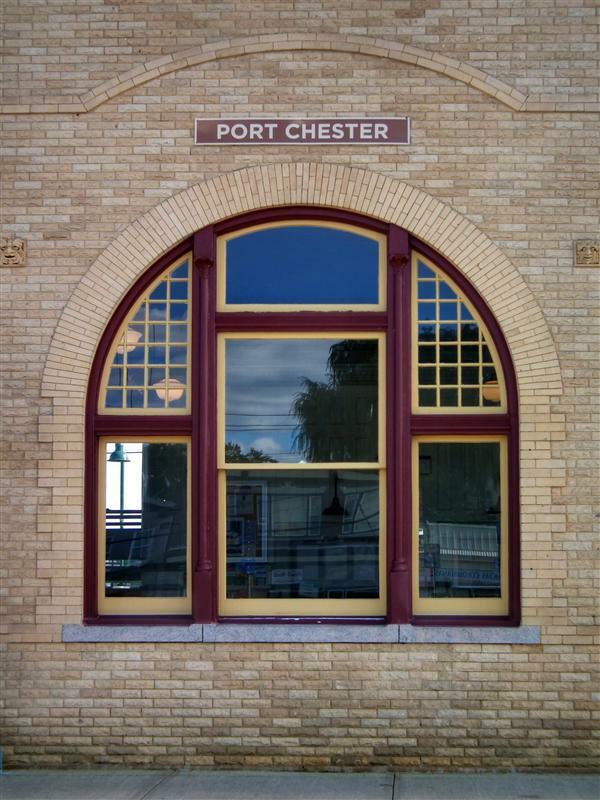 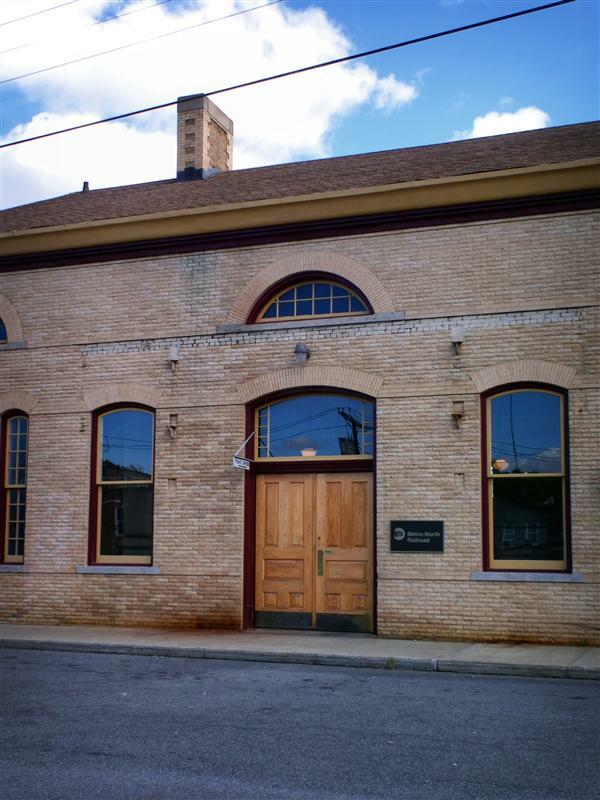 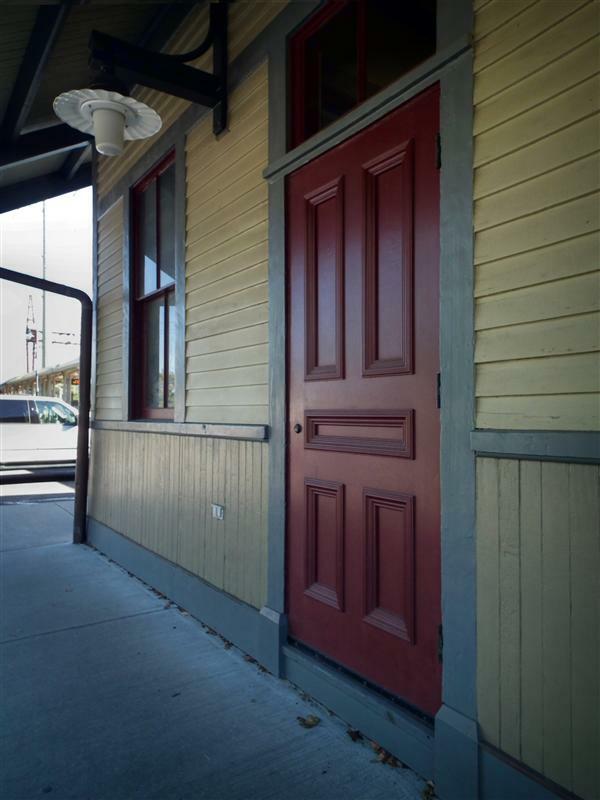 Though smaller than Poughkeepsie, Yonkers makes up for that with beautiful detailing on the outside, and a gorgeous entranceway and waiting room on the inside. 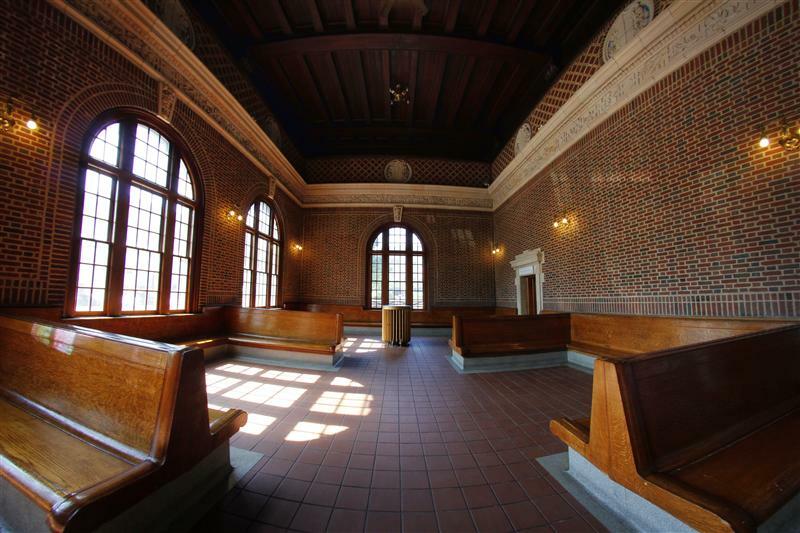 On today’s tour we may have discovered the most beautiful station on the Hudson Line. 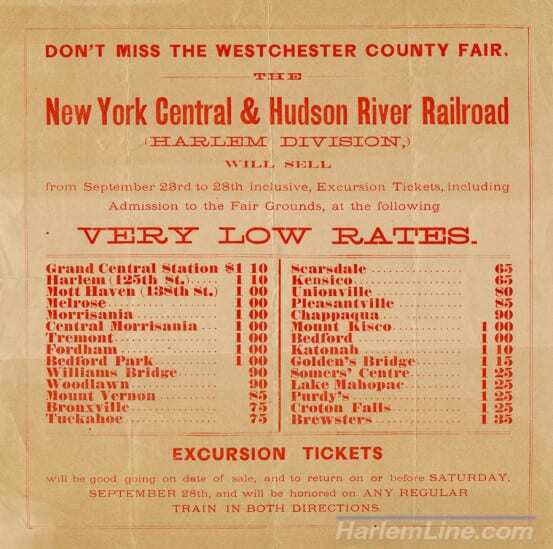 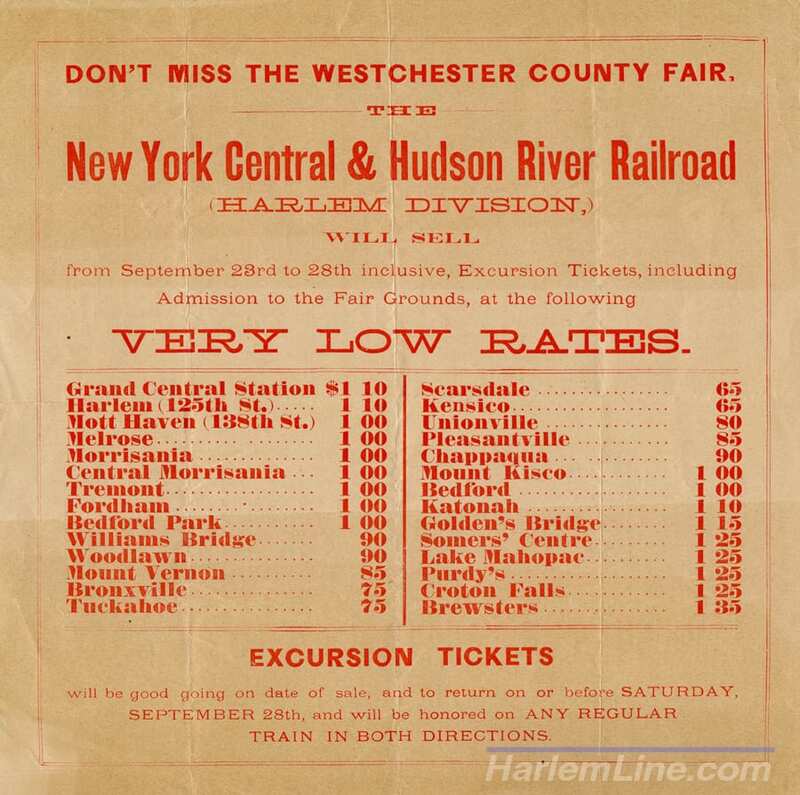 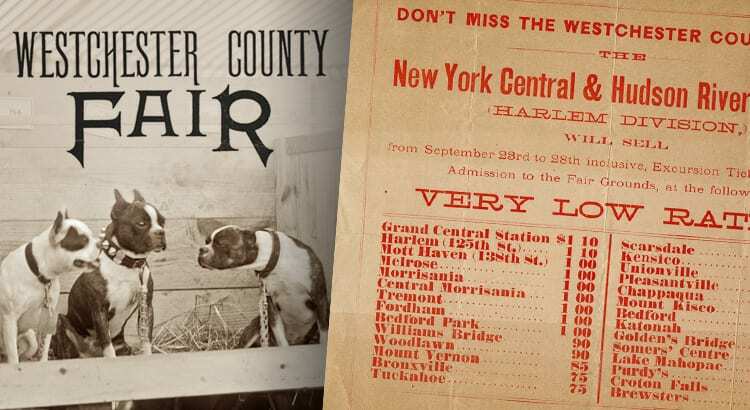 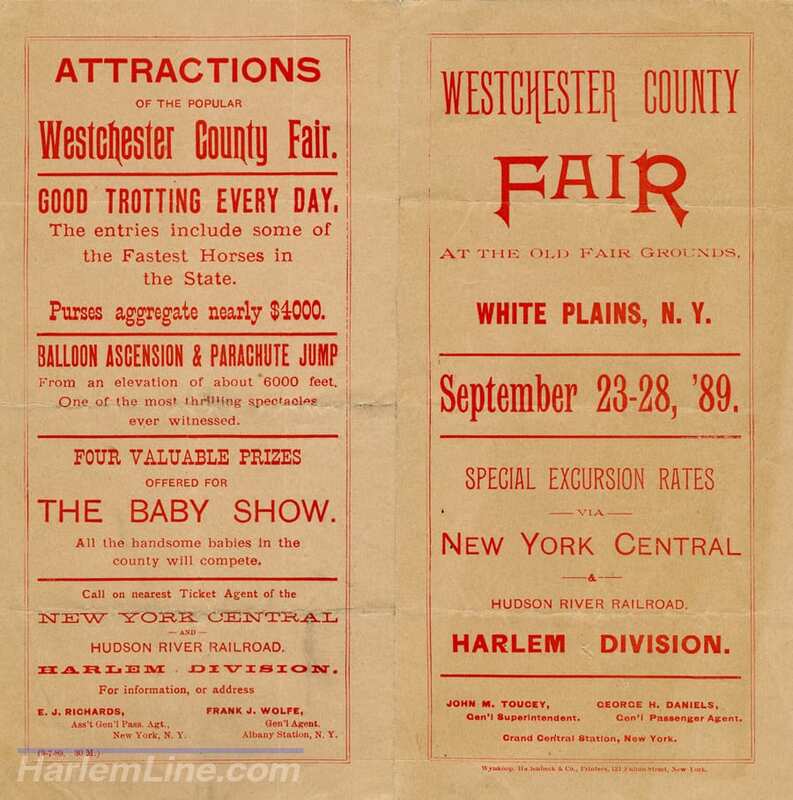 Postcard and ticket from Yonkers. 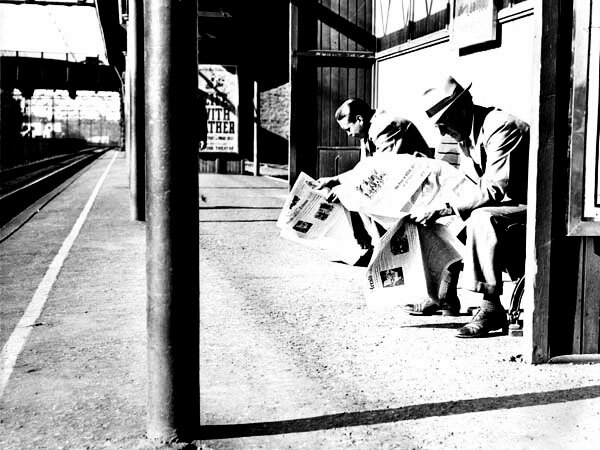 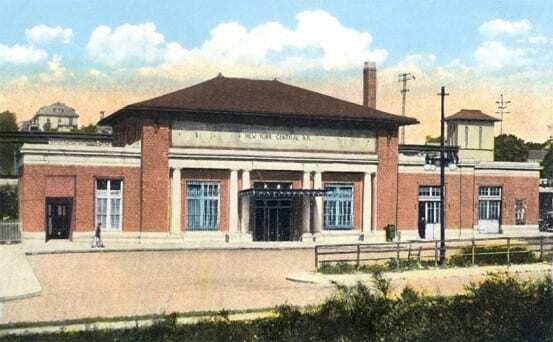 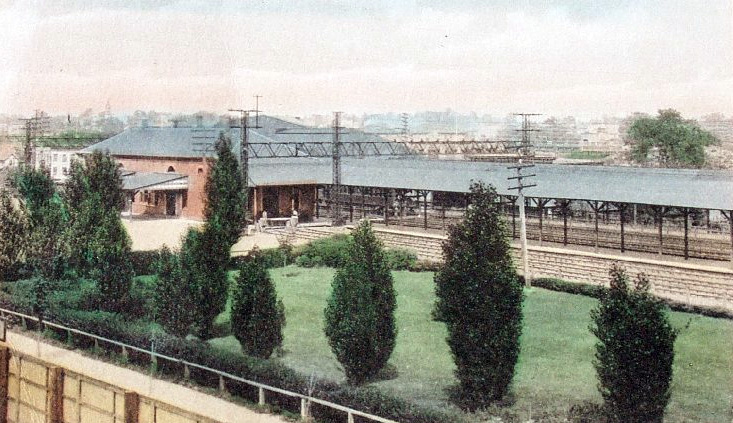 The card lists various facts about Yonkers – like Yonkers having nineteen railroad stations. 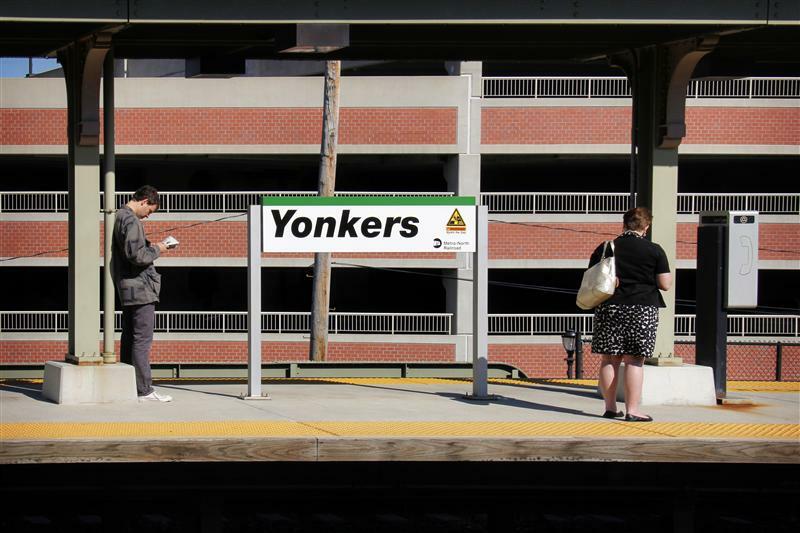 The city of Yonkers is the fourth most populous in New York state, and the most populous city in Westchester county. 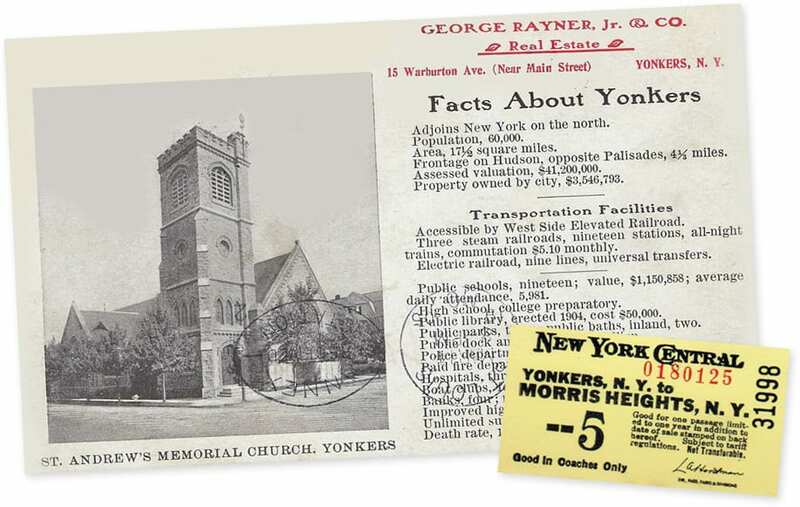 Reflecting that population, Yonkers was historically well-connected to the city and beyond via multiple methods of transportation. Right near the station were steamboats and ferries, various streetcars, and the Getty Square branch of Putnam Division was not far away. 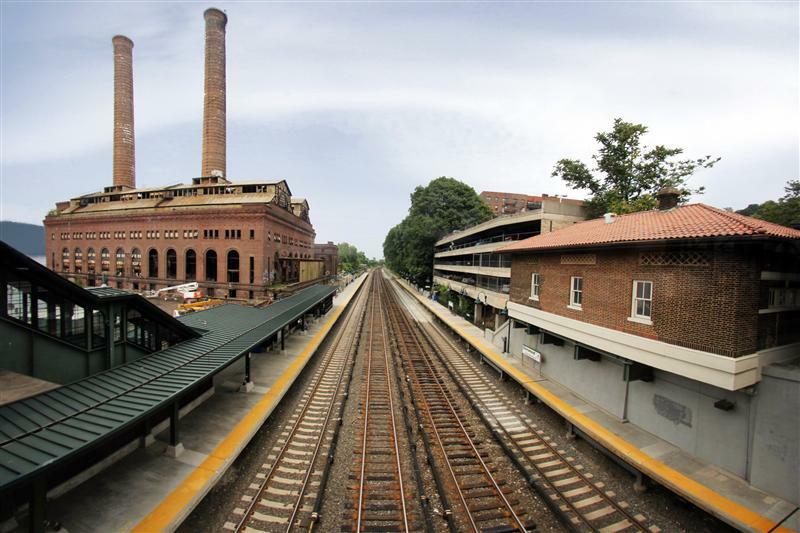 At one time, Yonkers had nineteen railroad stations. 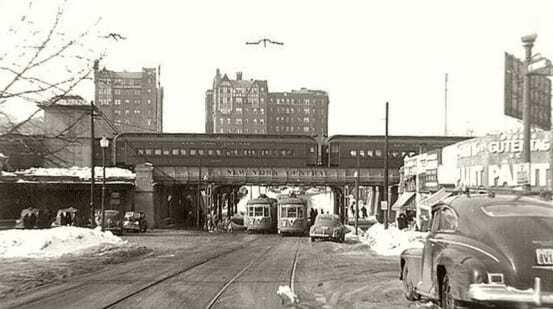 Today there are far fewer than nineteen stations, the streetcars are long gone, and the Putnam Division is just a memory. 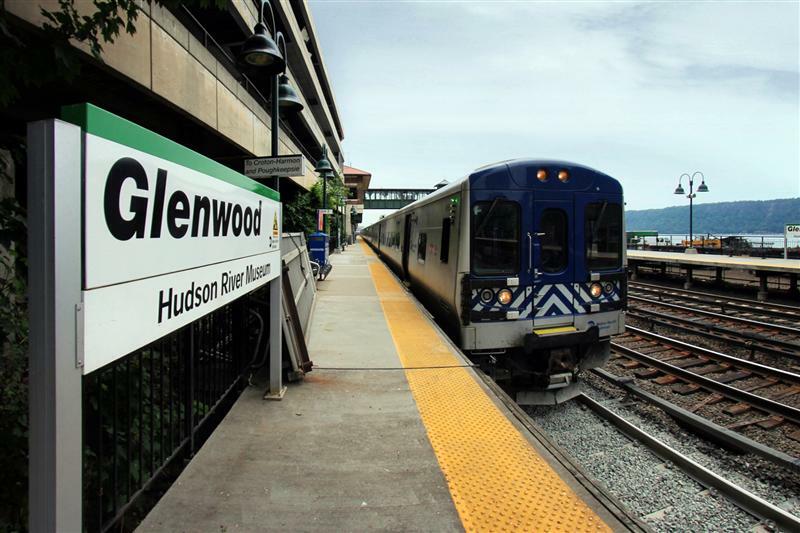 However, Yonkers still has quite a few connections to the city via Metro-North – Ludlow, Glenwood, and Greystone are all in Yonkers. 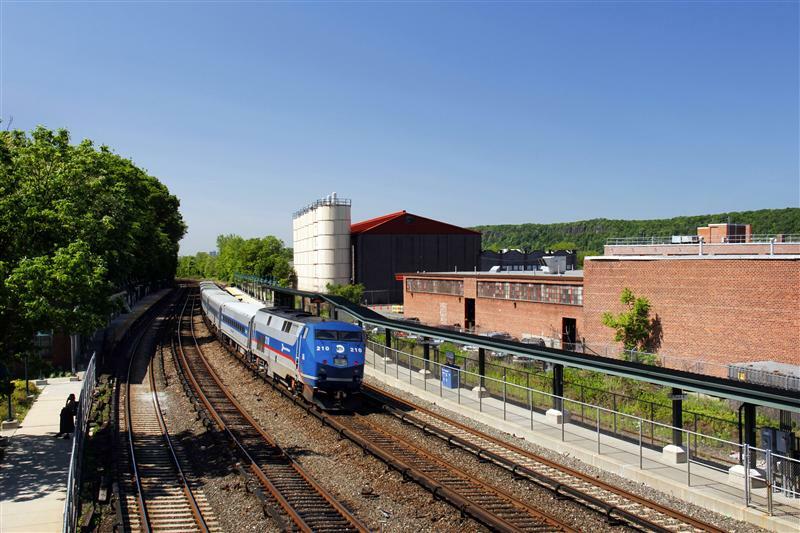 And the primary Yonkers station, which we are visiting today, is serviced by both Metro-North and Amtrak. 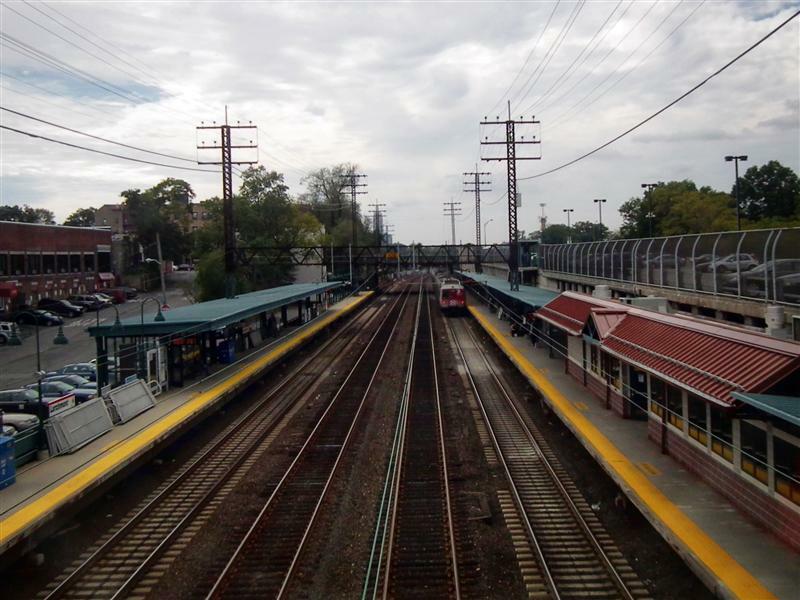 Some of the now defunct methods of transportation in Yonkers – including trolleys and a few Putnam Division stations. 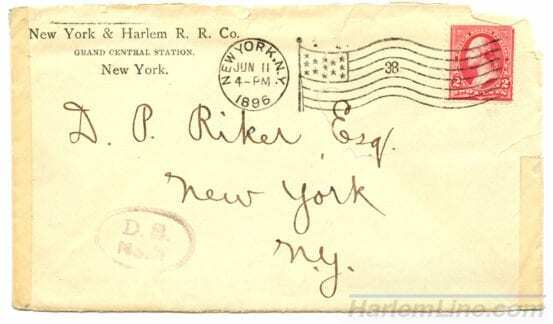 Postcards from the collection of the awesome postcard master, Steve Swirsky. 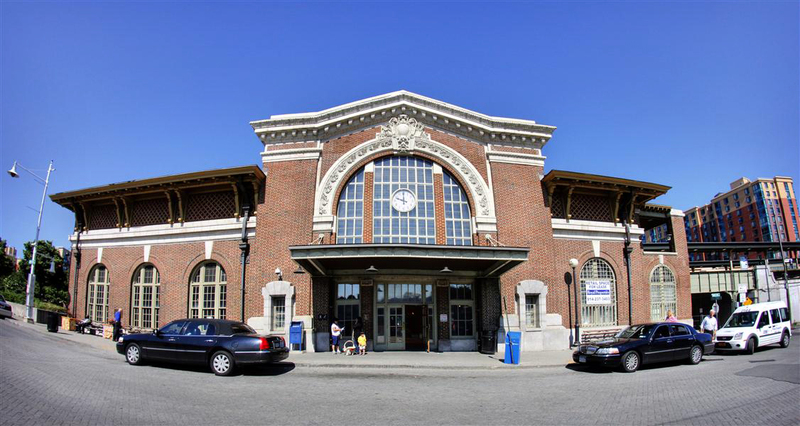 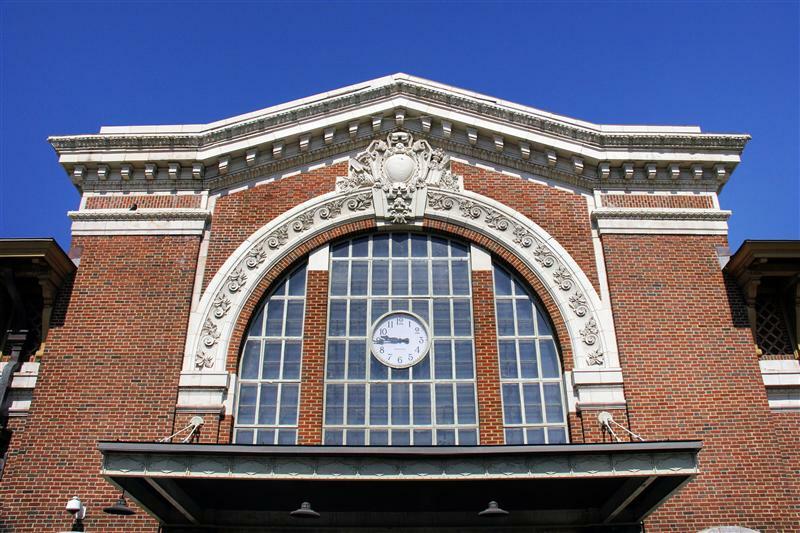 Other than being beautiful stations, Grand Central Terminal, Poughkeepsie, and Yonkers do have one thing in common – all were worked on by architects Warren and Wetmore. 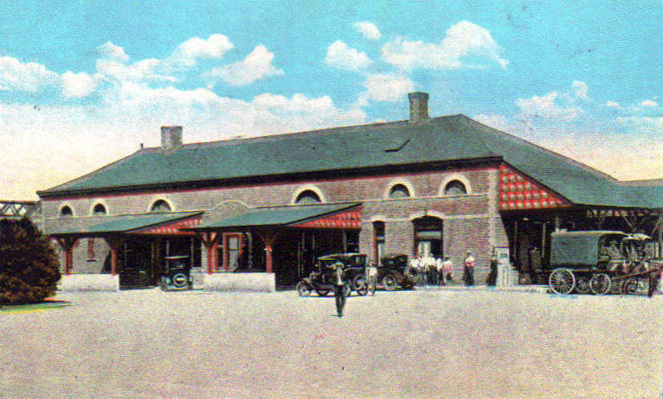 Built in their signature Beaux Arts style, the station was completed in 1911. 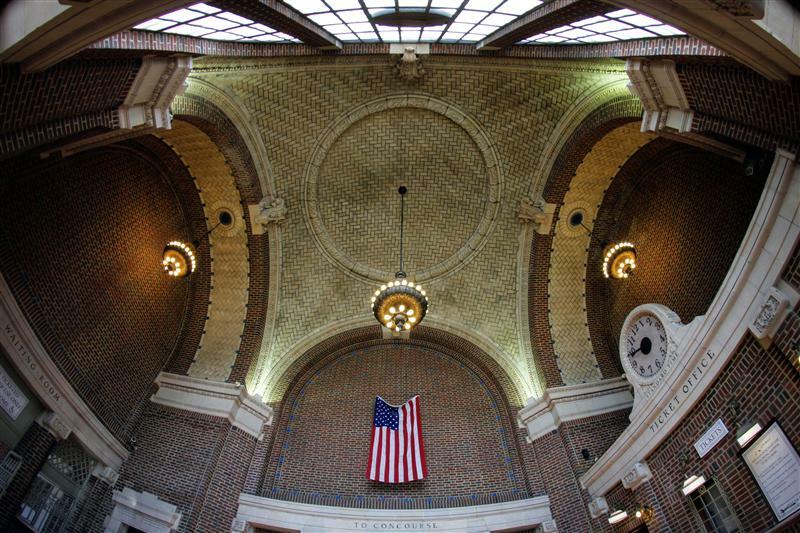 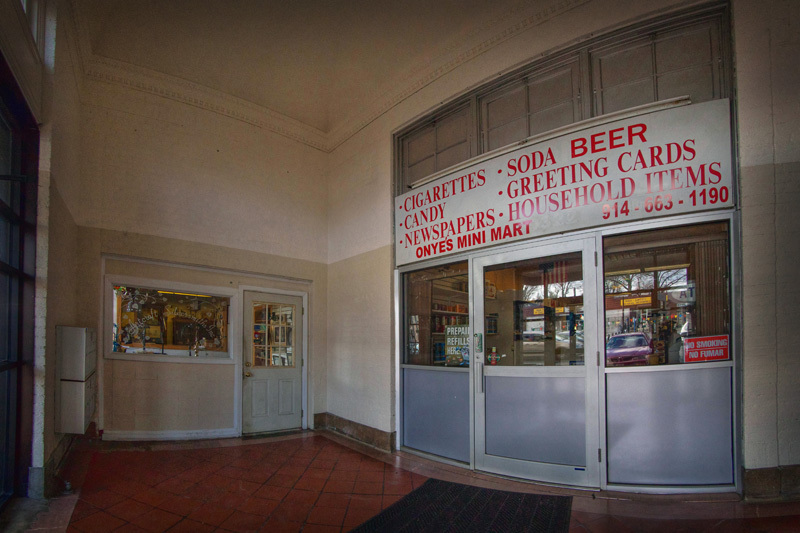 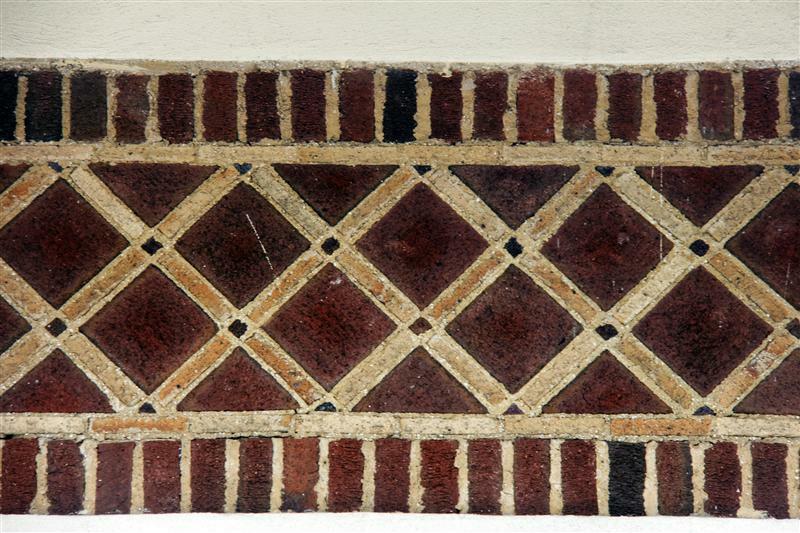 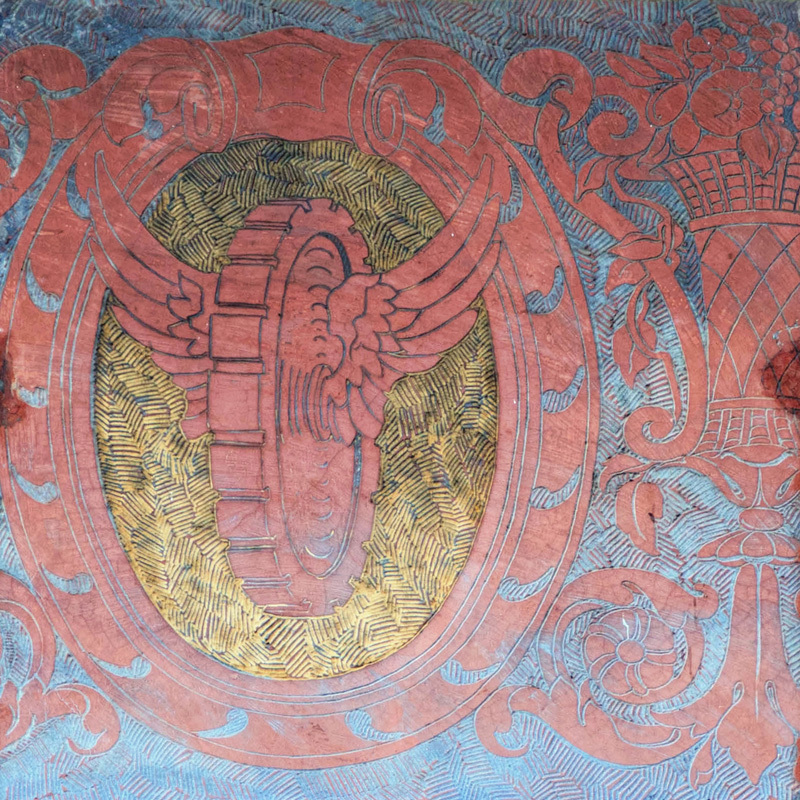 The Gustavino tiling on the ceiling of Yonkers significantly resembles the portion of Grand Central adjacent to the Oyster Bar. 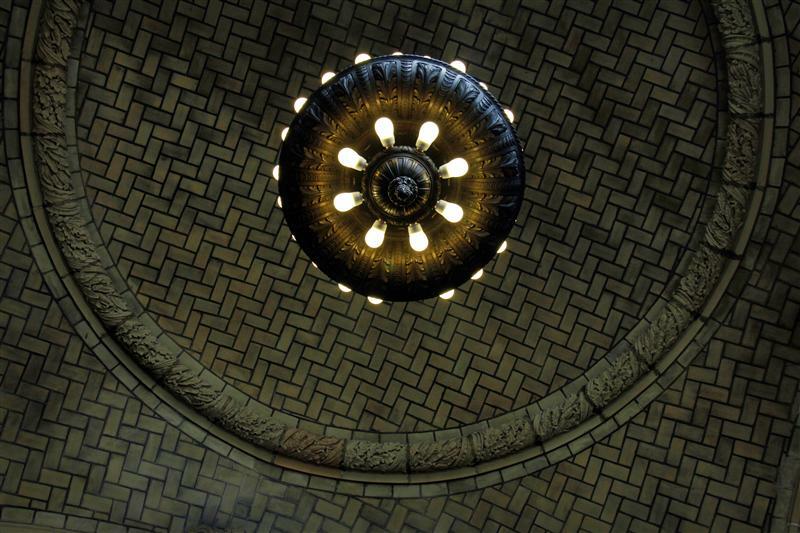 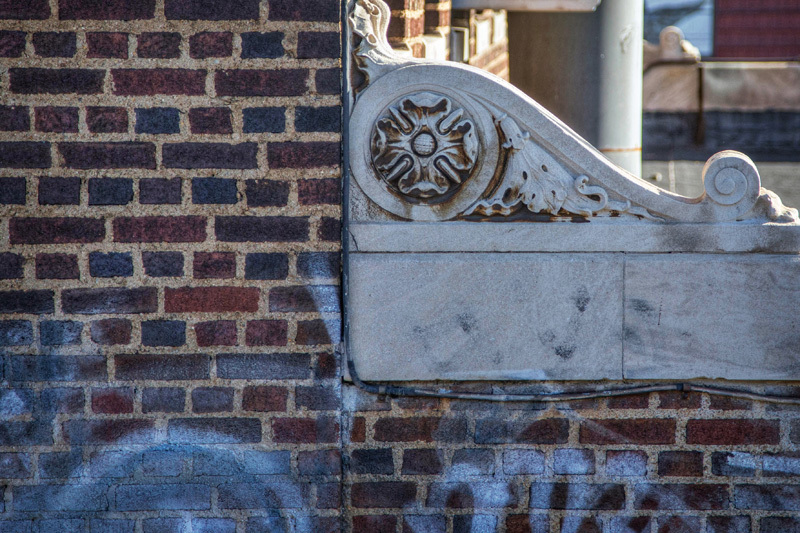 One of my favorite portions of the station is the sculpted detail work containing NYC – for the New York Central. 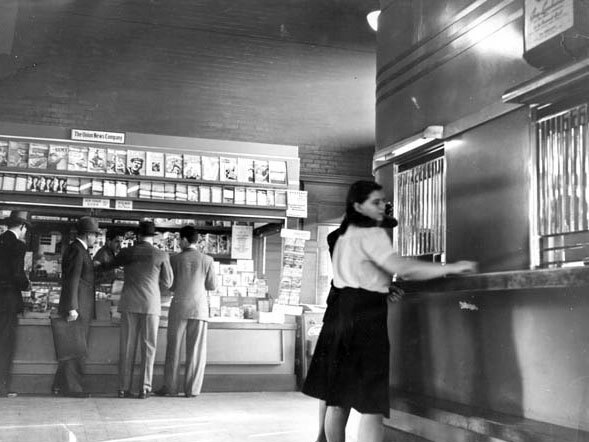 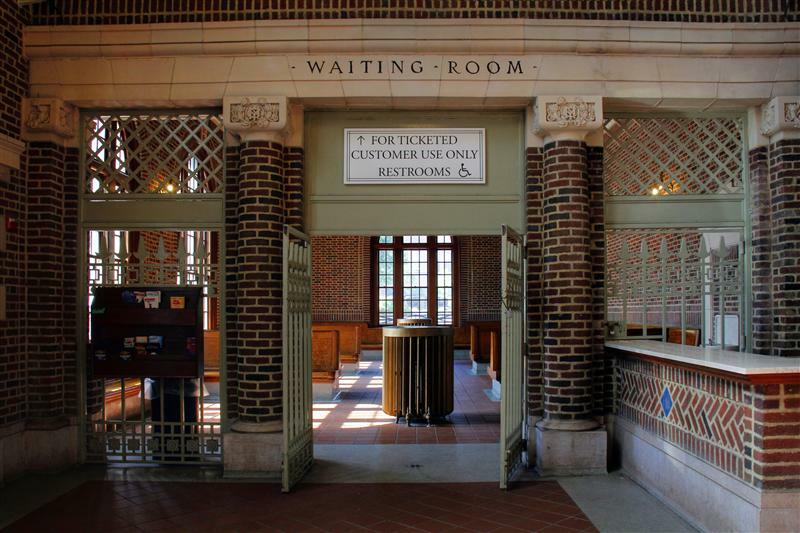 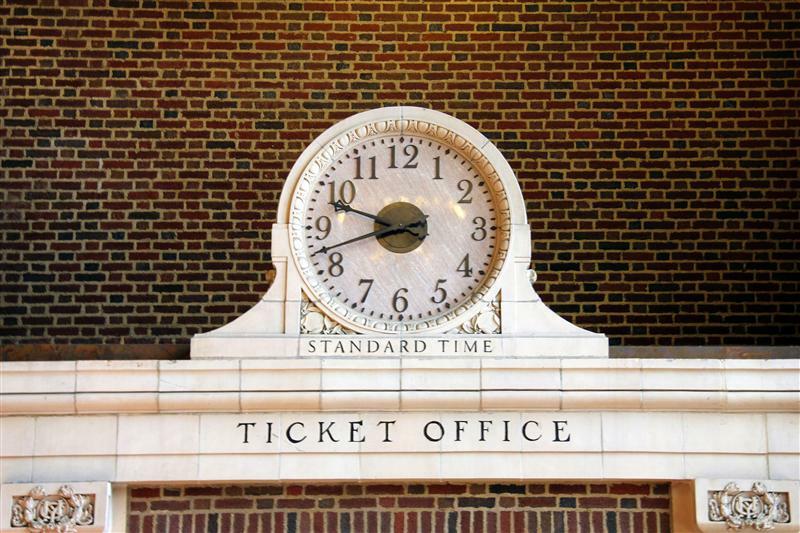 The station still has the original ticket windows, which are quite attractive, but they are no longer in use. 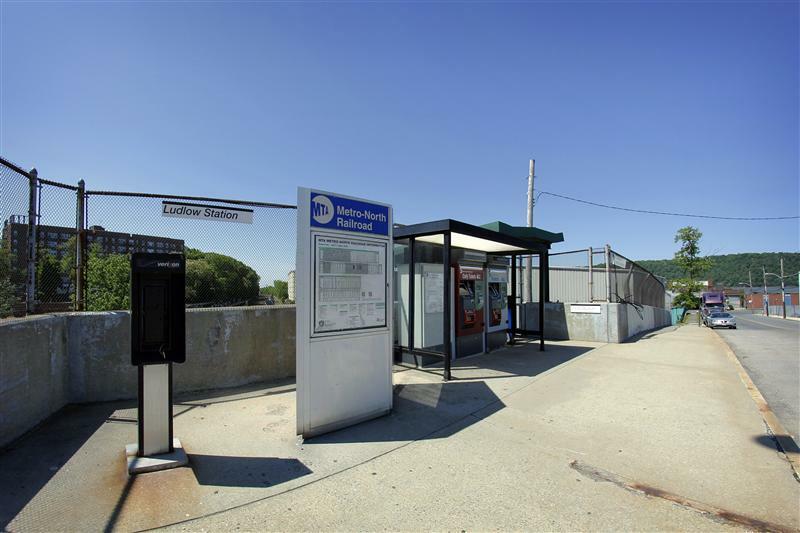 All ticketing at Yonkers is through Ticket Vending Machines. 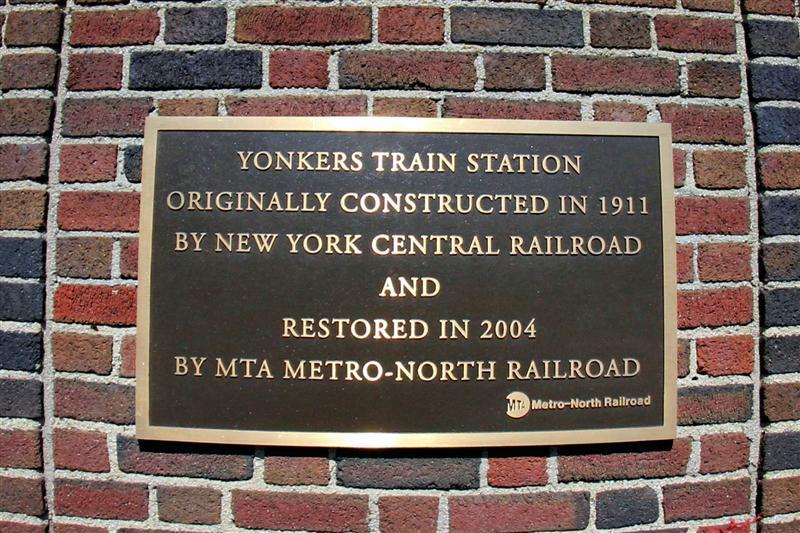 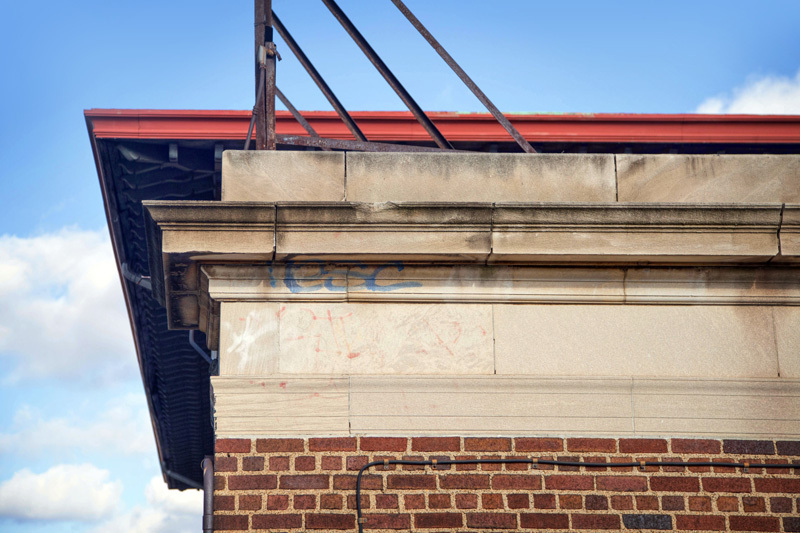 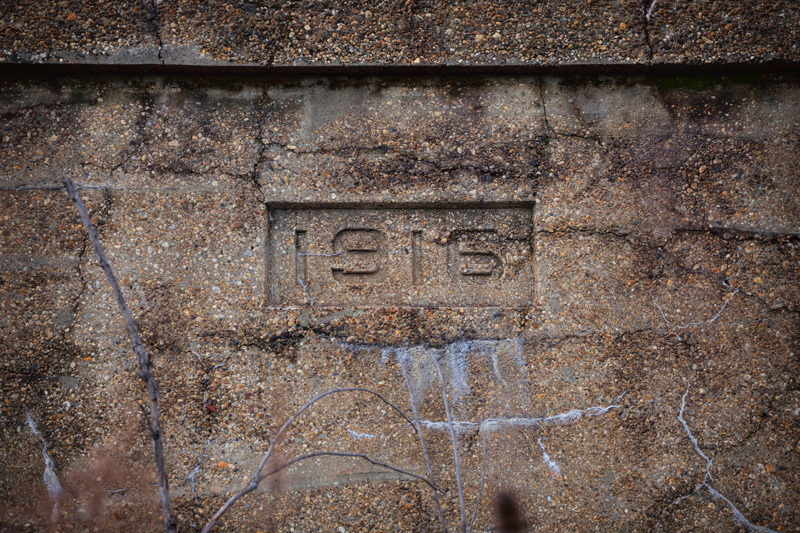 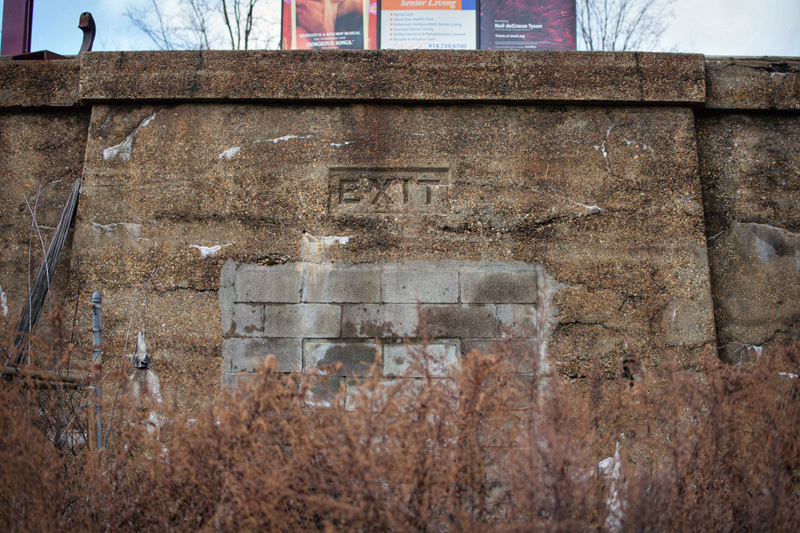 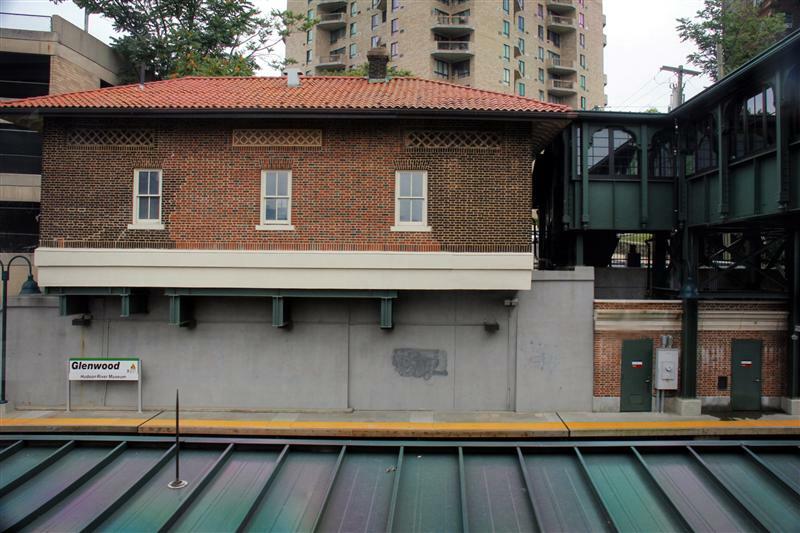 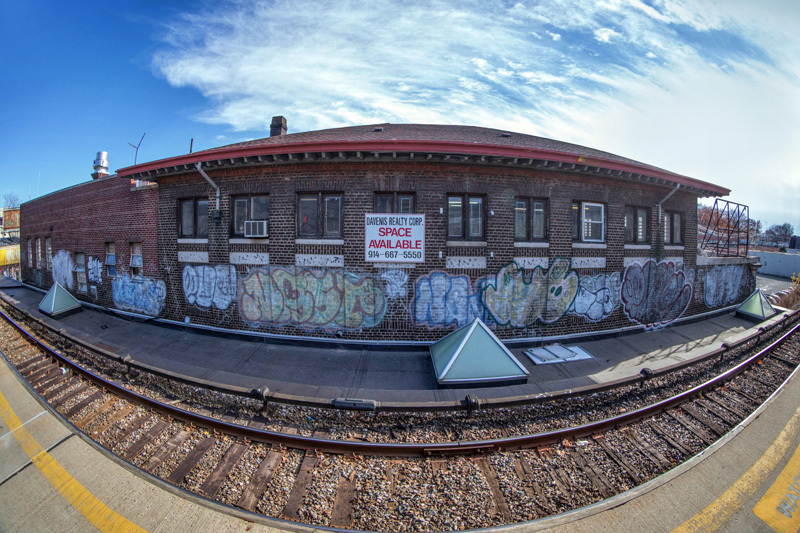 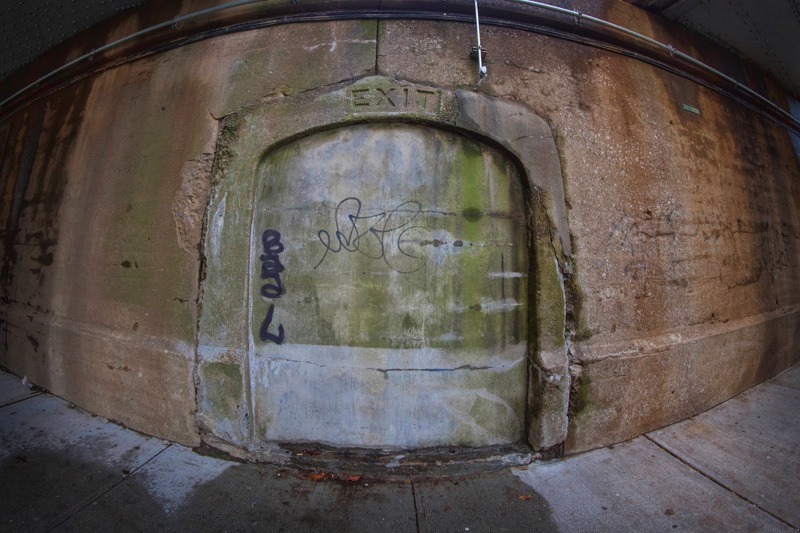 Expectedly, Yonkers station fell into disrepair over many years. 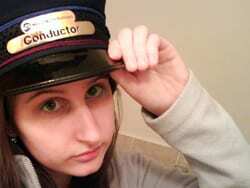 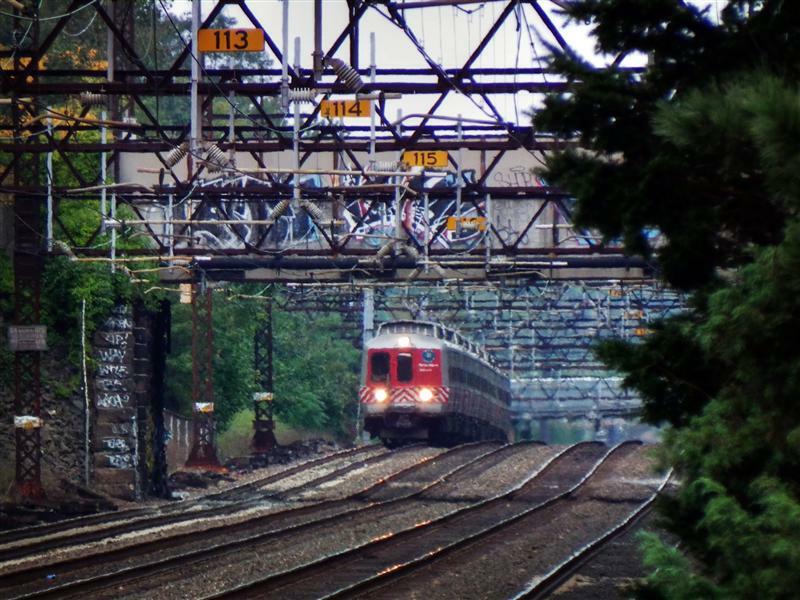 It was ultimately restored by Metro-North in 2001. 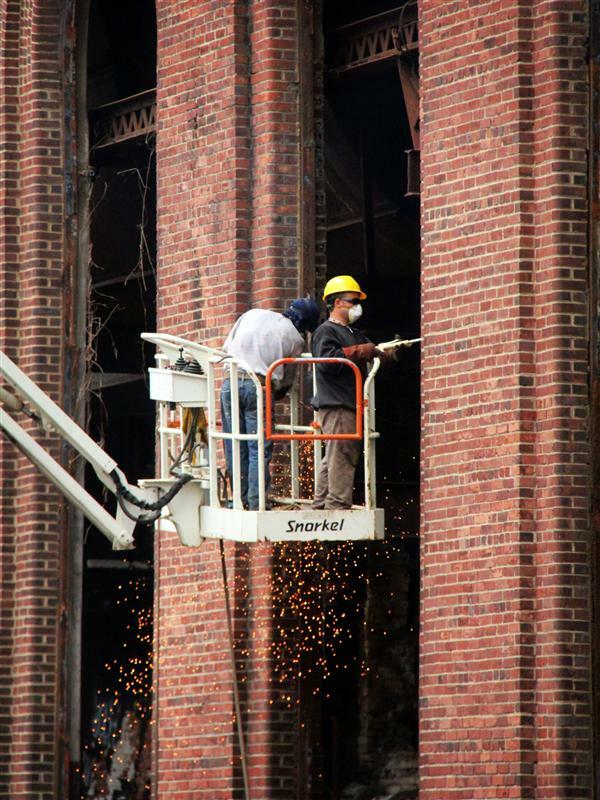 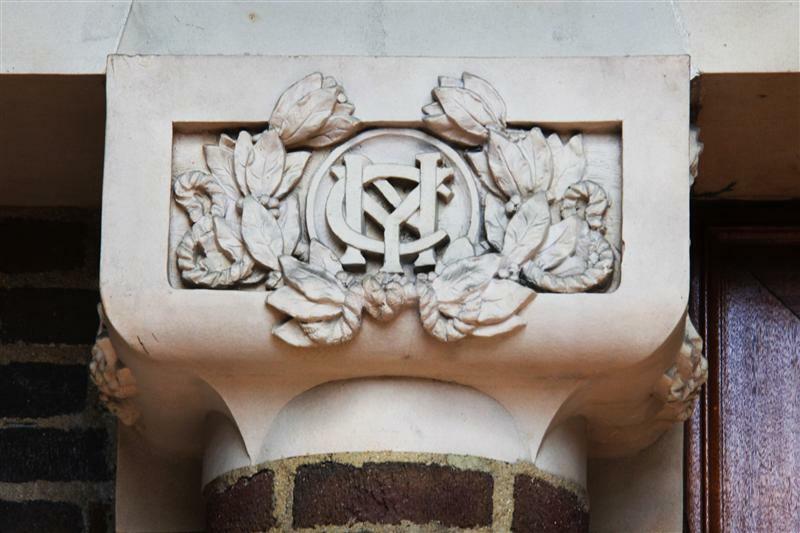 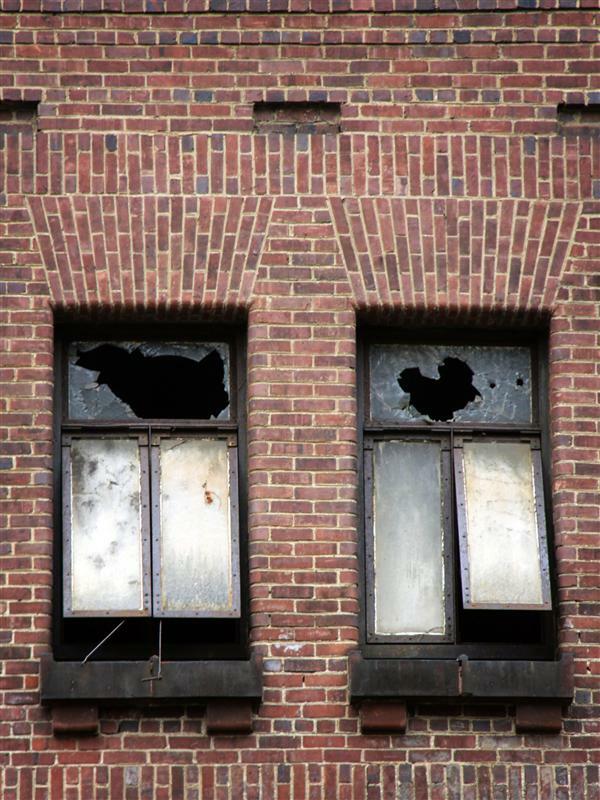 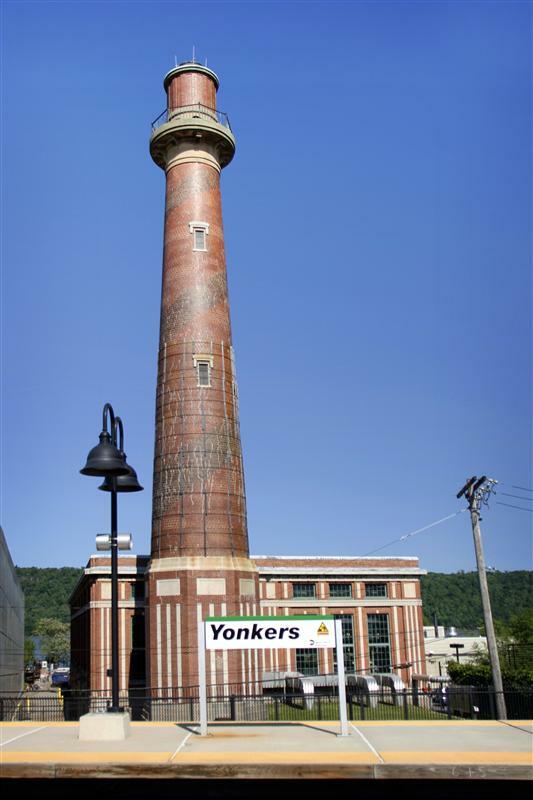 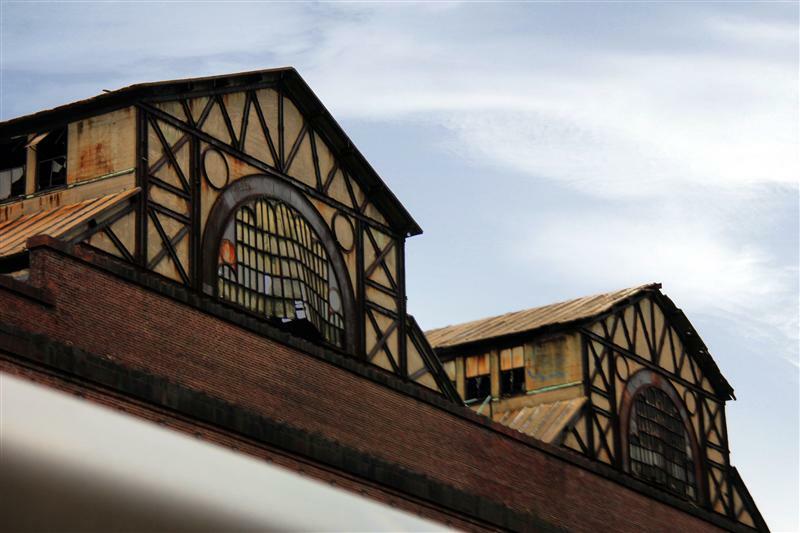 $45 million was alloted for the work at Yonkers, $4.5 million of which was for restoring the building itself. 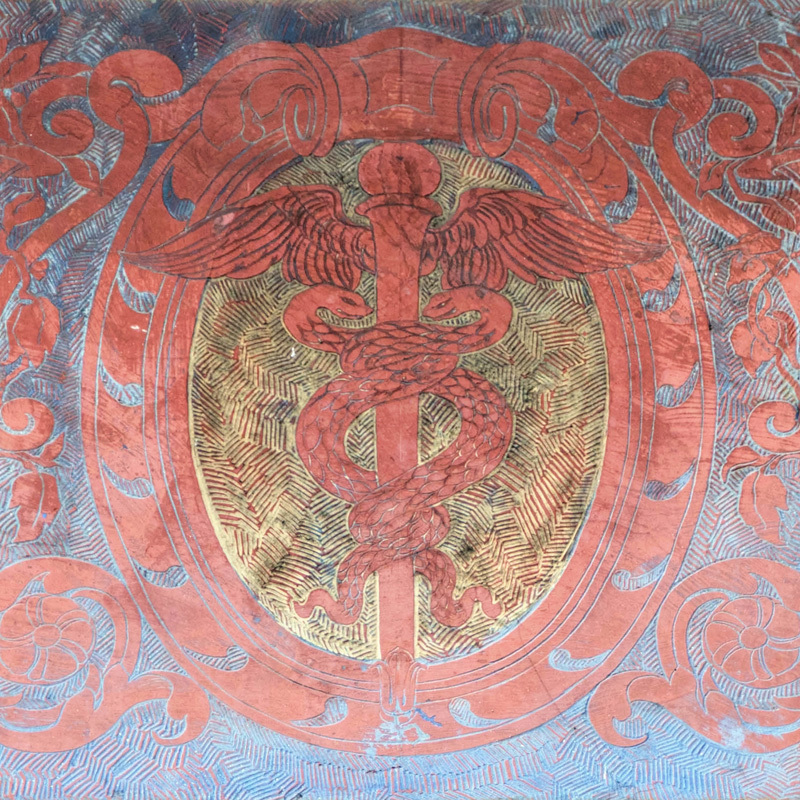 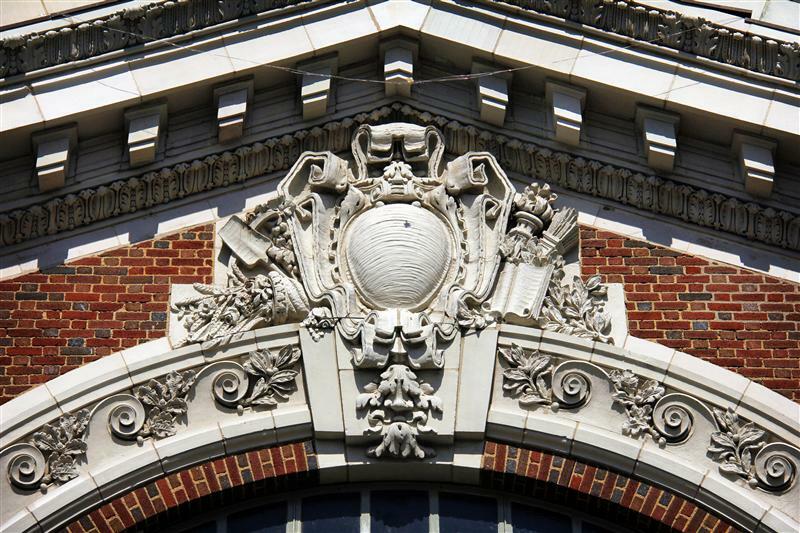 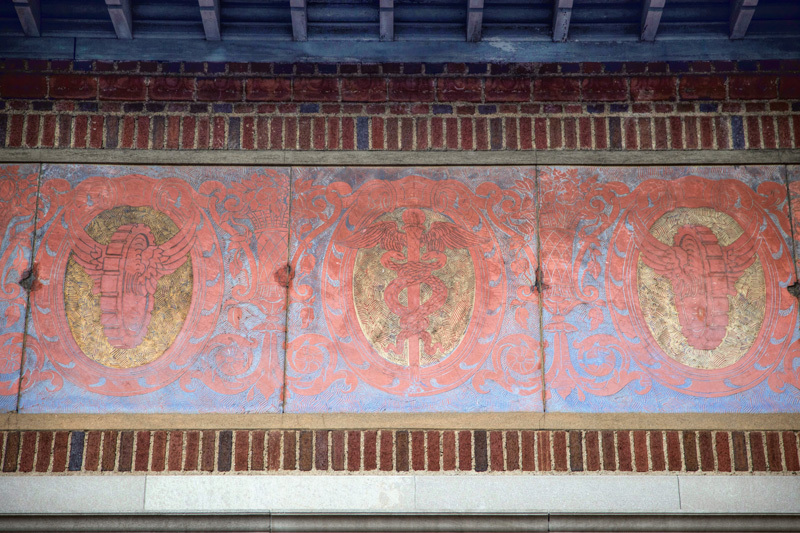 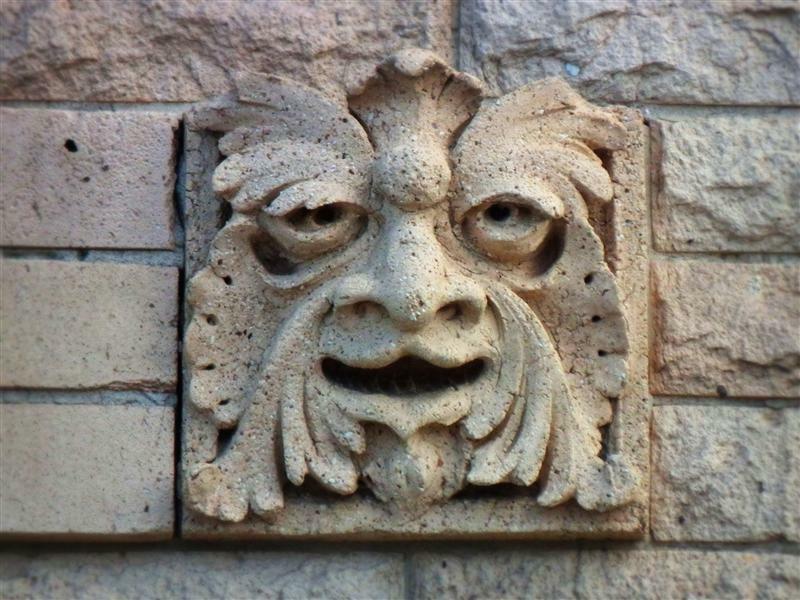 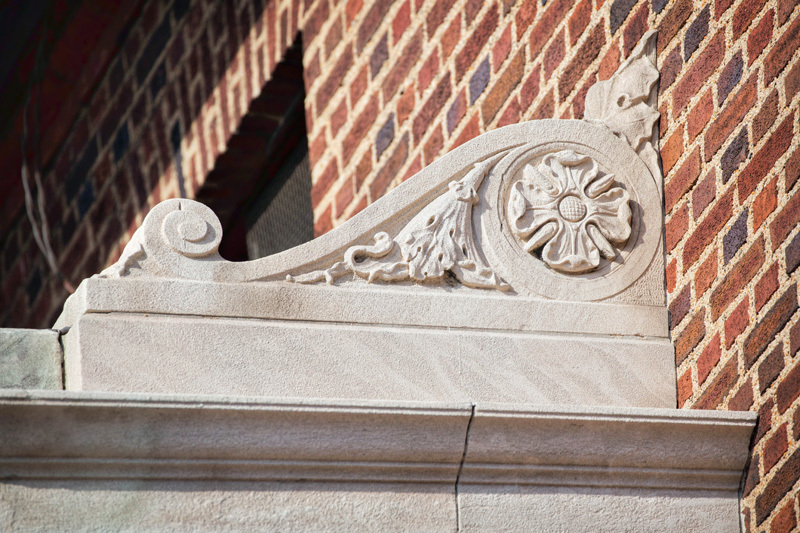 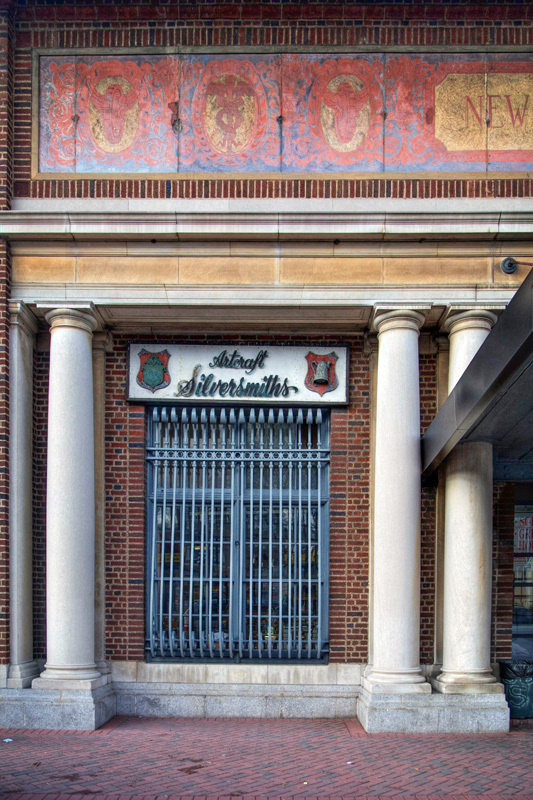 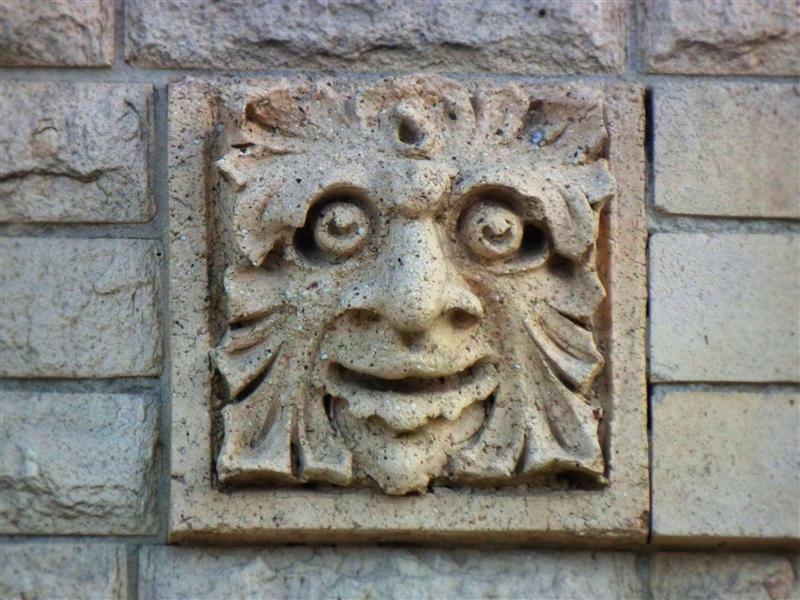 The sculpted terra cotta on the façade of the building was restored, or in some instances, replaced by a company from California. 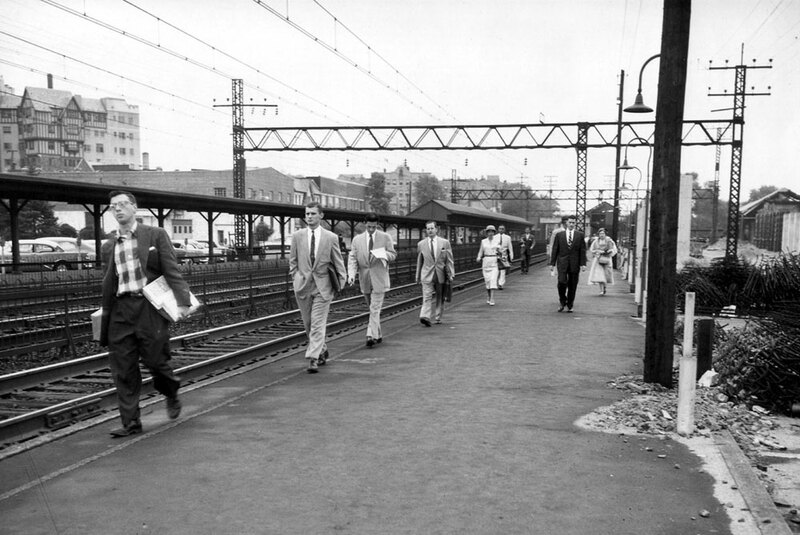 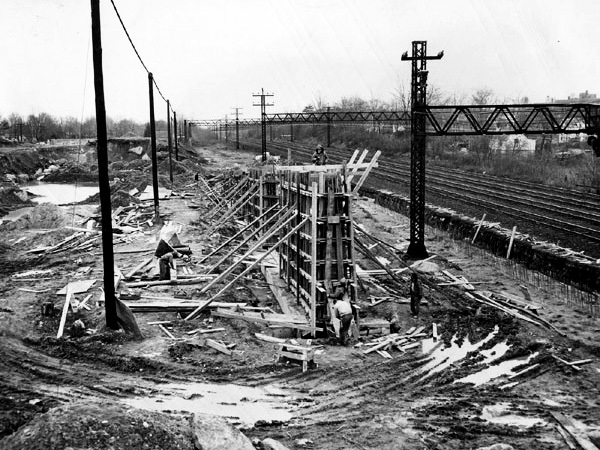 The rest of the money was used for track work, reconstruction of steel bridges, and refurbishment of the viaduct. 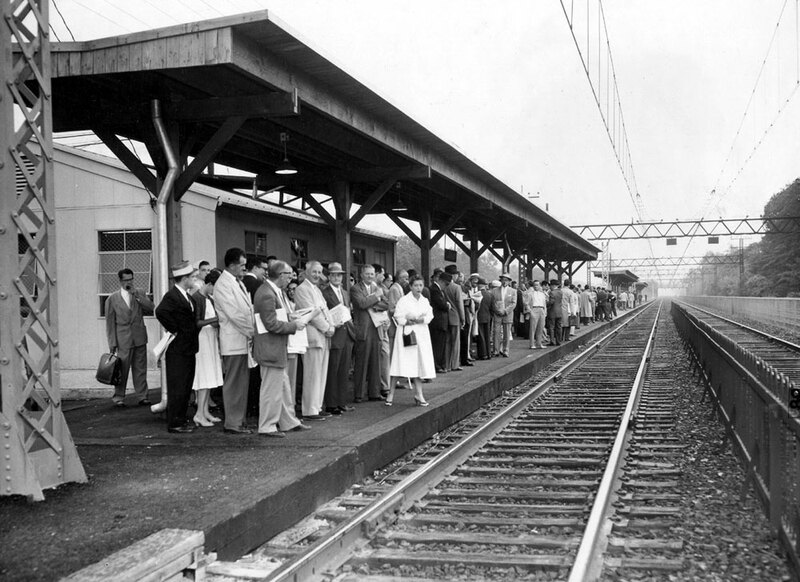 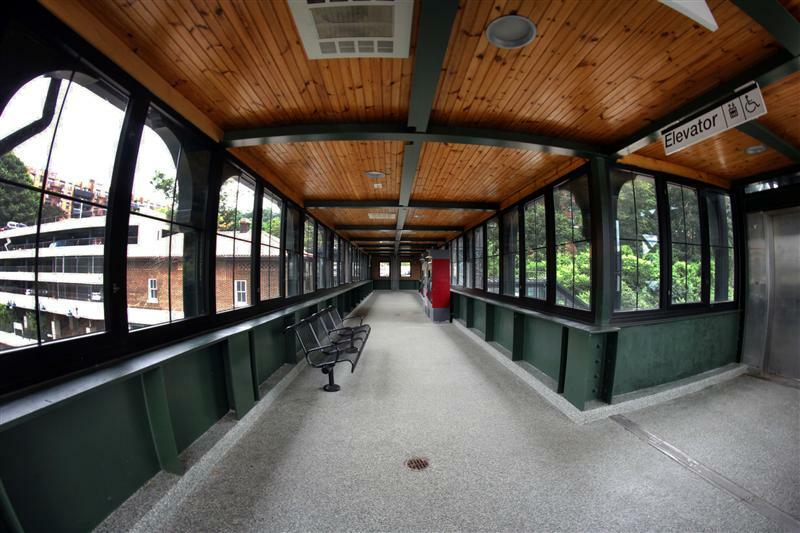 Platforms were also redone, the lighting improved, and accommodations made for the disabled. 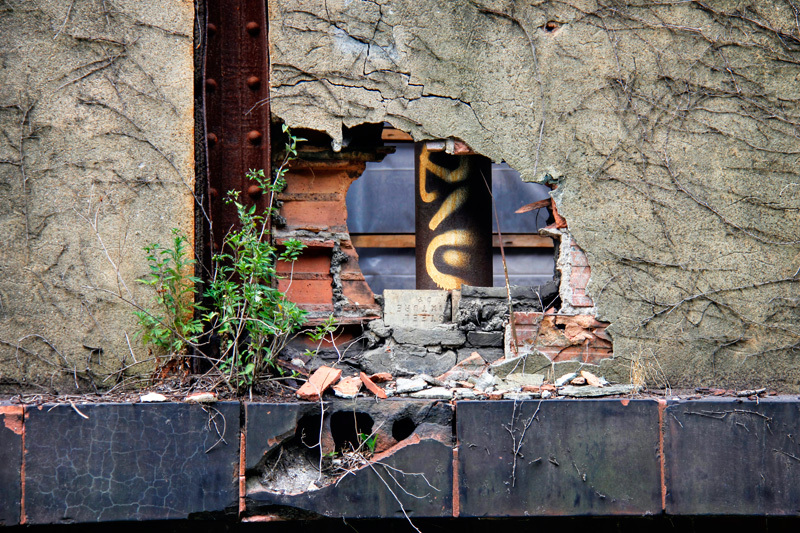 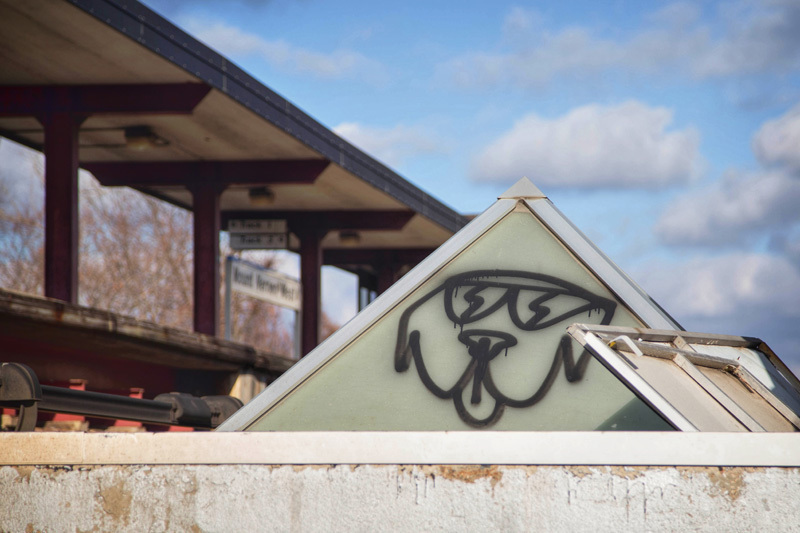 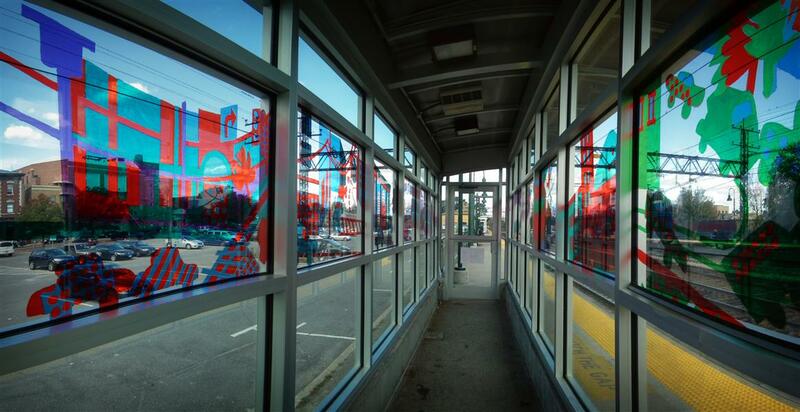 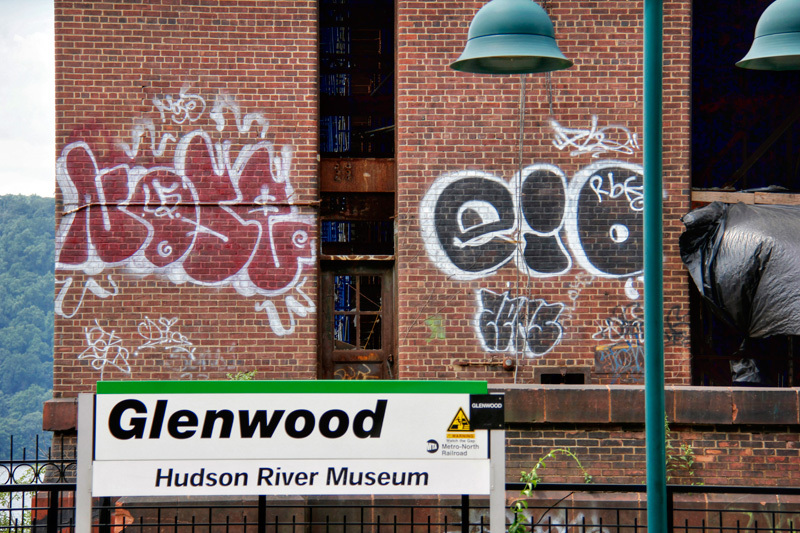 In 2006 an Arts for Transit piece was added at Yonkers, but I happened to miss it on my visit. 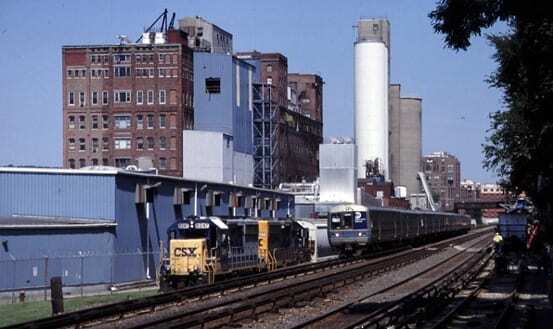 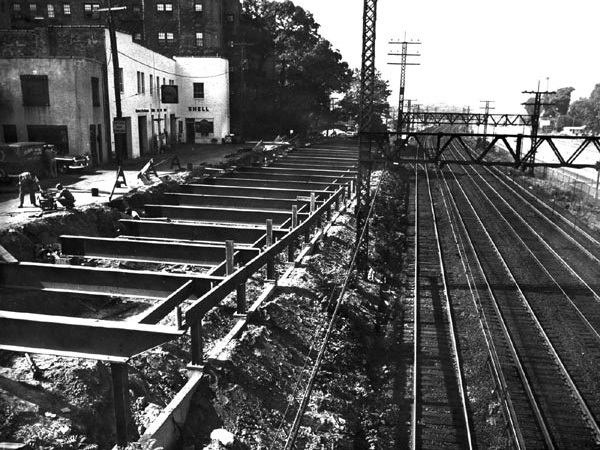 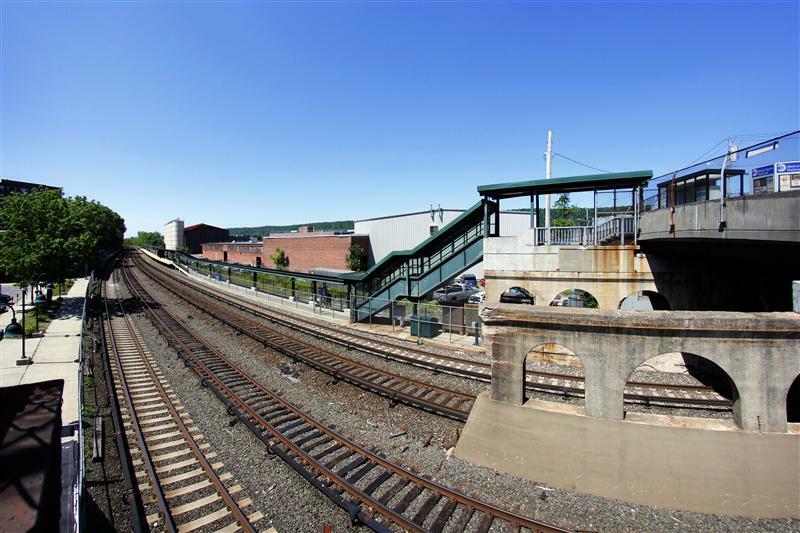 Occurring simultaneously were other initiatives to renew the waterfront area surrounding the train station in Yonkers. 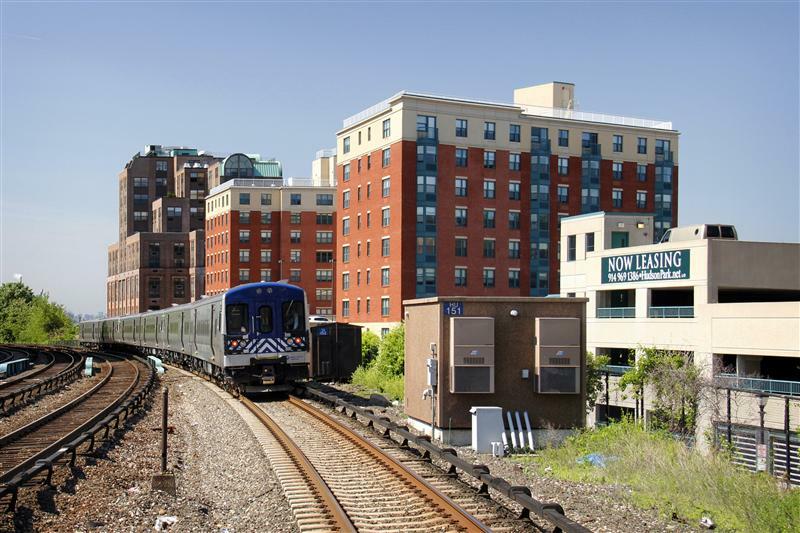 One such effort was the Hudson Park luxury apartments, which you can spot in the background of several of my photographs of the station. 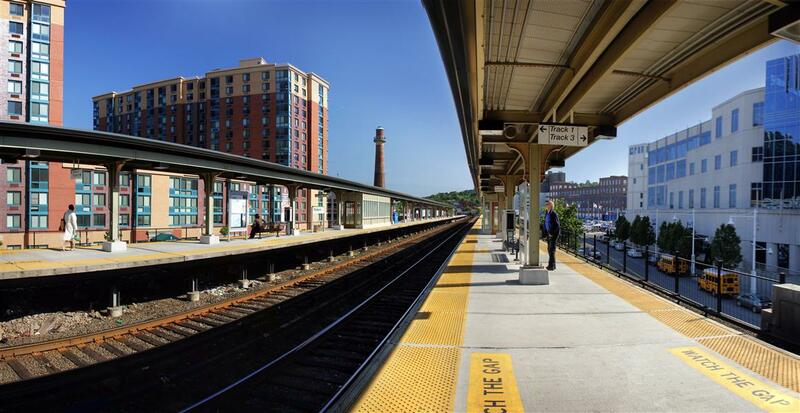 Its proximity to the train station no doubt makes it an attractive place to live, and you’ll notice many developments similar to this up and down the line. 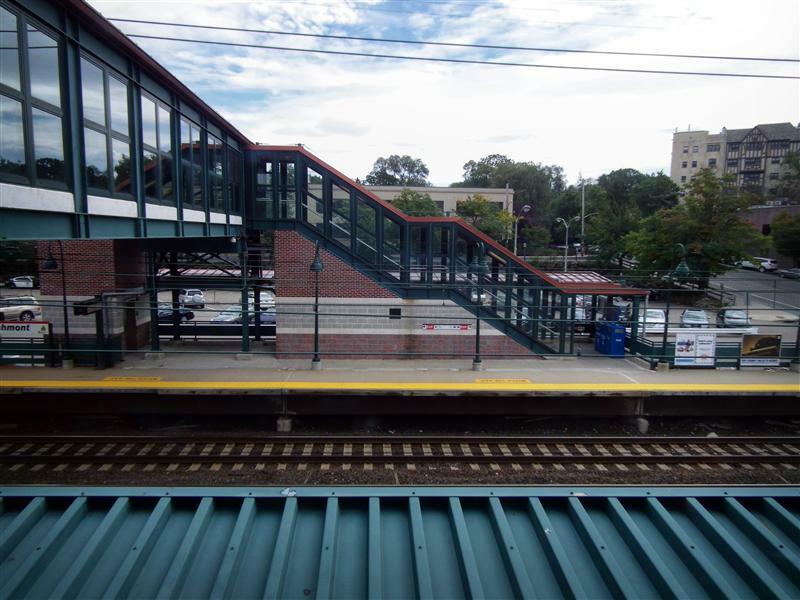 Compared to the beautiful station, the platform area of Yonkers station is relatively underwhelming. 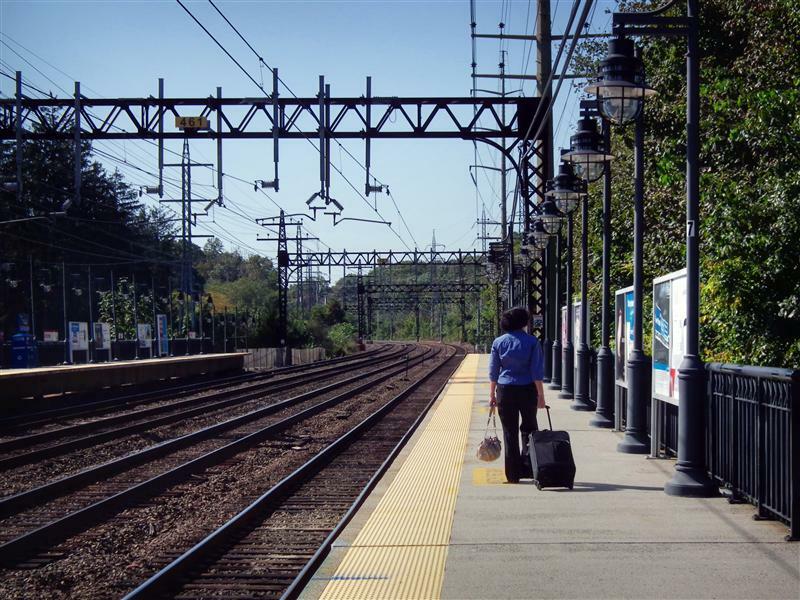 But it is, of course, from the platform that one accesses the frequent trains heading south to the city, or north to Poughkeepsie and beyond. 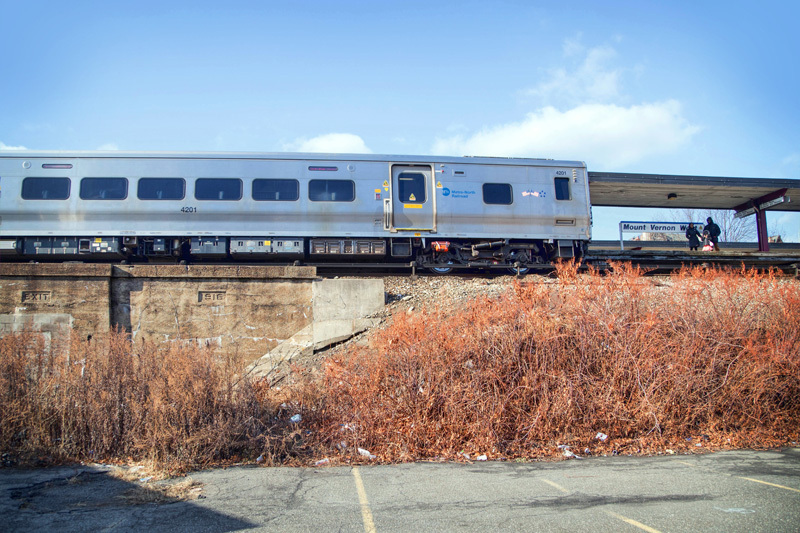 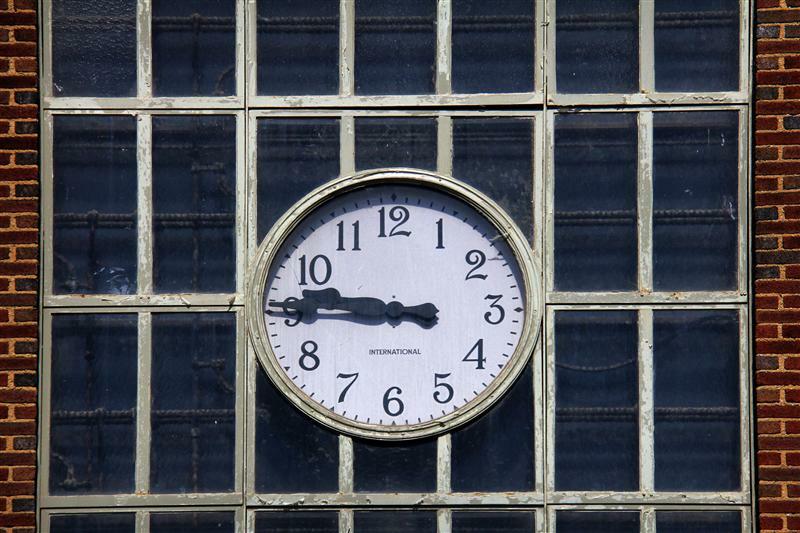 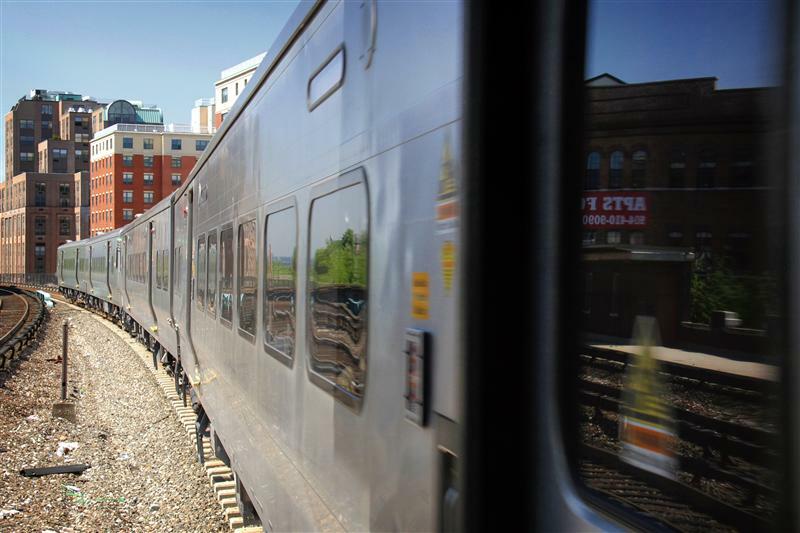 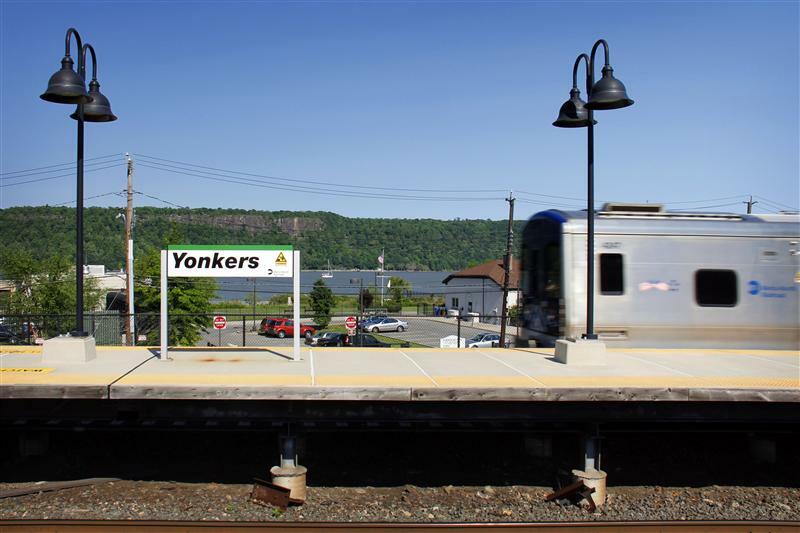 Yonkers is just over 14 miles from Grand Central, a ride that takes on average 30 minutes. 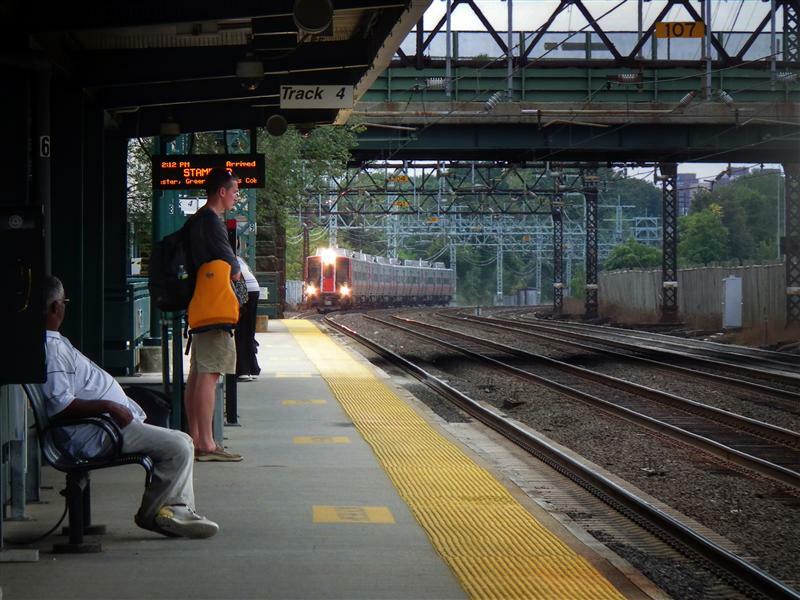 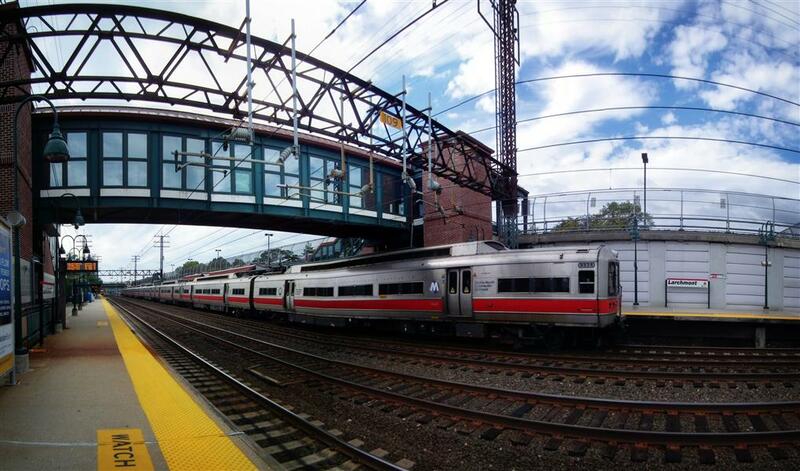 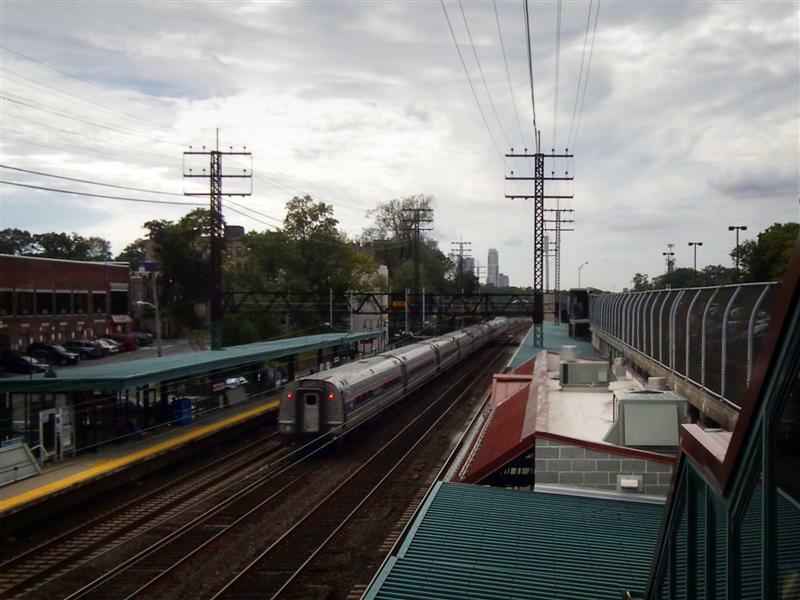 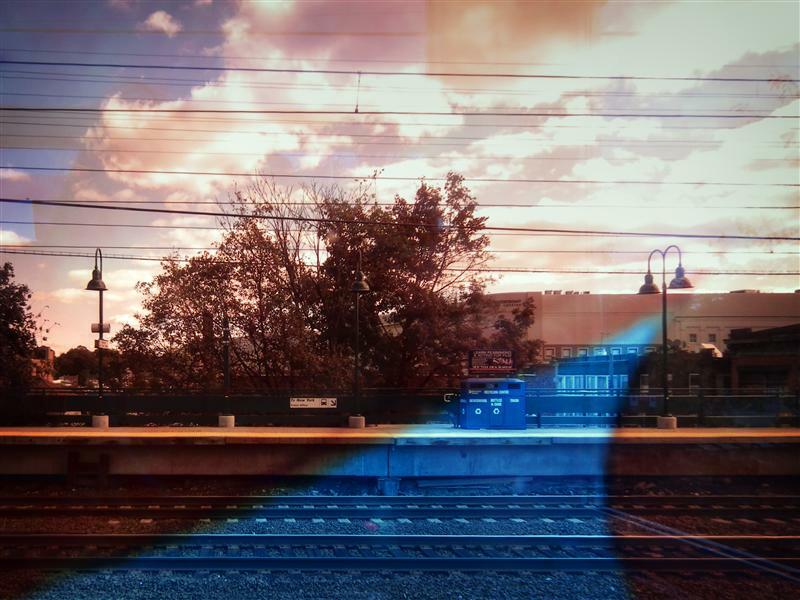 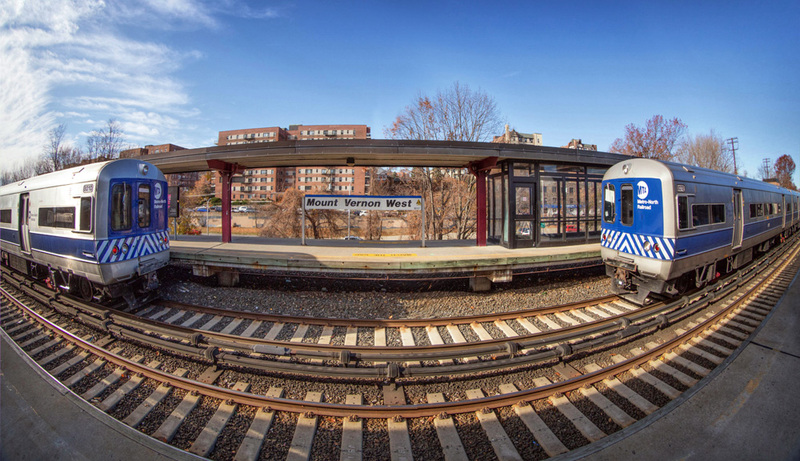 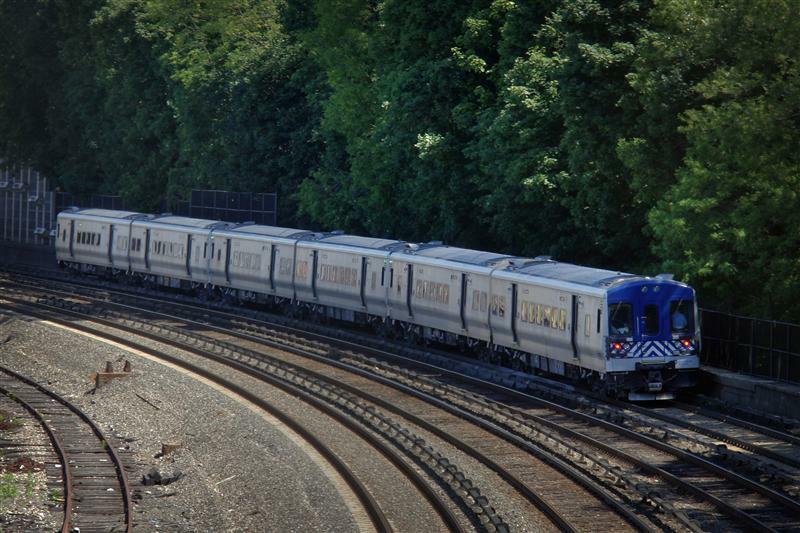 26 daily Amtrak trains make stops at Yonkers, and there are Metro-North trains every half hour, if not more frequently. 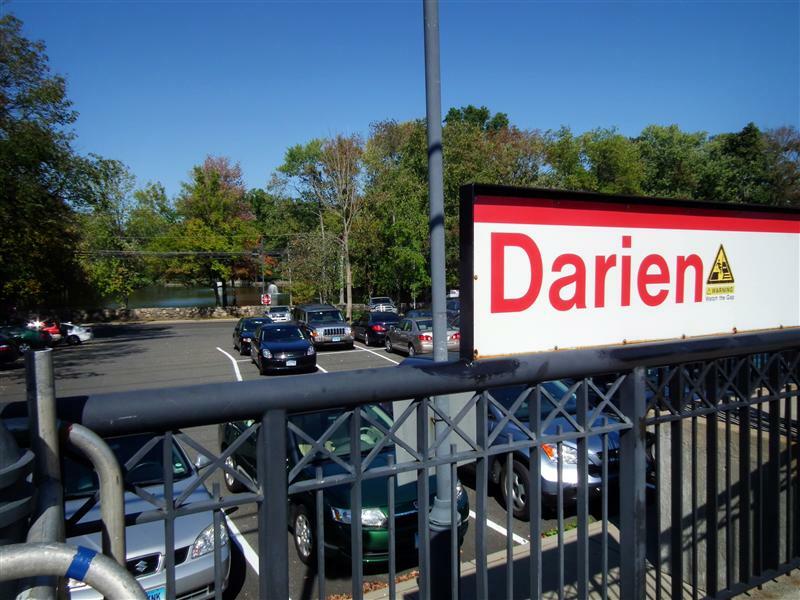 Welcome to Darien, a lovely Connecticut town filled with famous people, aspiring politicians, and people that make a whole lot more money than I do. 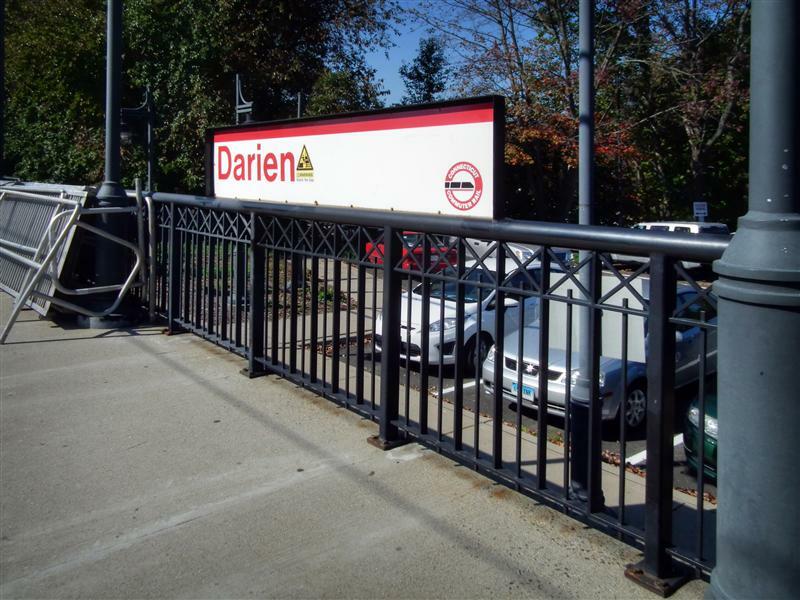 In fact, Darien is considered part of Connecticut’s “Gold Coast” – a moniker I had not even heard of prior to today. 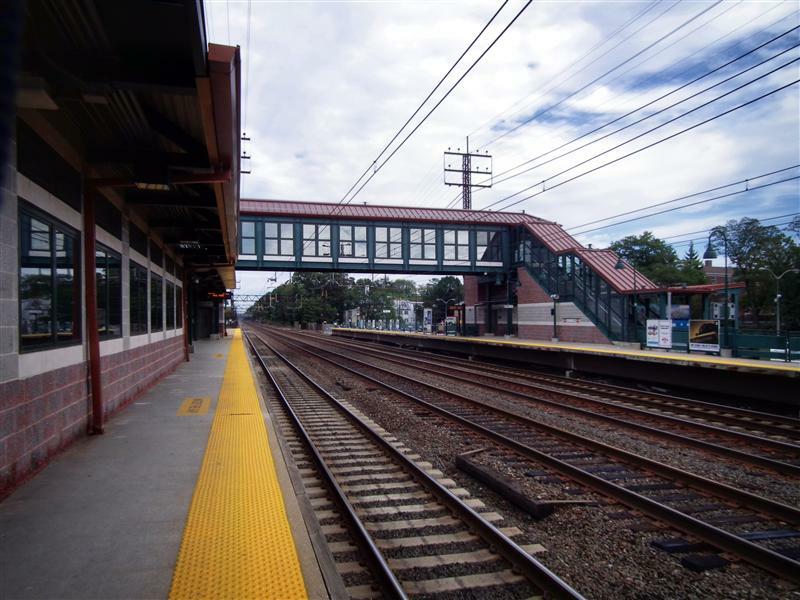 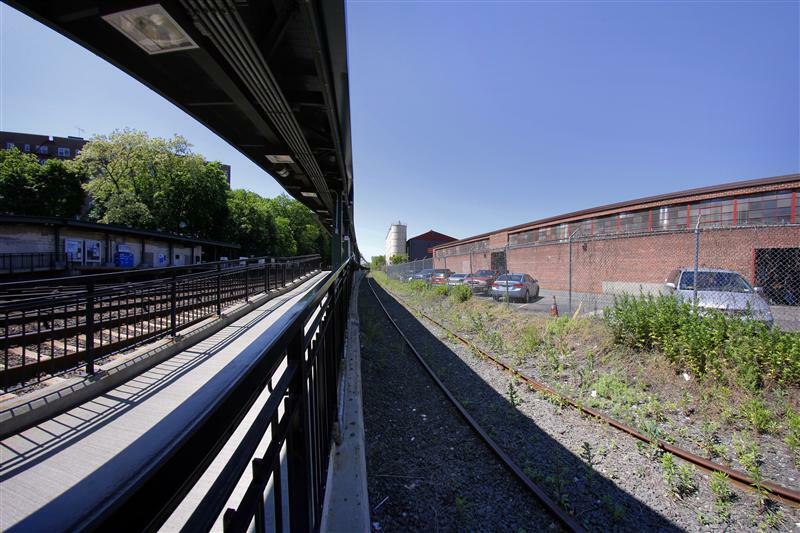 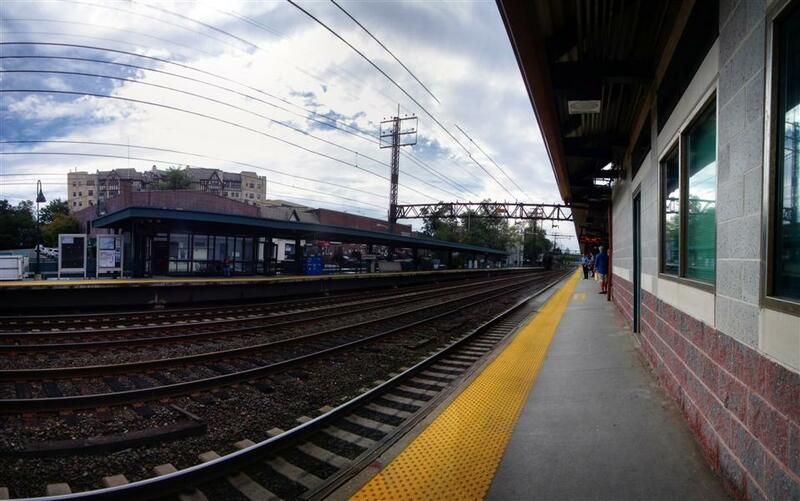 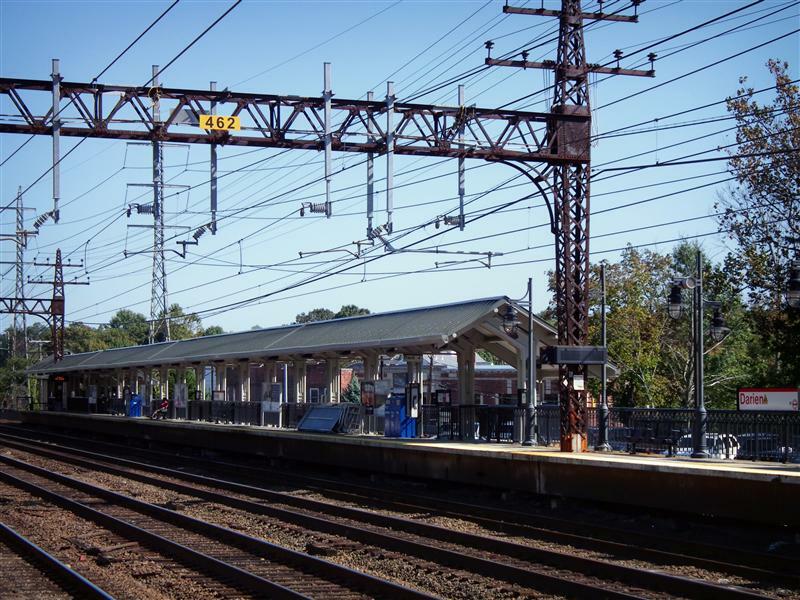 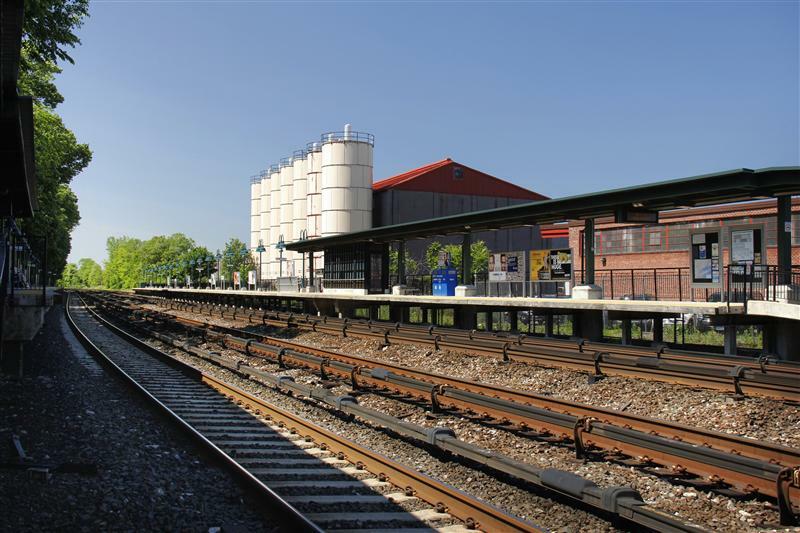 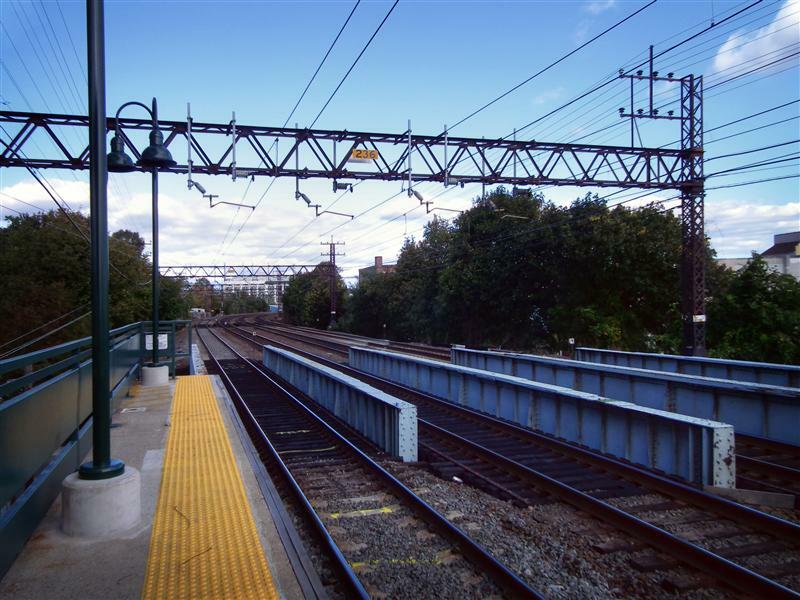 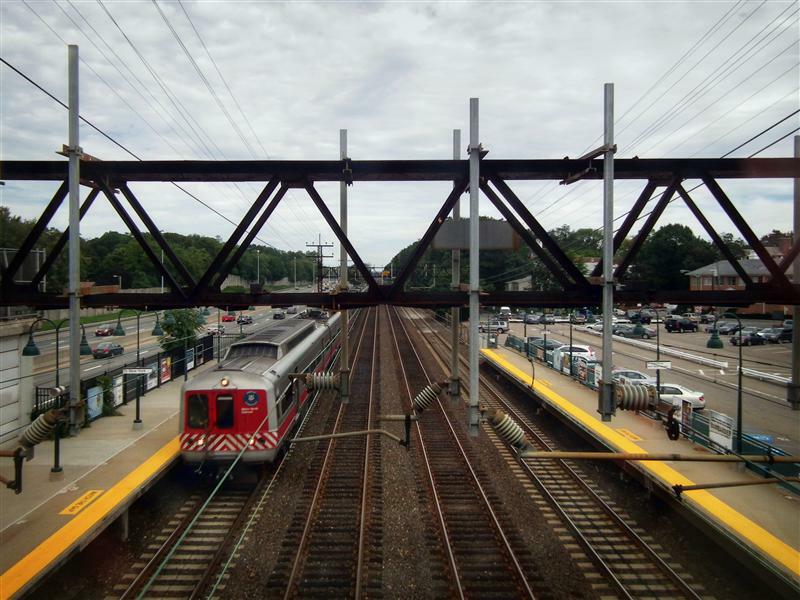 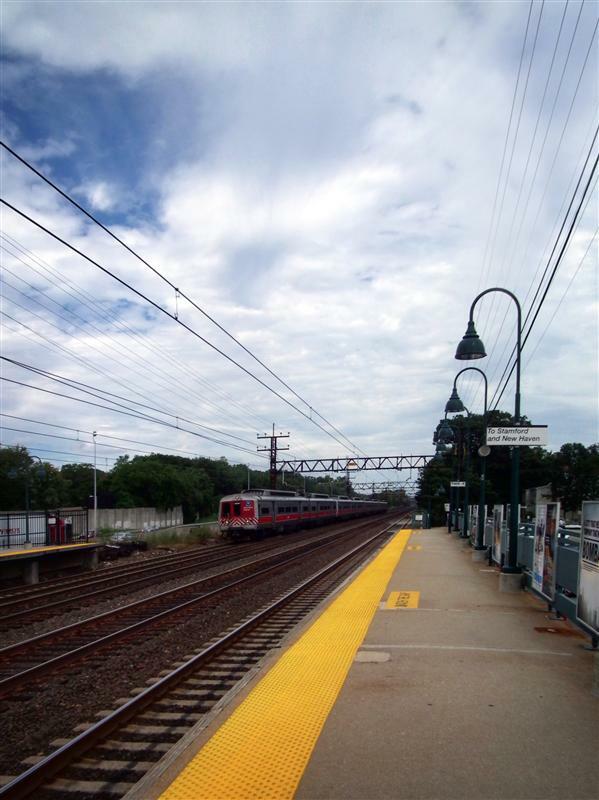 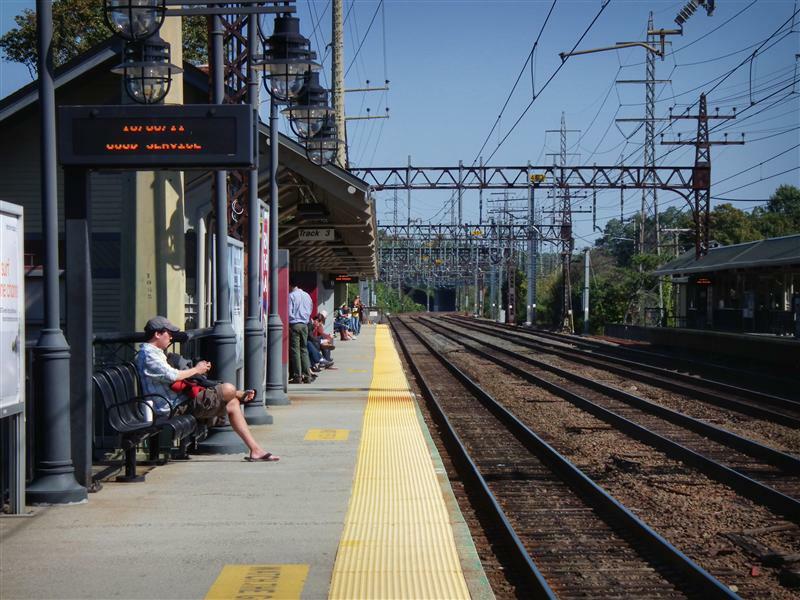 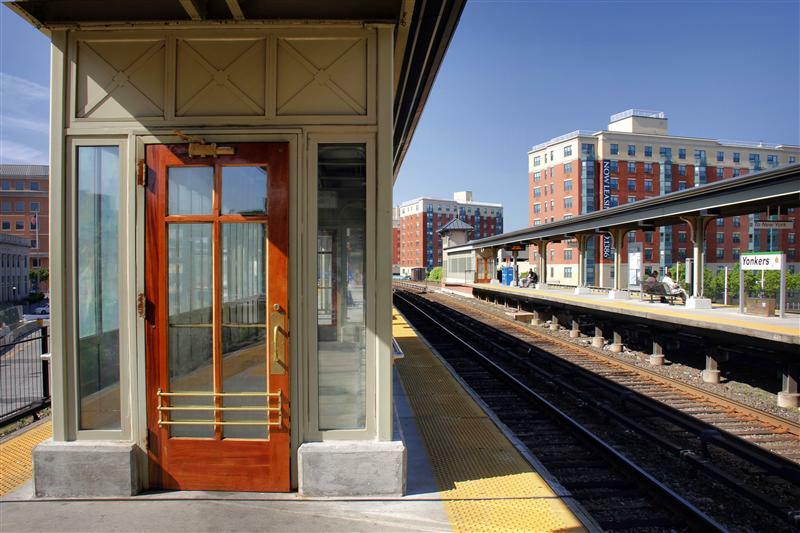 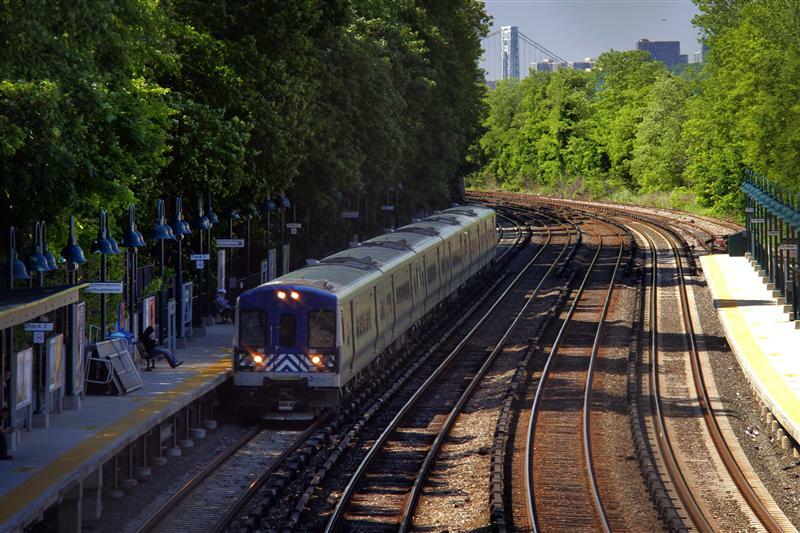 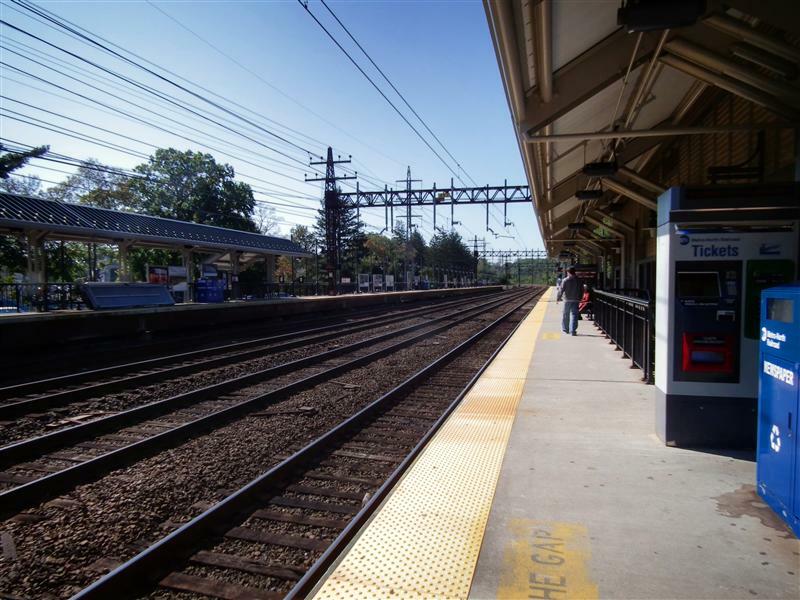 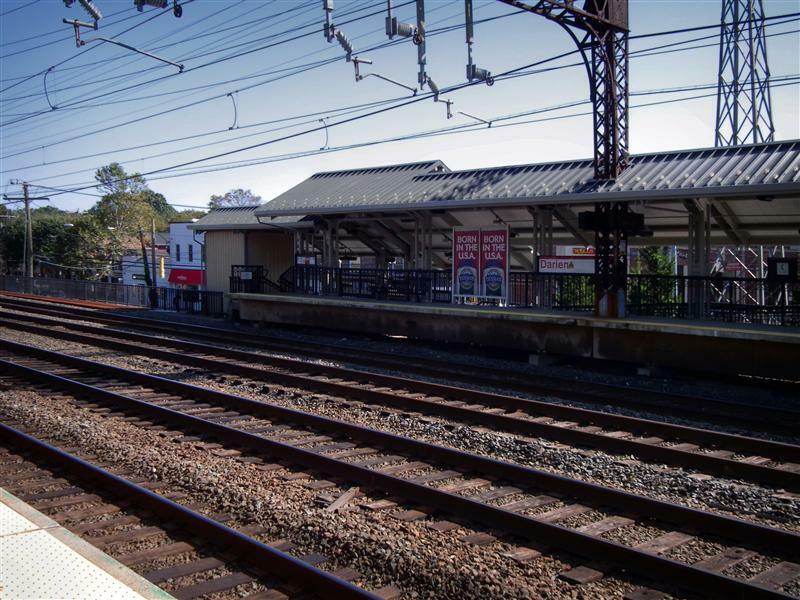 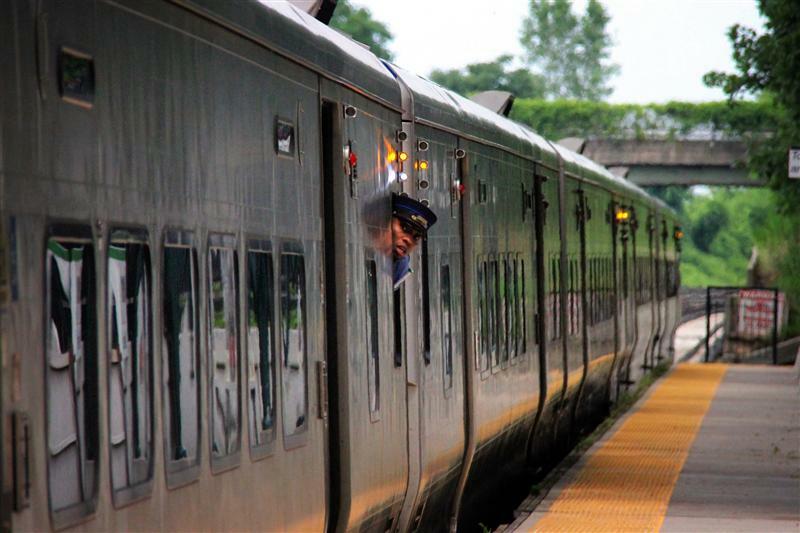 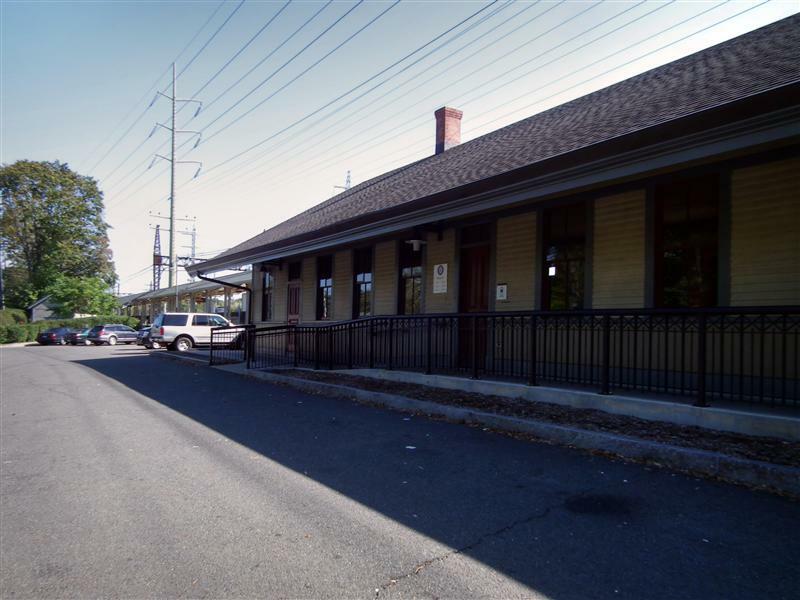 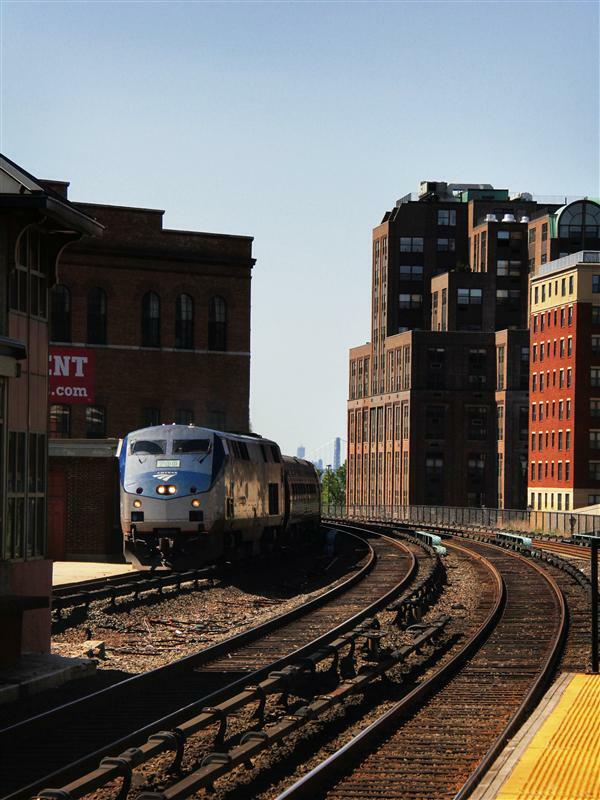 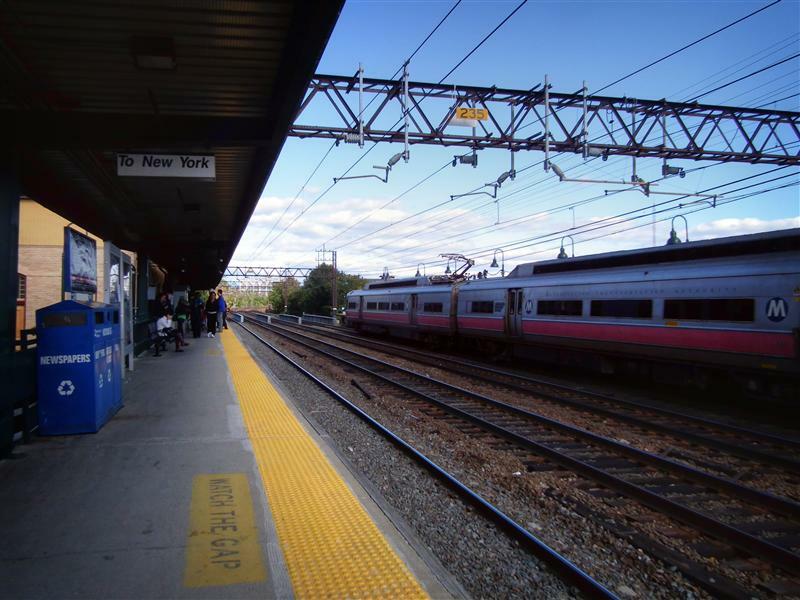 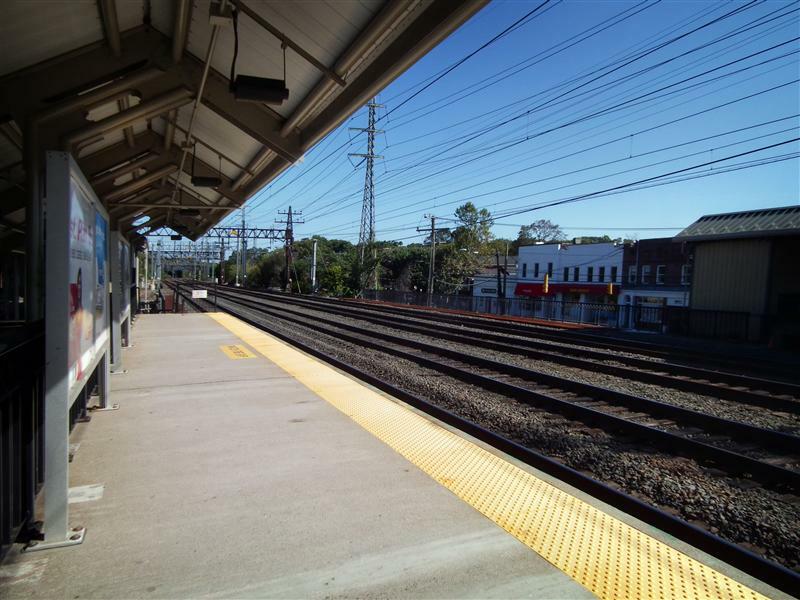 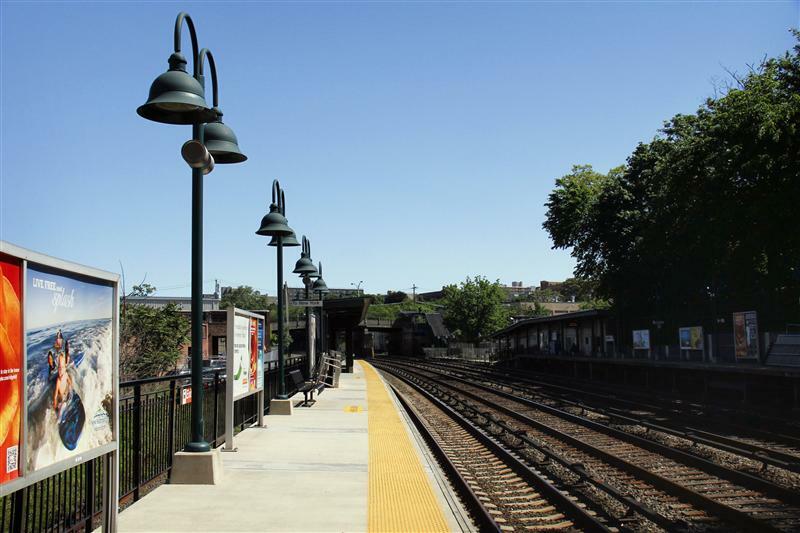 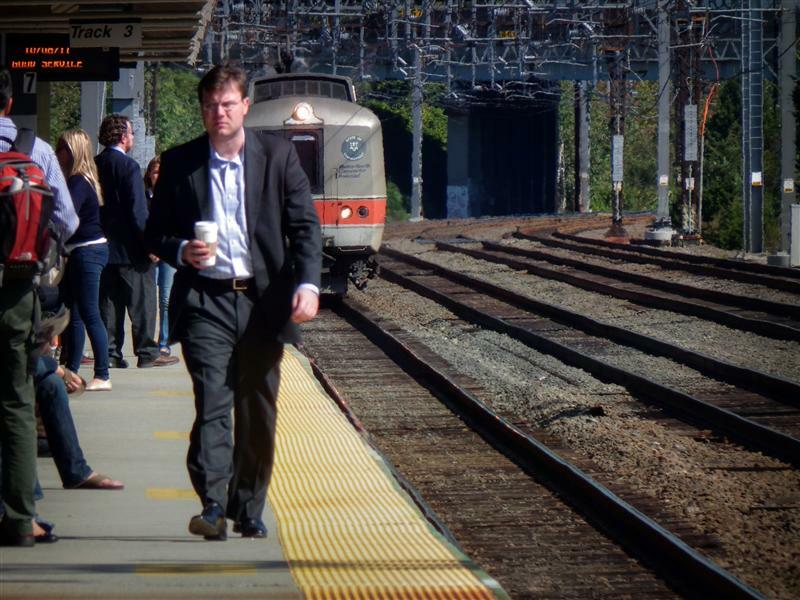 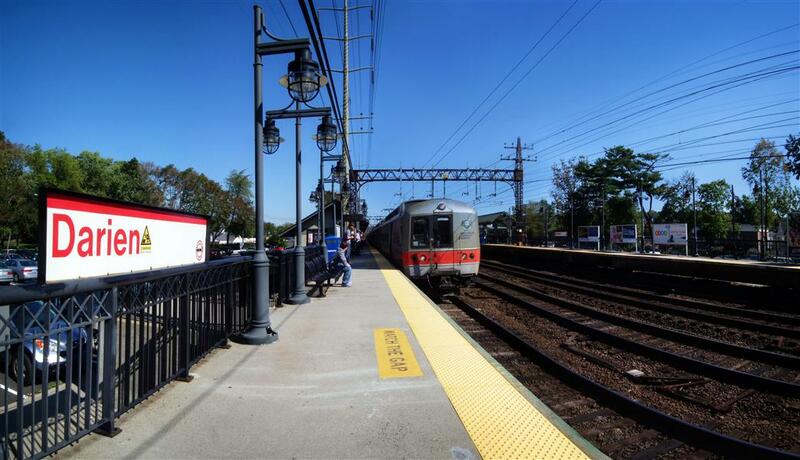 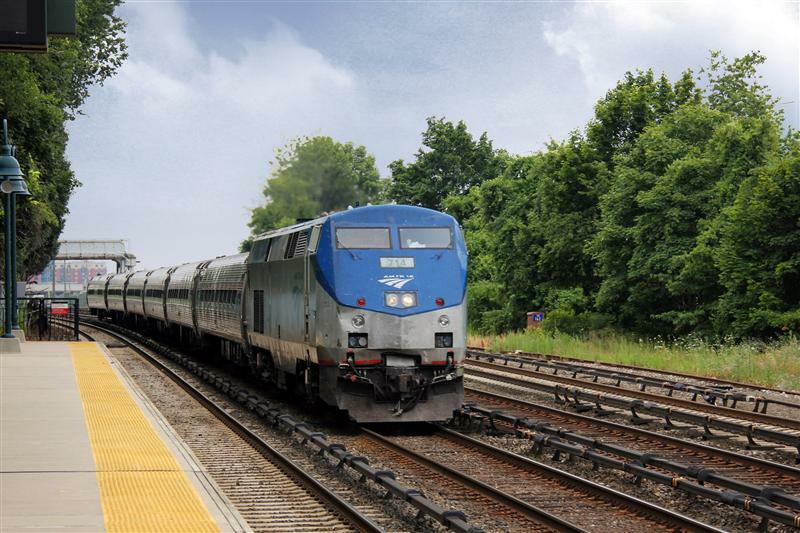 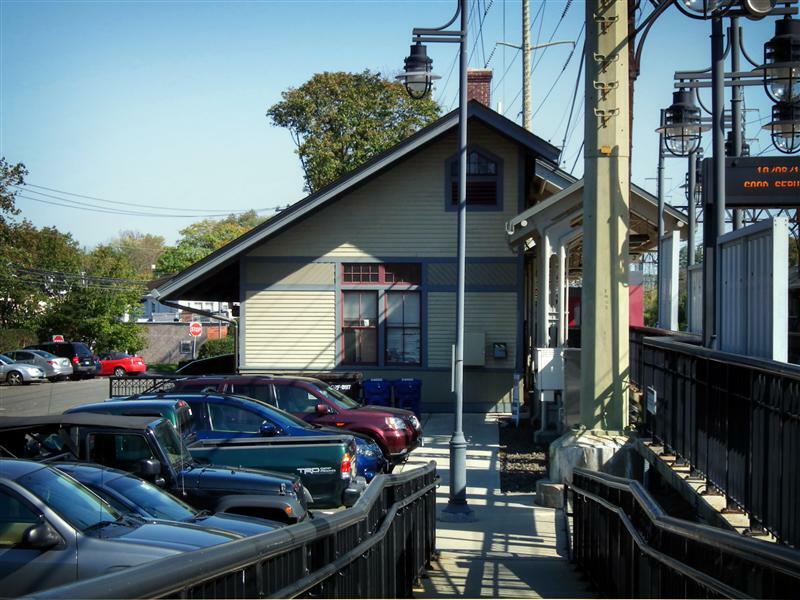 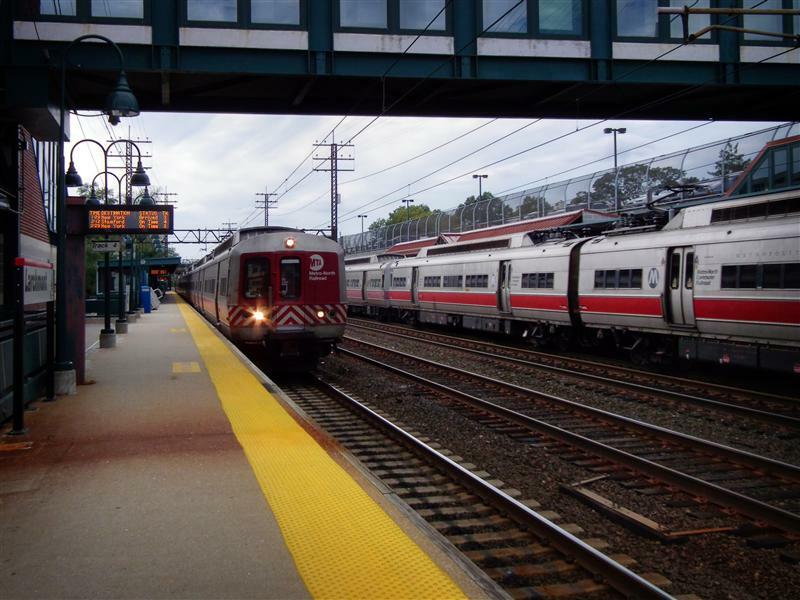 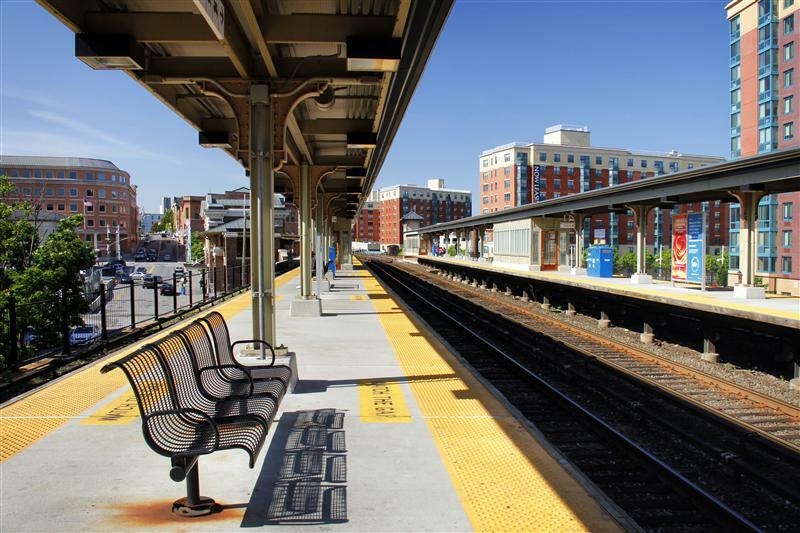 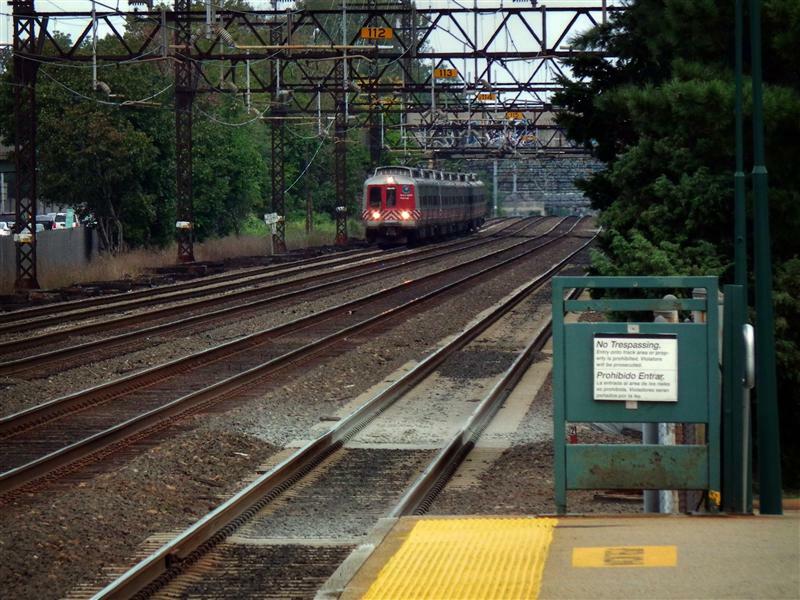 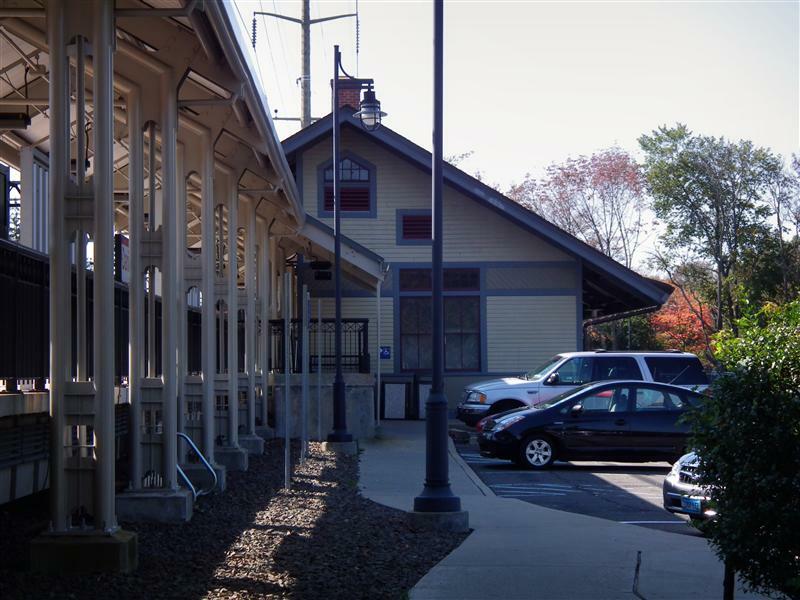 Along with other railroad towns I’ve featured – like New Canaan and Greenwich – Darien is certainly one of the more wealthy destinations along the New Haven Line. 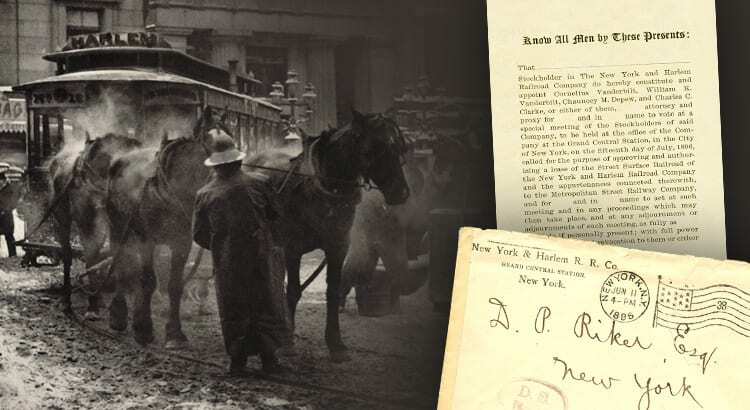 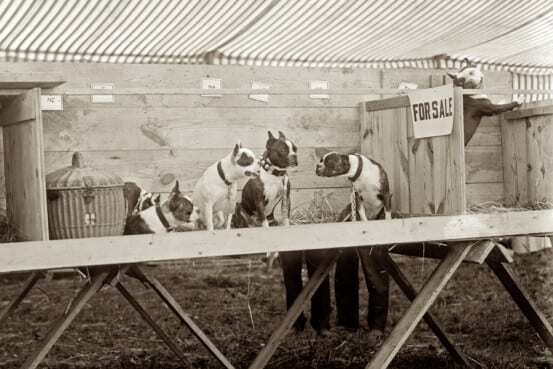 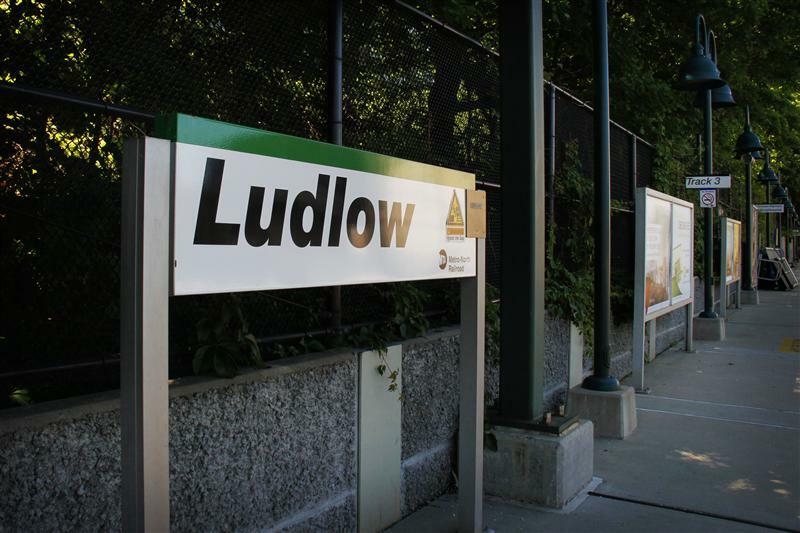 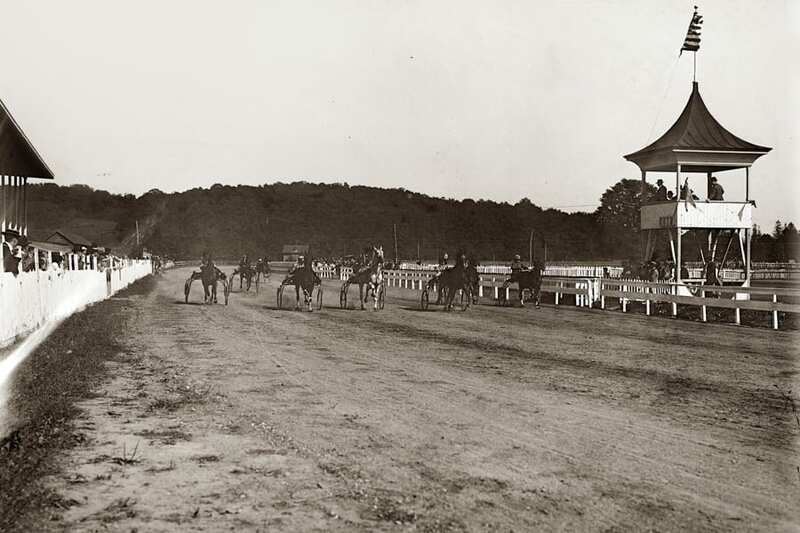 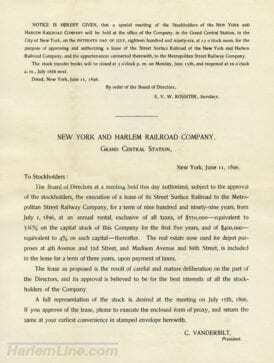 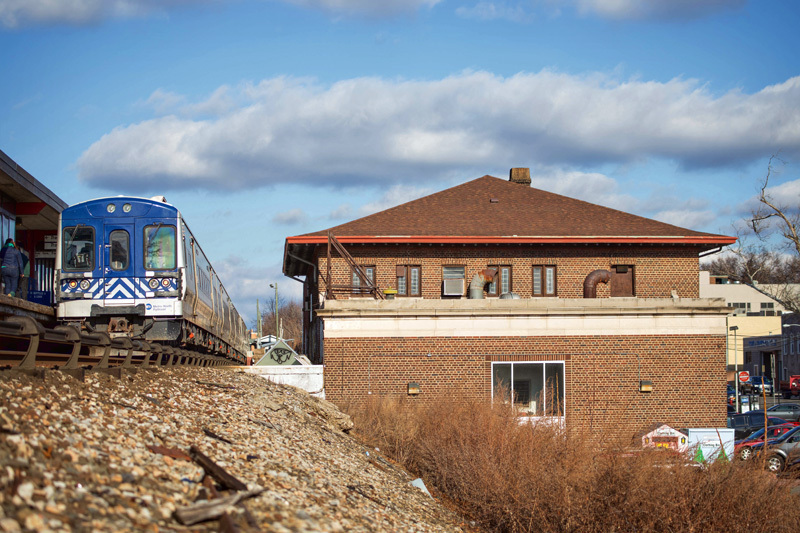 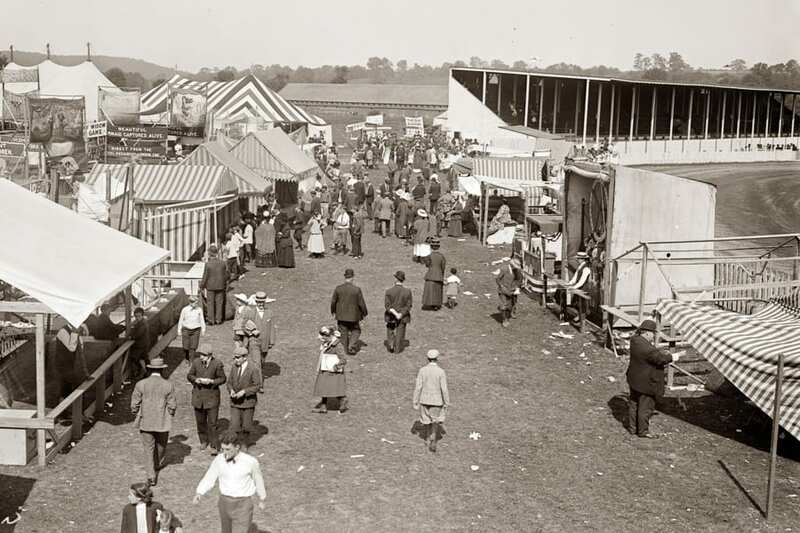 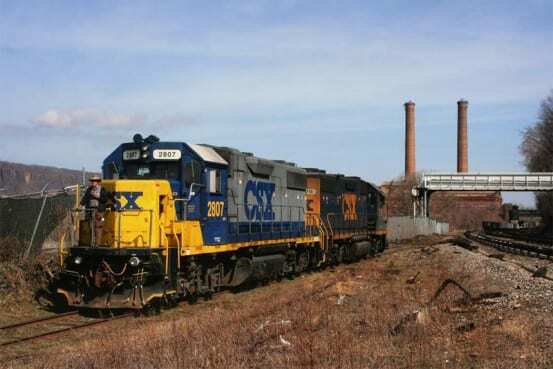 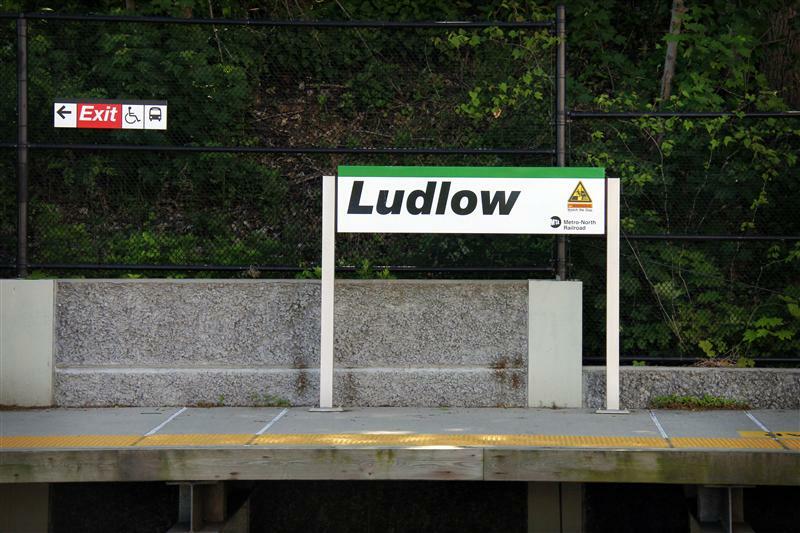 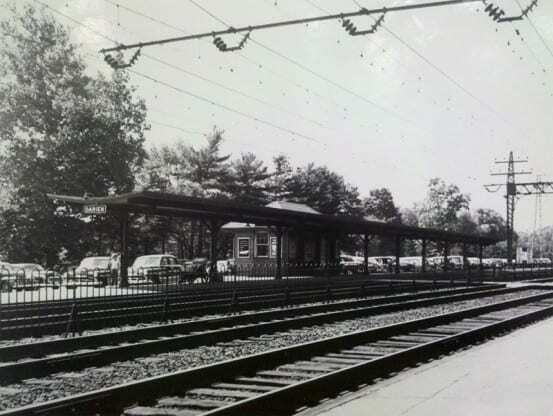 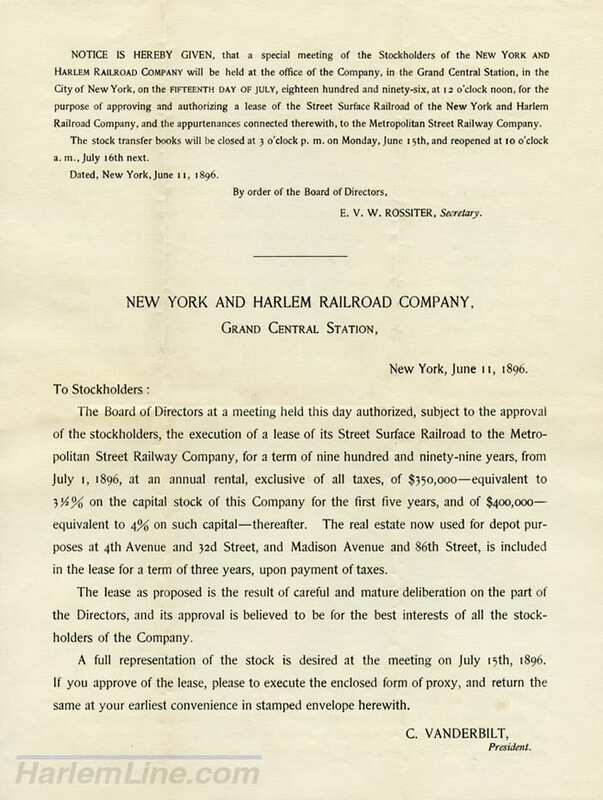 The story is still the same – the railroad enabled people to move out of the city and establish suburban communities in Westchester and southern Connecticut. 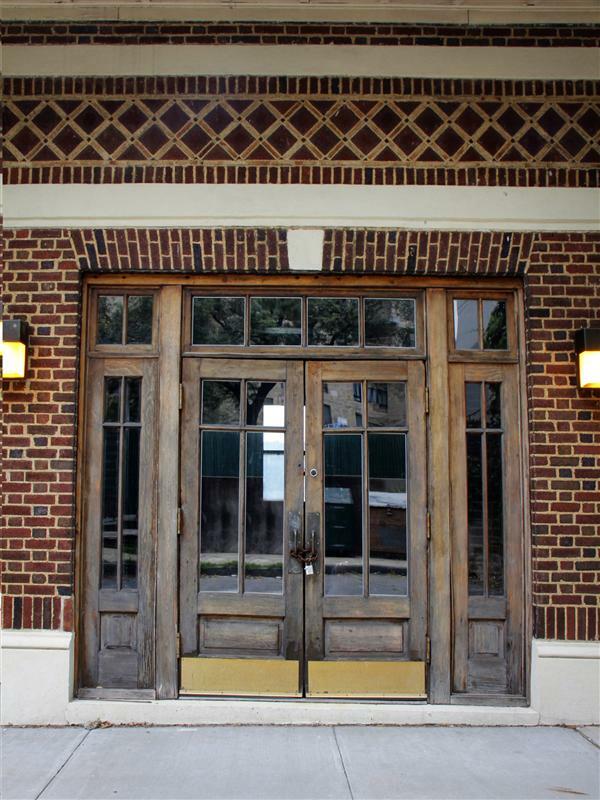 But really, who wouldn’t want to be able to work in the city during the week, and hang out at the yacht club on the weekend? 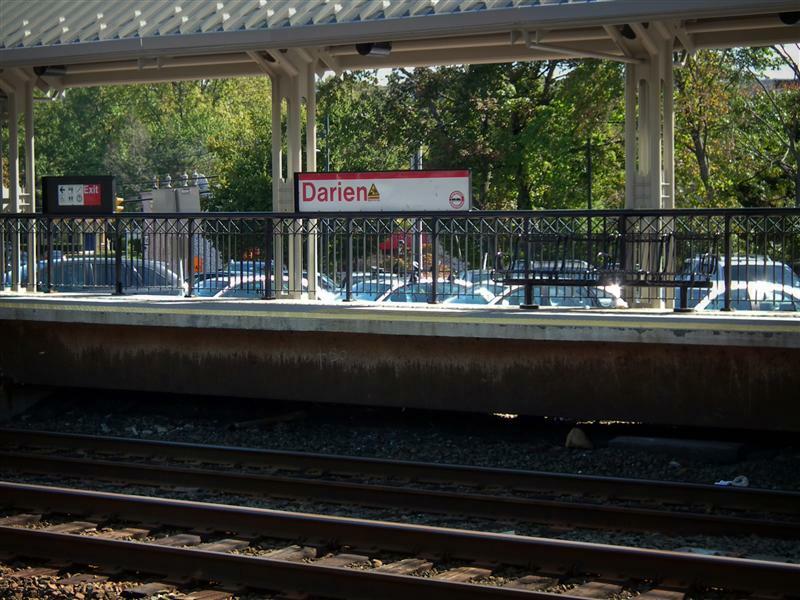 Darien station is one of two stations in the town of Darien, the other being Noroton Heights, which is one stop to the west. 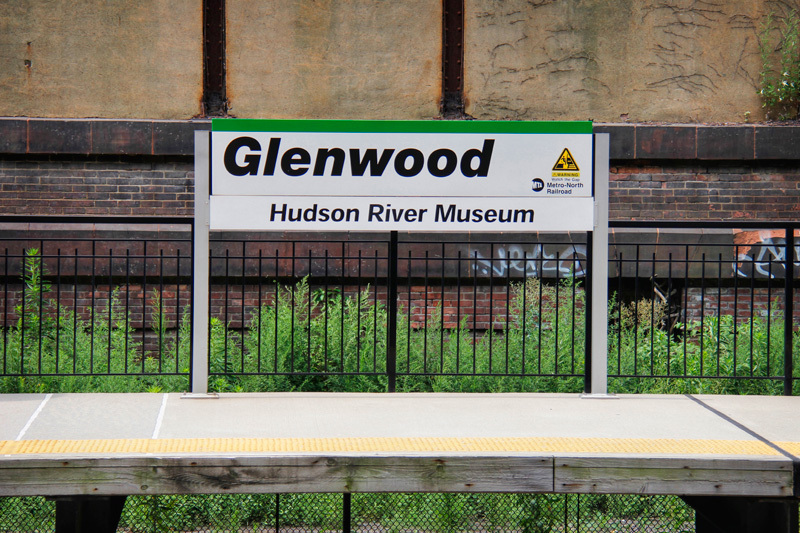 The station is slightly less than 38 miles from the city, and it takes you just under an hour to get to Grand Central. 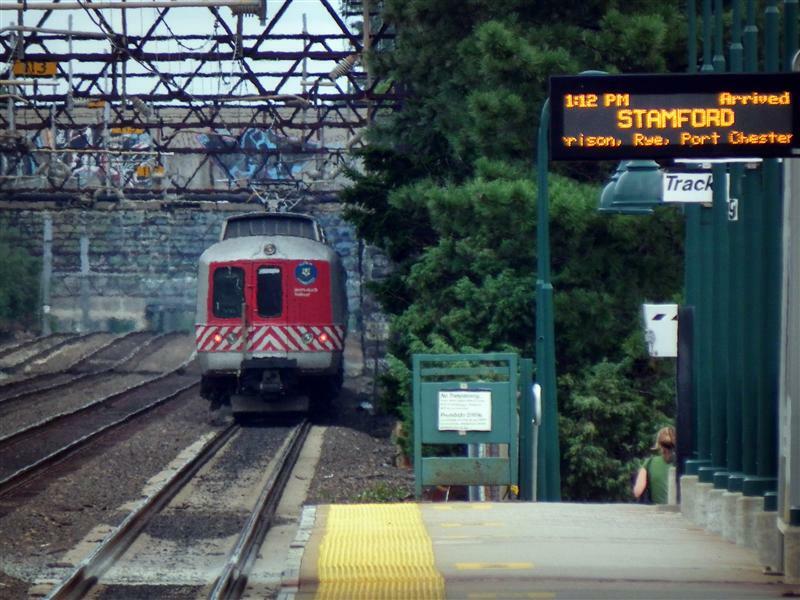 Stamford, on the other hand, is a short, approximately five mile, jaunt that takes a bit less than ten minutes. 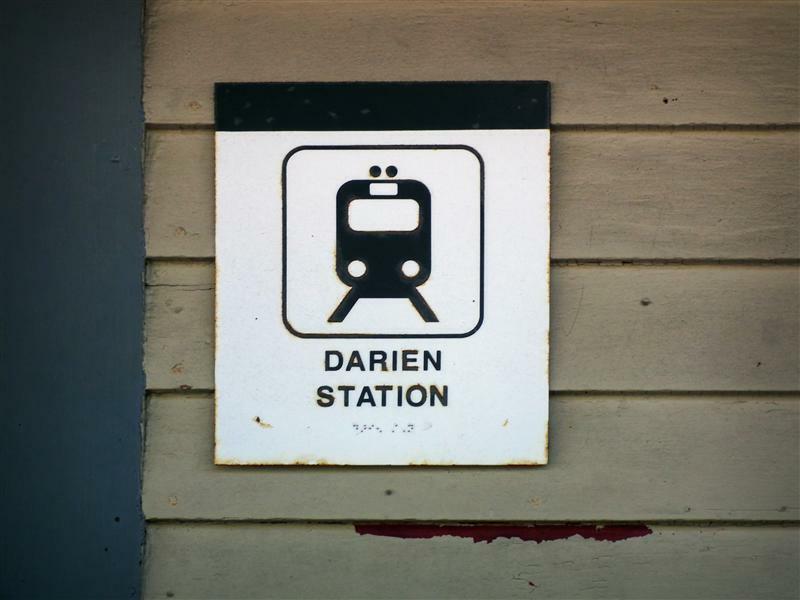 It was at Darien that I think I realized the true nature of my terrorist photographer tendencies. 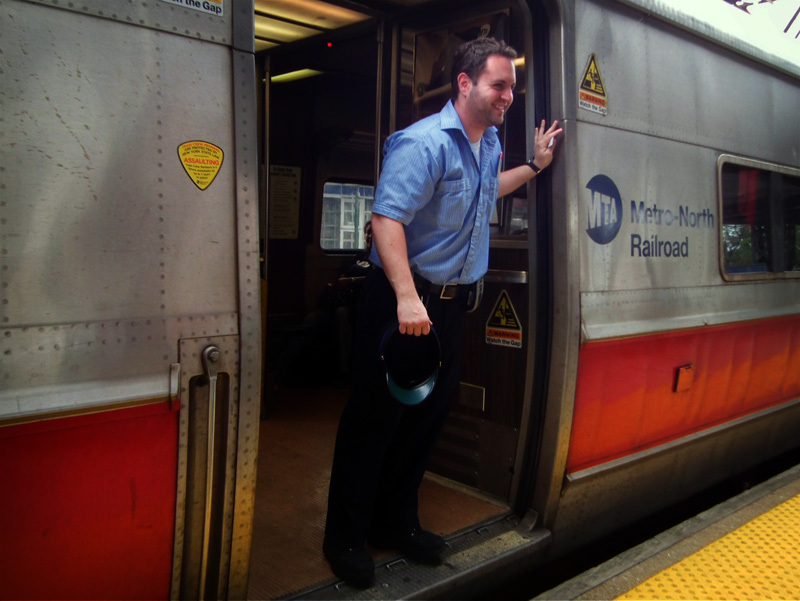 Metro North published a nice little “System Safety / Security Pocket Guide” for employees. 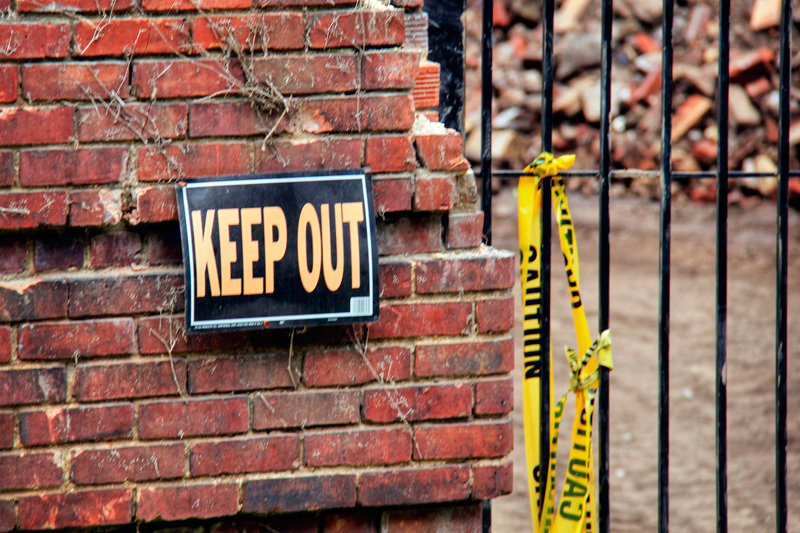 Inside it lists various suspicious behaviors that should be reported straight away. 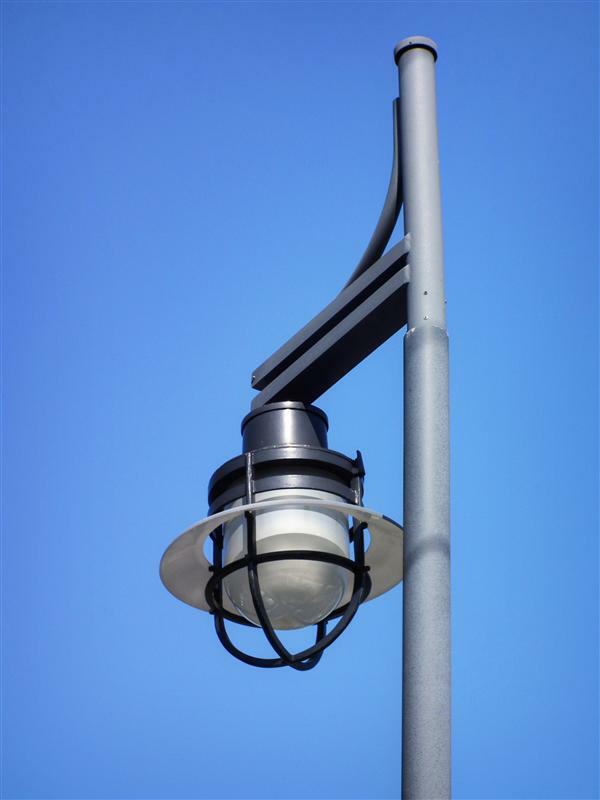 One of which says, “Taking photos in areas of little interest to the public.” I don’t know about you, but I am not sure if light fixtures are of real interest to the public. 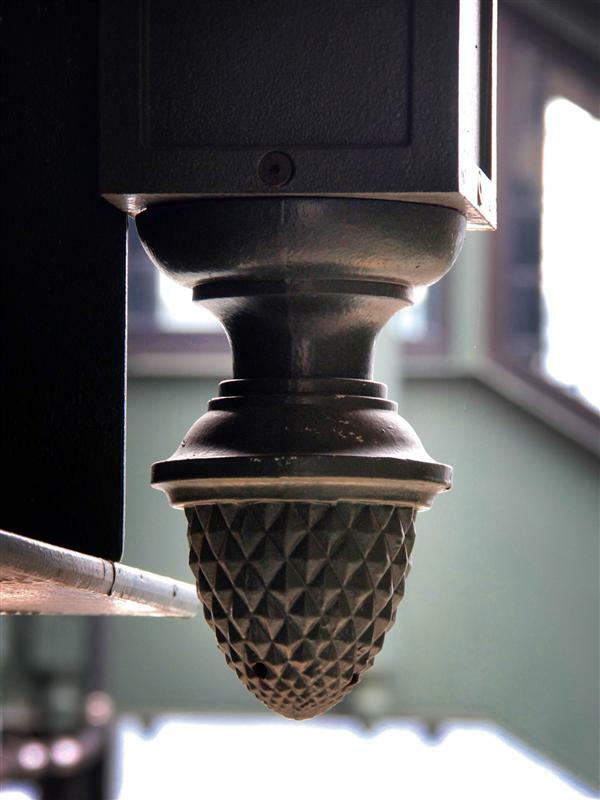 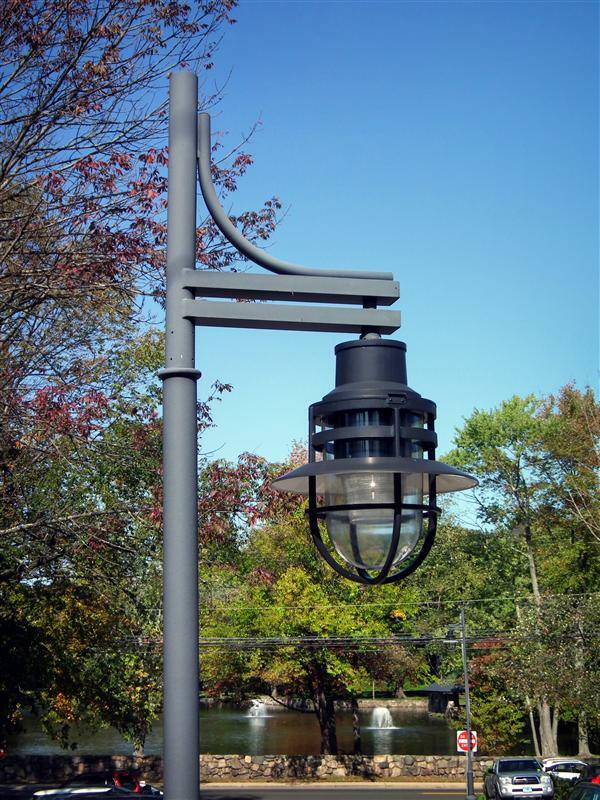 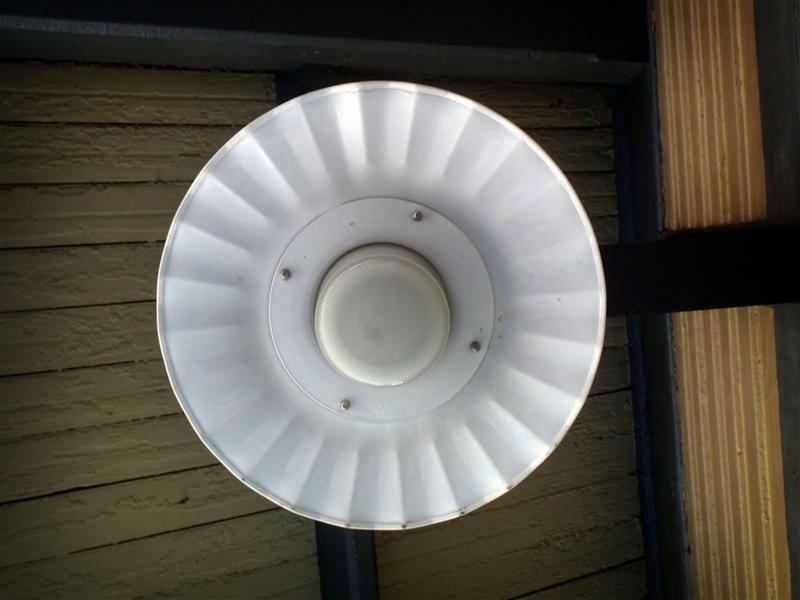 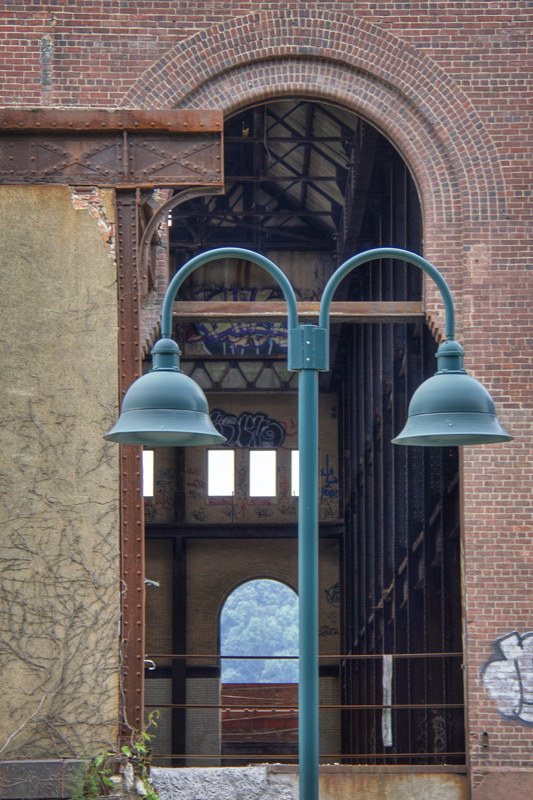 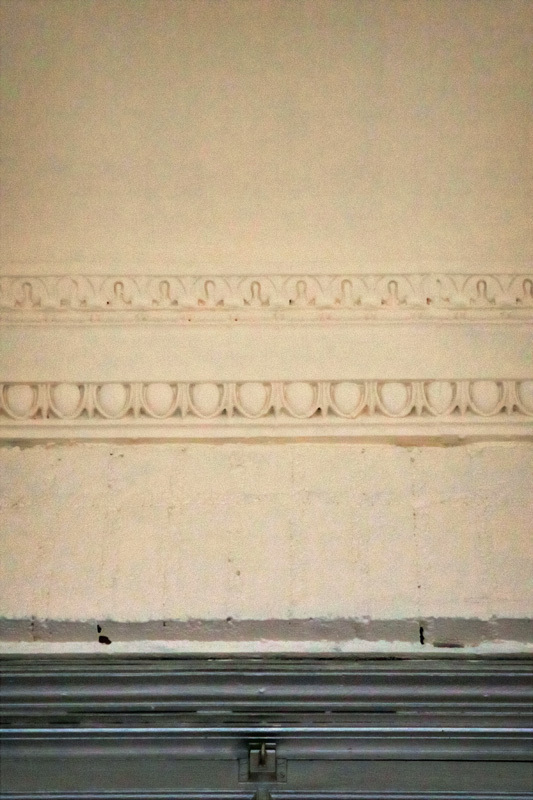 In fact, I think I took more photos of light fixtures than I did of the 100+ year old Darien station. 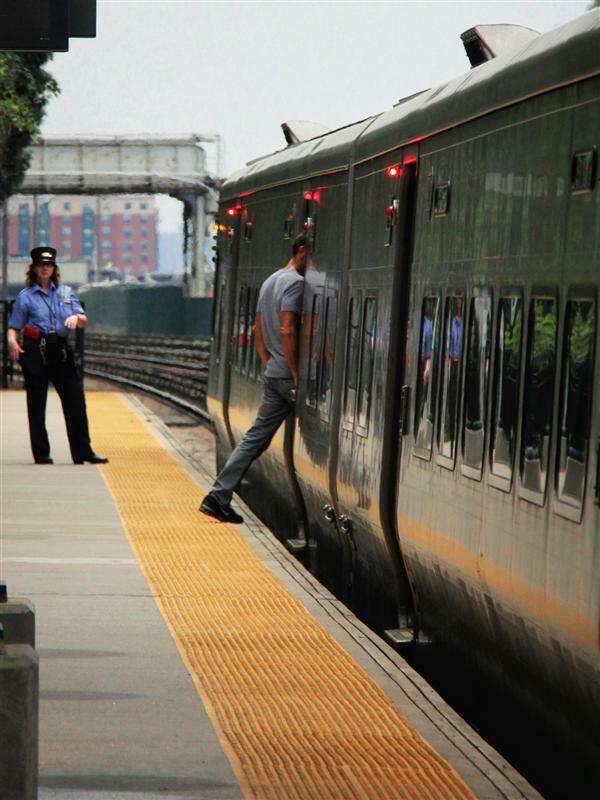 Thankfully it wasn’t a hot day – sweating is another suspicious behavior. 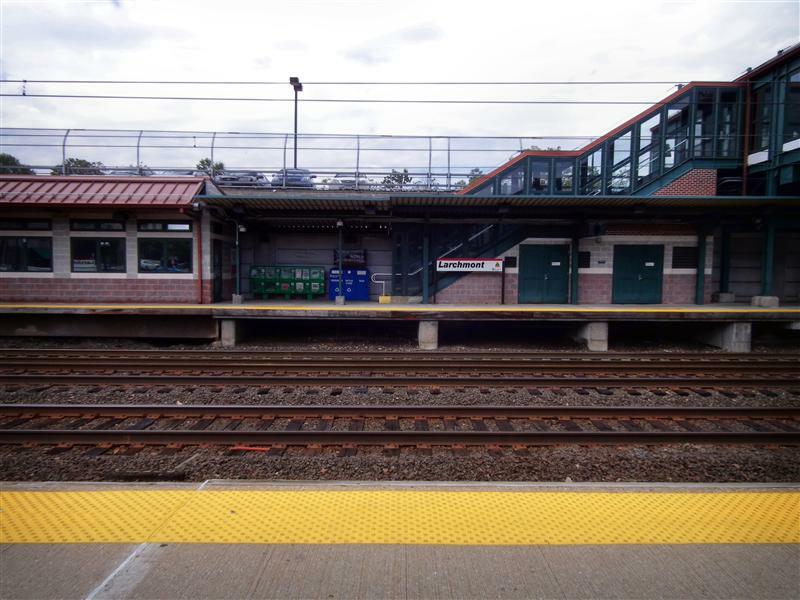 Below you will find all of the suspicious photos I snapped at Darien – which is the second-to-last station to be featured on our tour of the New Haven Line. 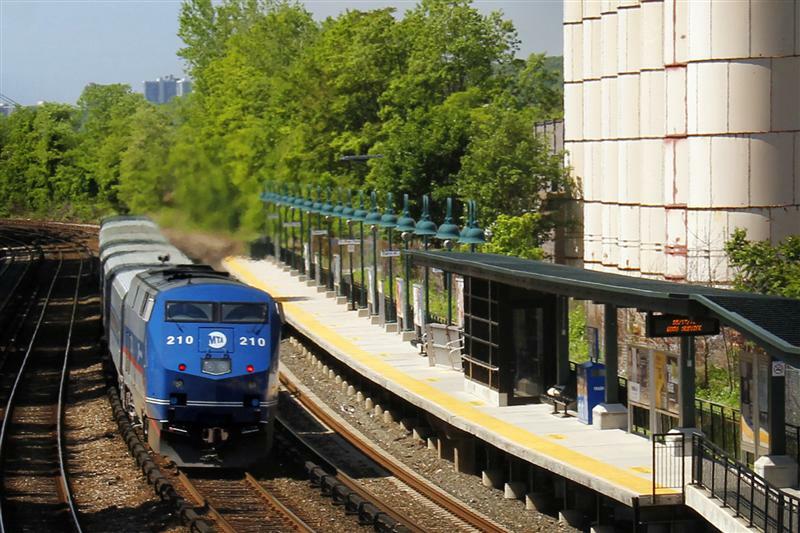 Next Tuesday will be our final station stop – Stamford. 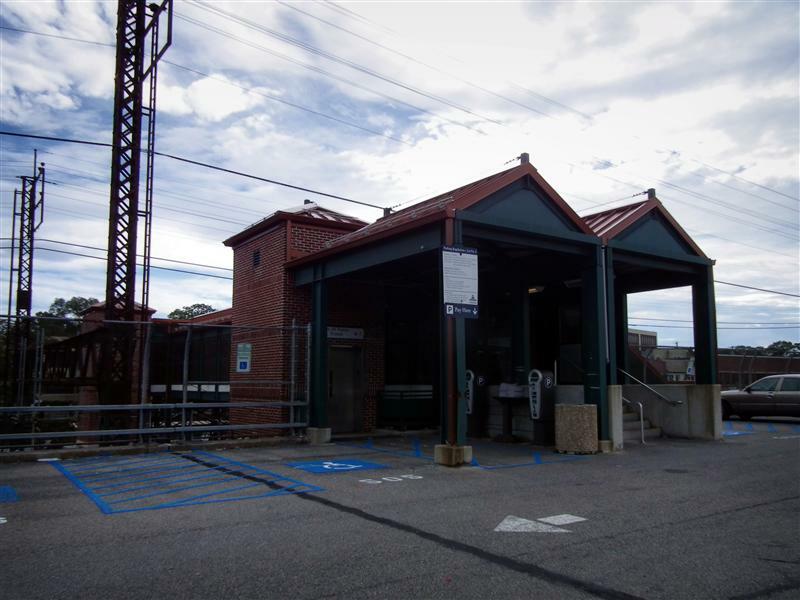 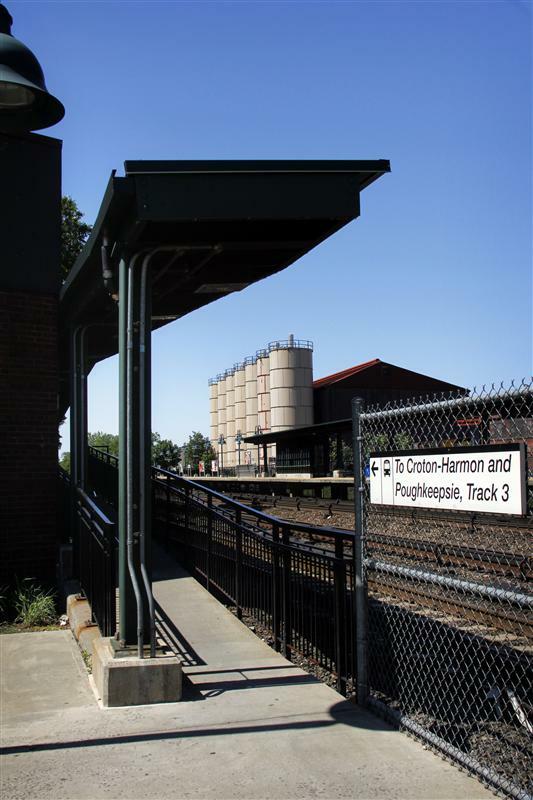 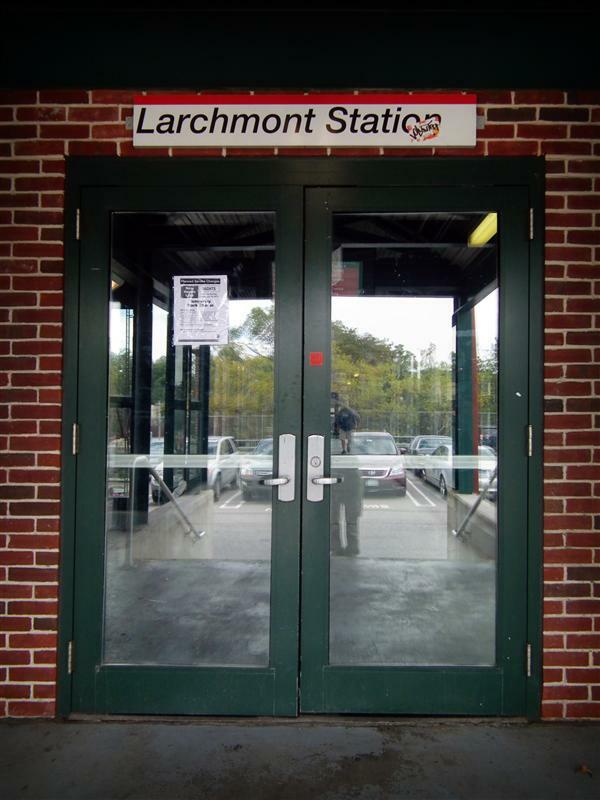 Today’s stop on the tour of the New Haven Line is Larchmont, one of the handful of stations on the line located in New York state. 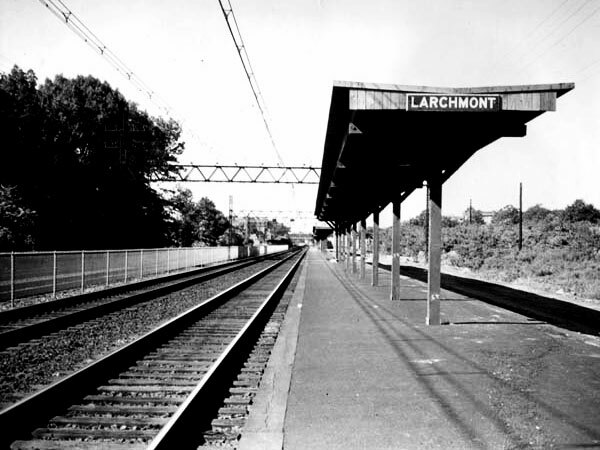 Larchmont, situated about 18 miles from Grand Central and in between New Rochelle and Mamaroneck, is a rather unique set-up. 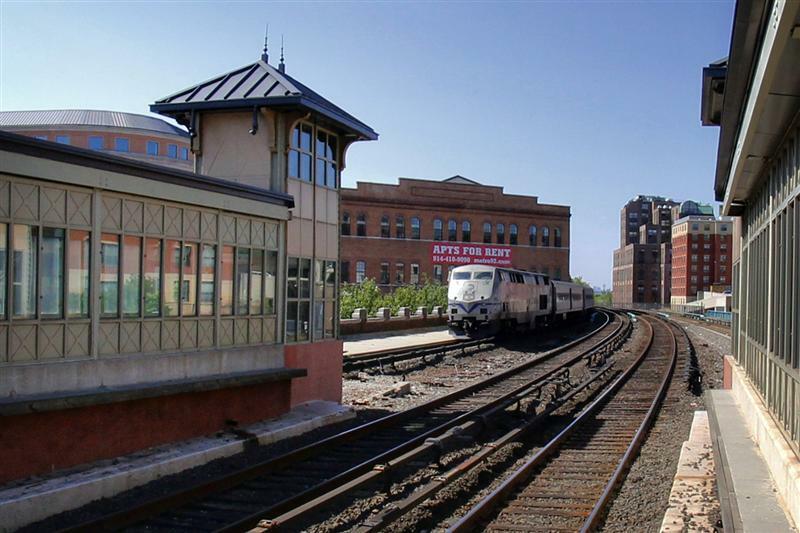 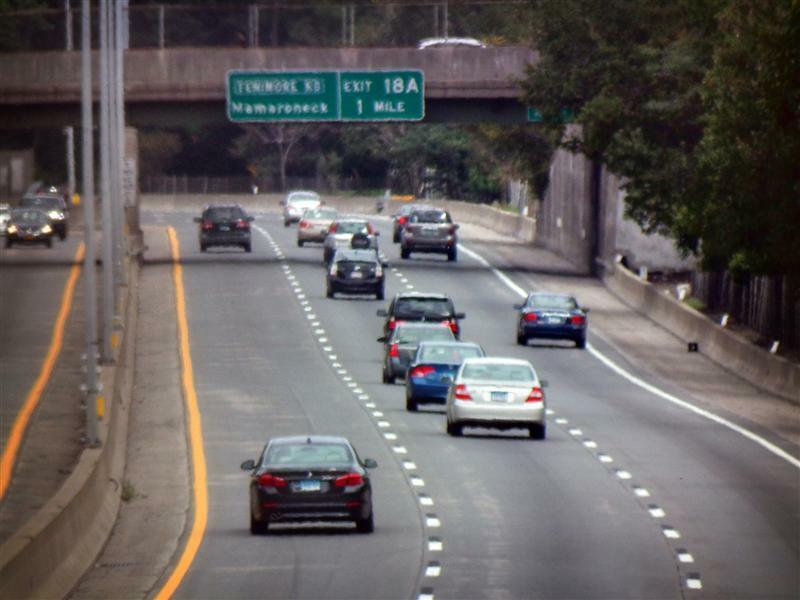 The station and platform run parallel to Interstate 95 – and the parking garage for the station is constructed over the highway. 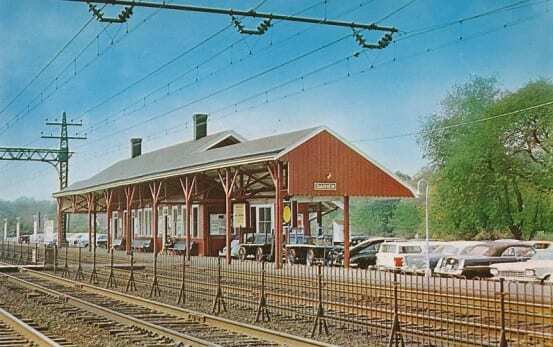 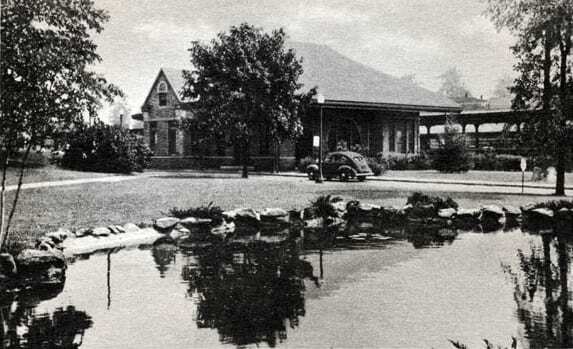 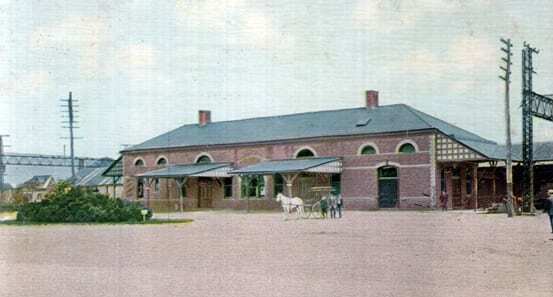 The older station was demolished around the 1950’s when the highway was being constructed, and was replaced with what we have now. 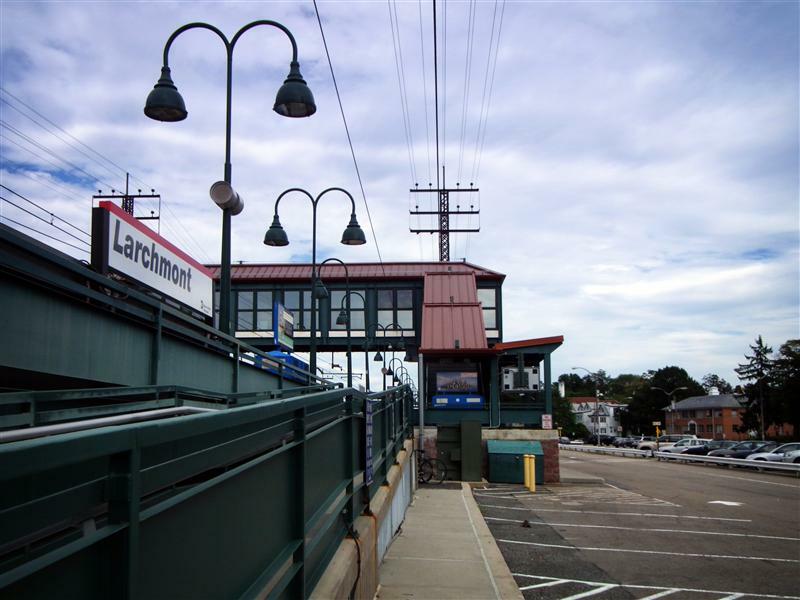 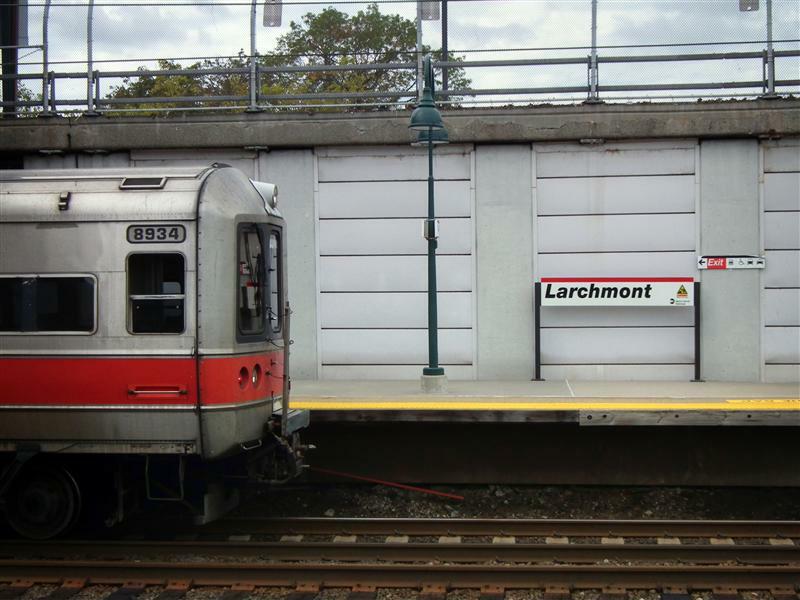 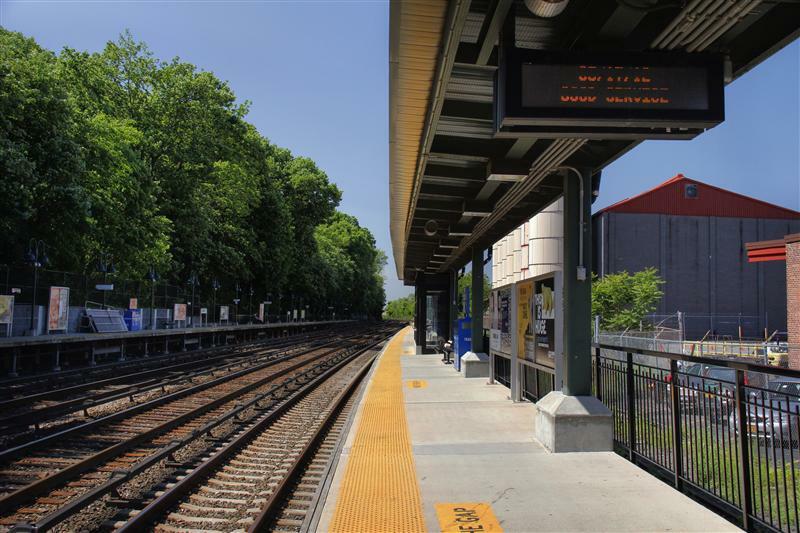 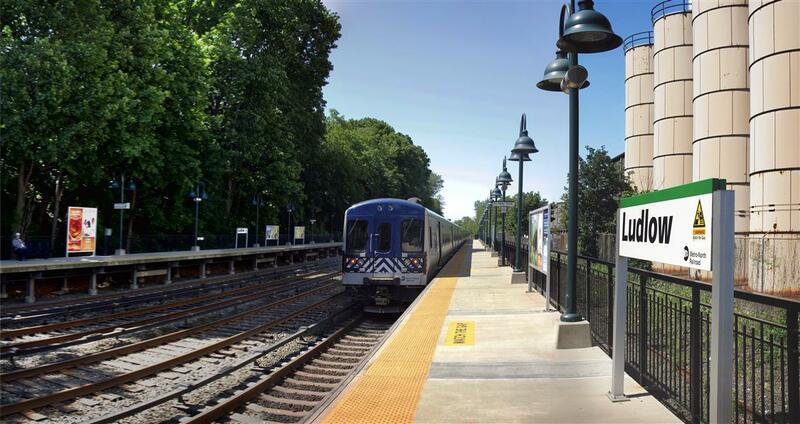 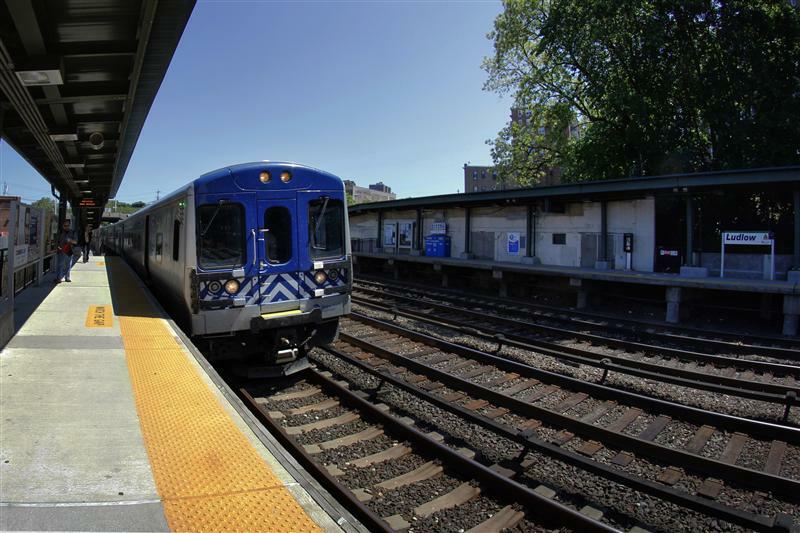 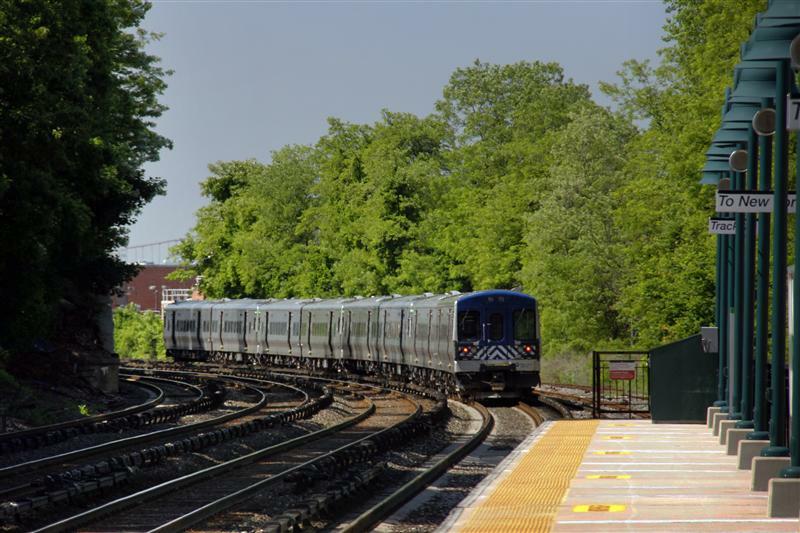 Larchmont has all the newest Metro-North train tech, with both video boards in the overpass that list the next nine trains, as well as announcement boards over the platform that identifies the next train and where it will be stopping. 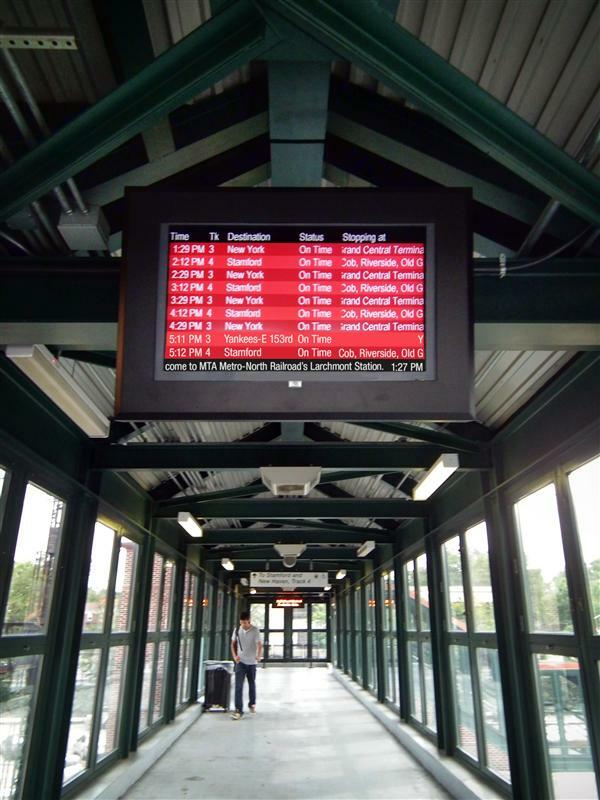 These are standard at larger train stations, such as Harlem-125th and White Plains. 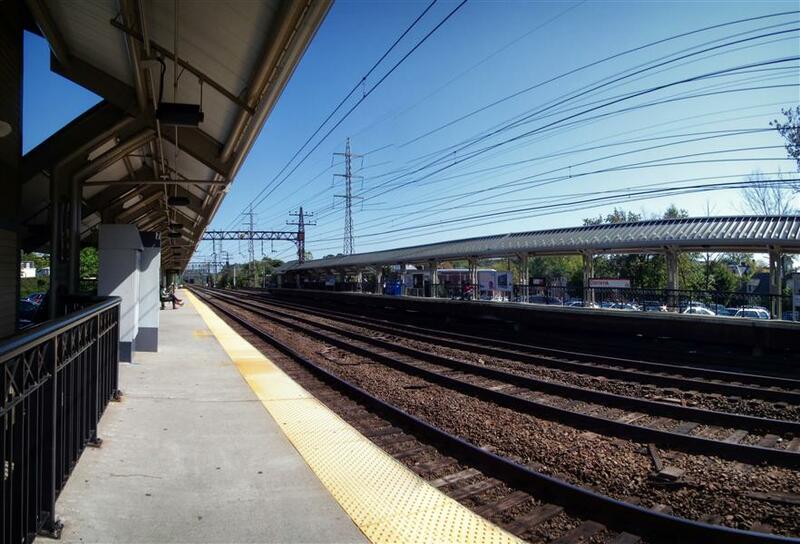 There is a small station building, but it was closed during my visit. 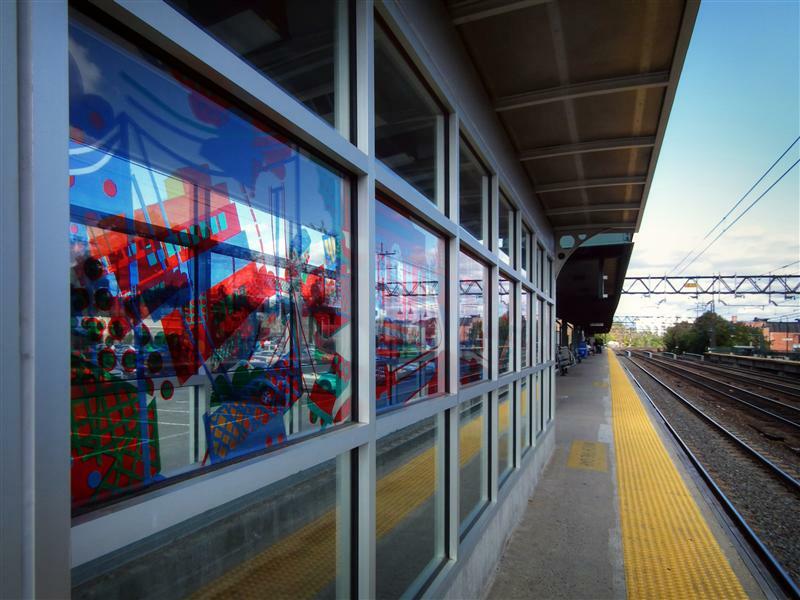 Which is unfortunate, because there was an Arts for Transit mosaic in there which I didn’t really get to see. 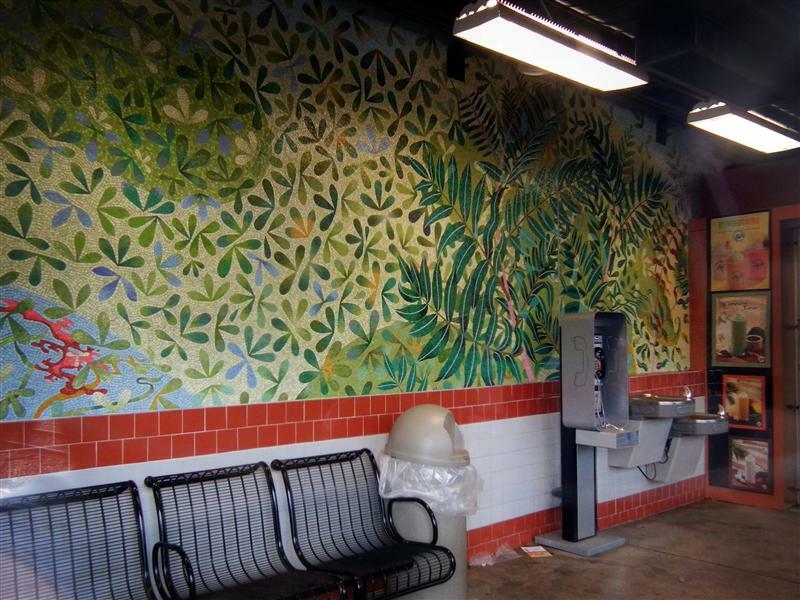 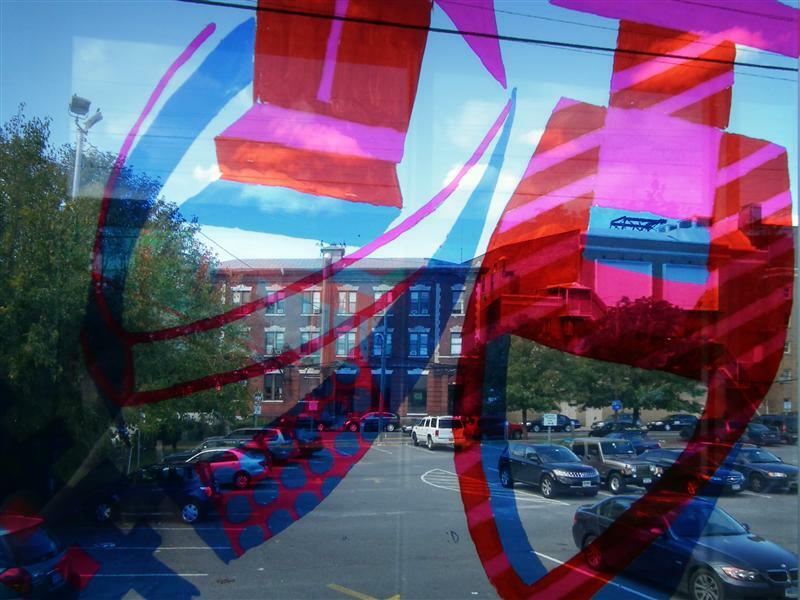 I still must wonder why the heck Arts for Transit places artwork in station buildings that are most often closed. 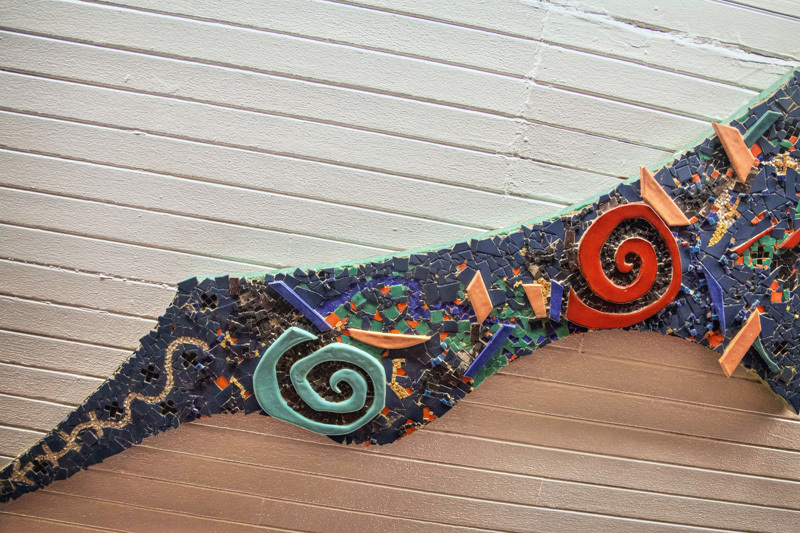 The forty foot long mosaic is by artist Joy Taylor and is titled The Four Seasons. 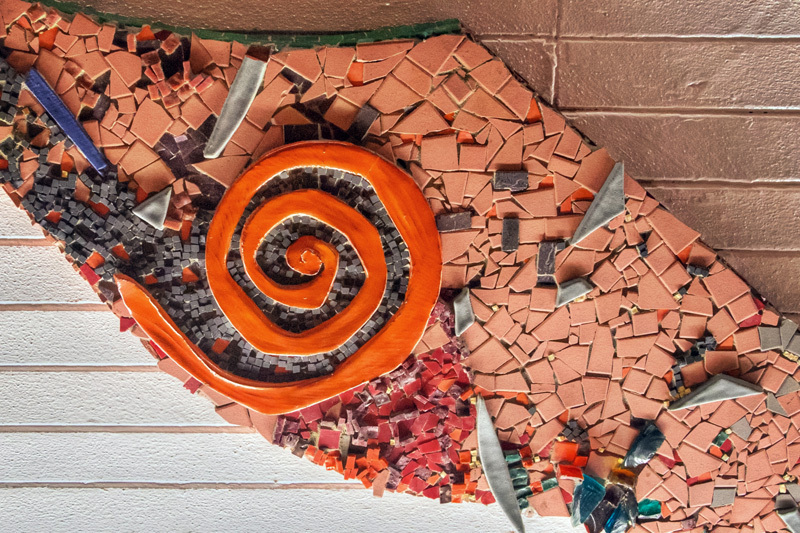 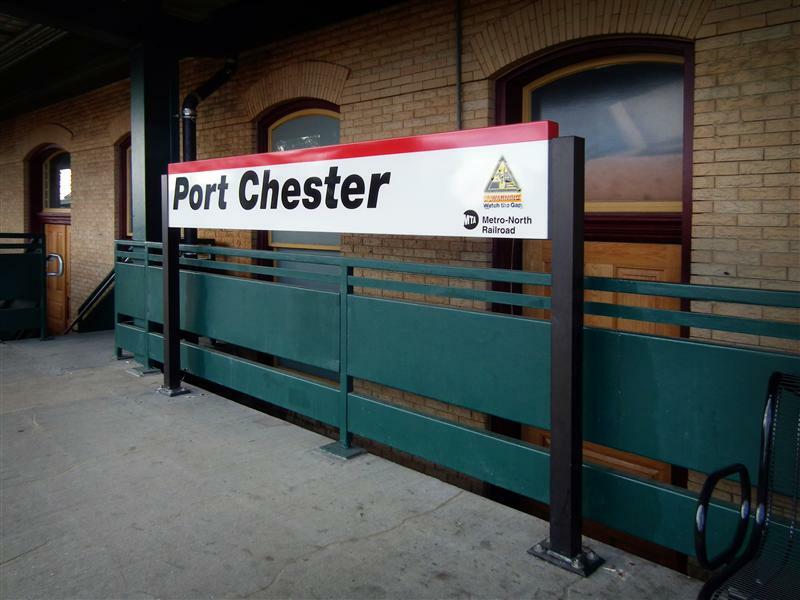 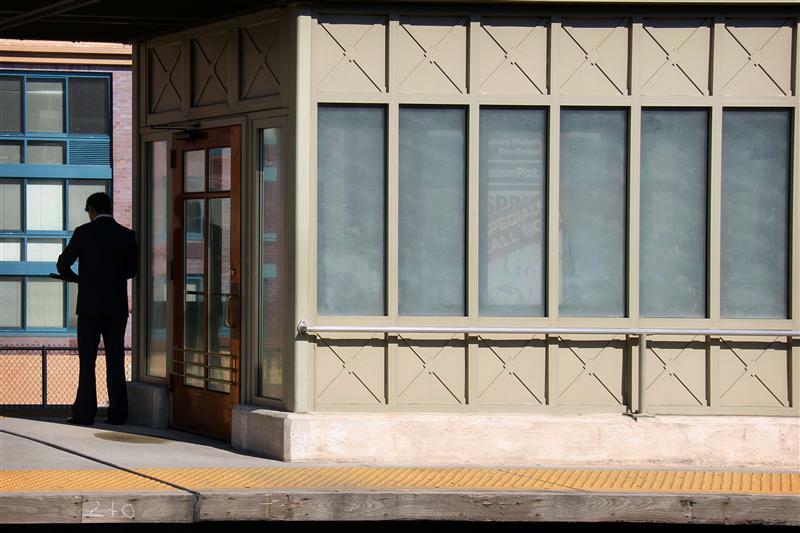 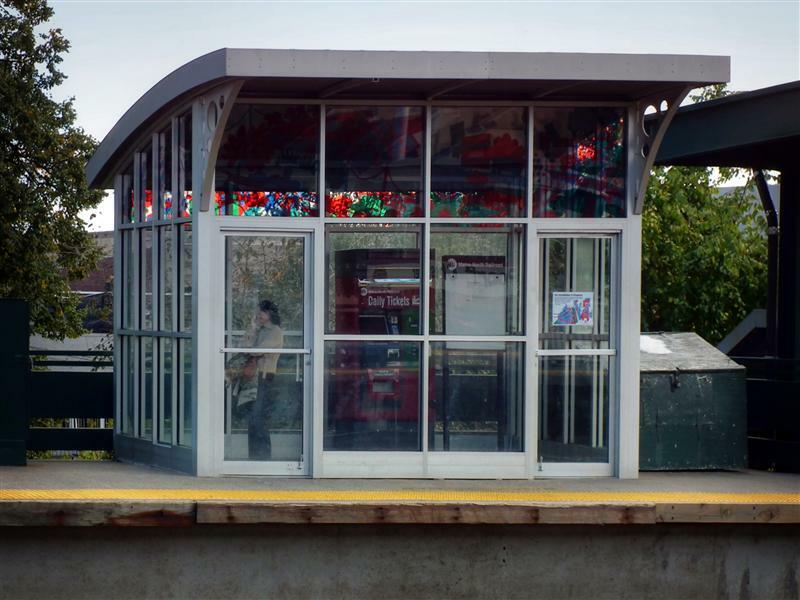 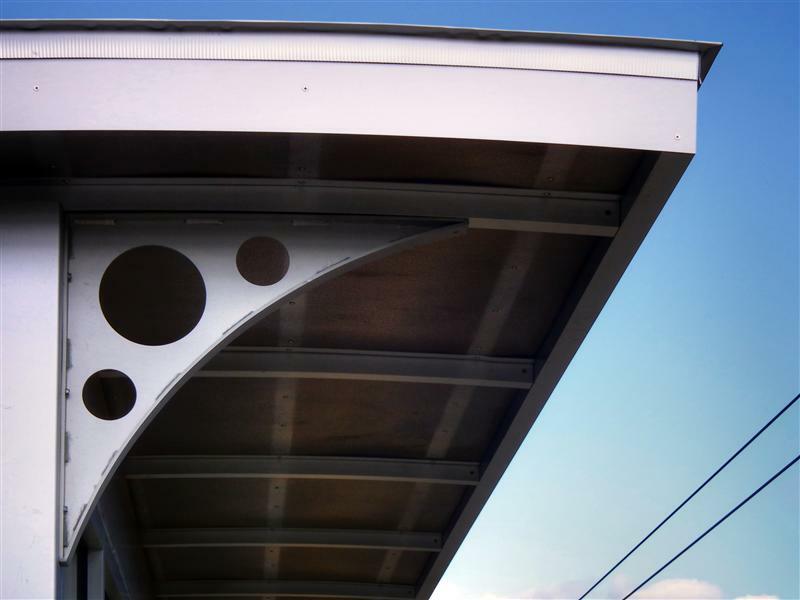 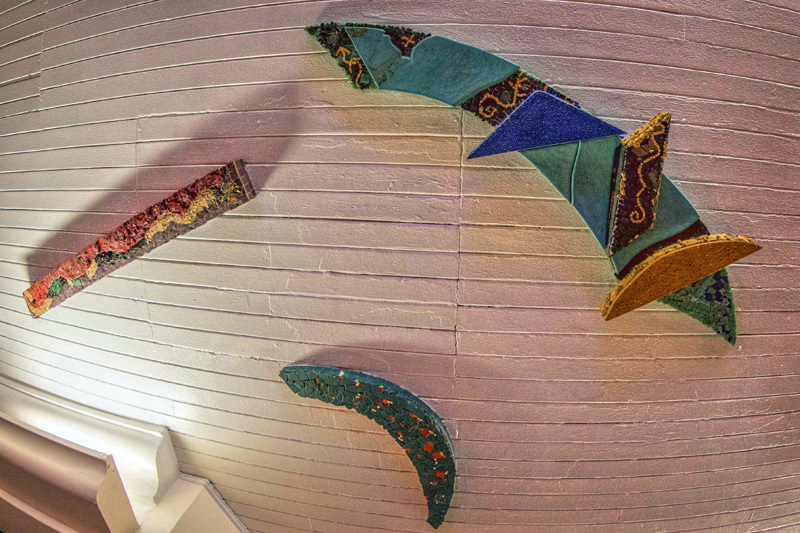 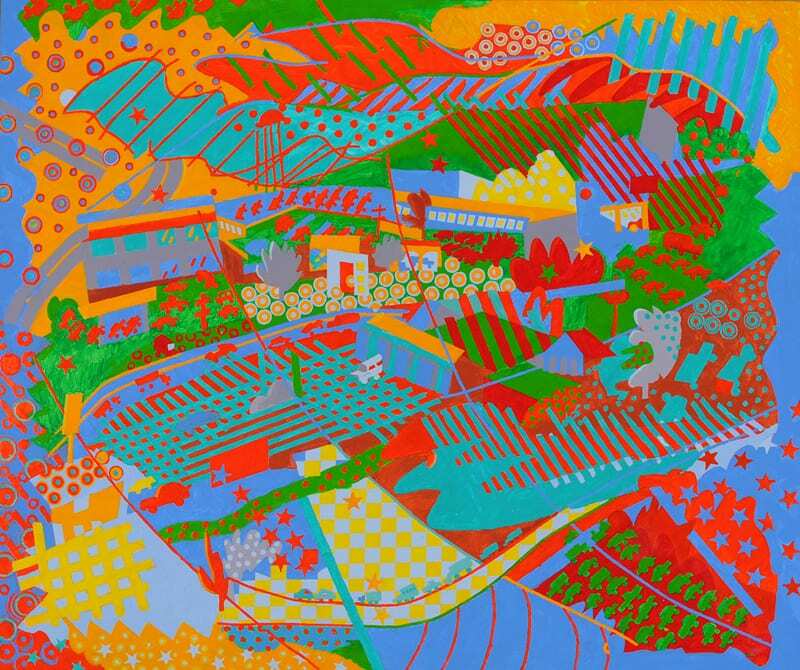 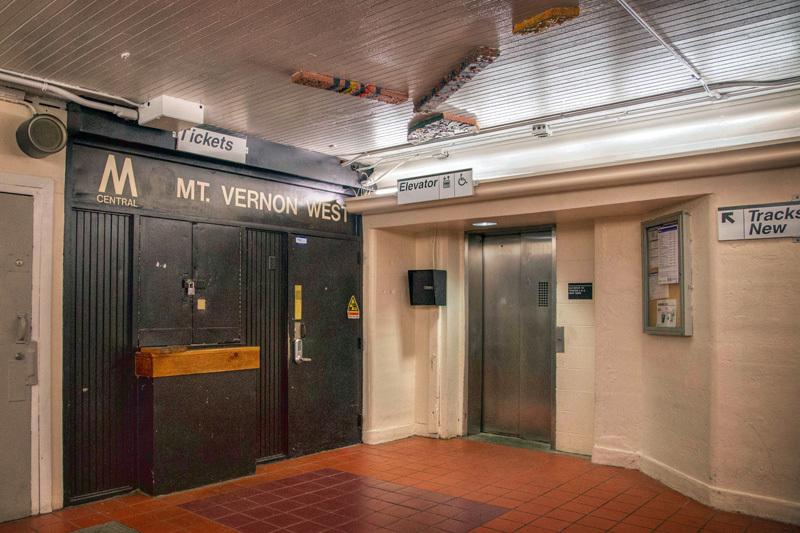 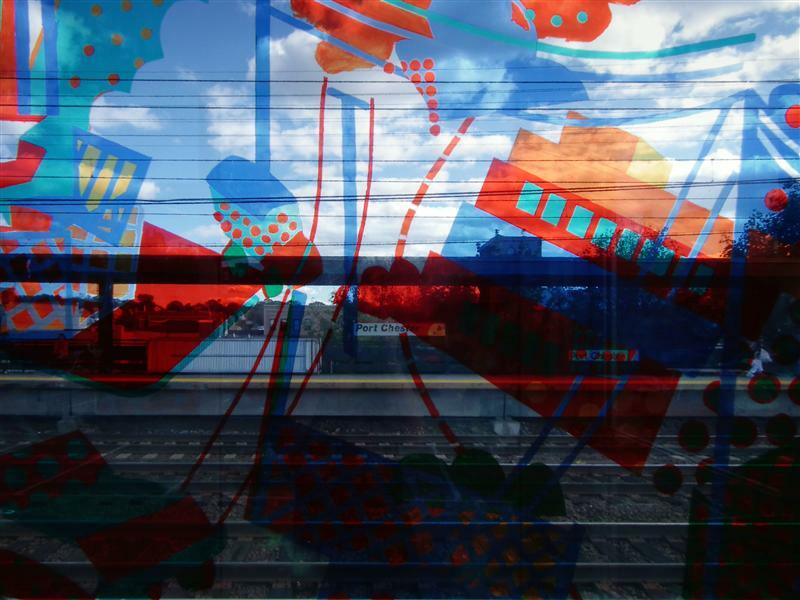 Taylor isn’t a stranger to Metro-North and Arts for Transit – she submitted a proposal for the sculpture at Wassaic station, which was ultimately not selected (the piece by Anne Huibregtse that was selected was a perfect match for the station). 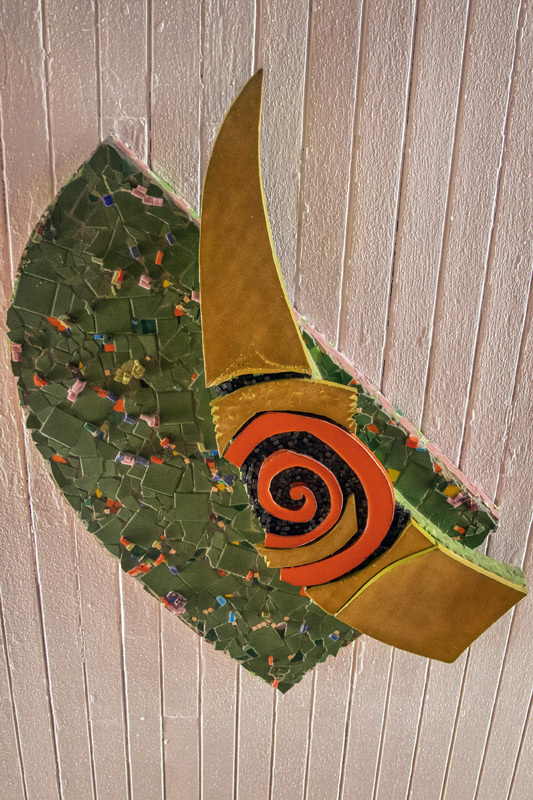 From the photos on the internet I’ve seen, the mosaic looks beautiful, however I never got a good look at it. 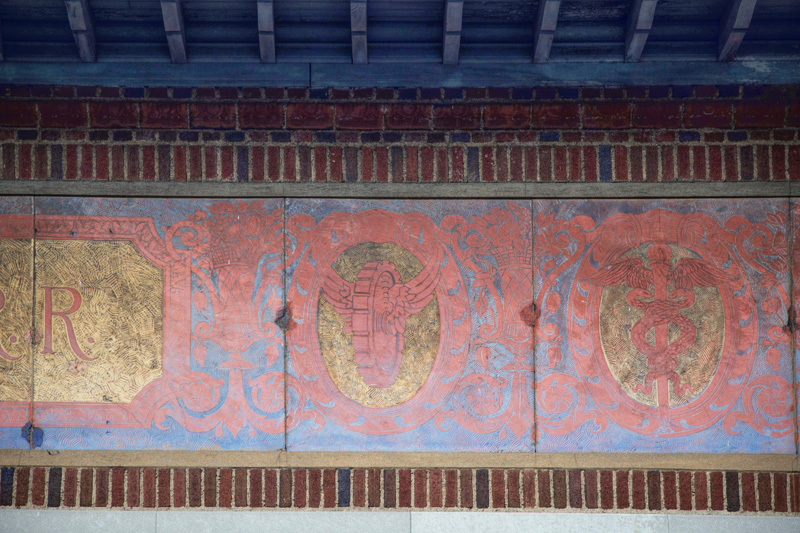 You’ll find a single photo of the mosaic below (taken through the window of the locked station), along with the rest of my photos from Larchmont station.